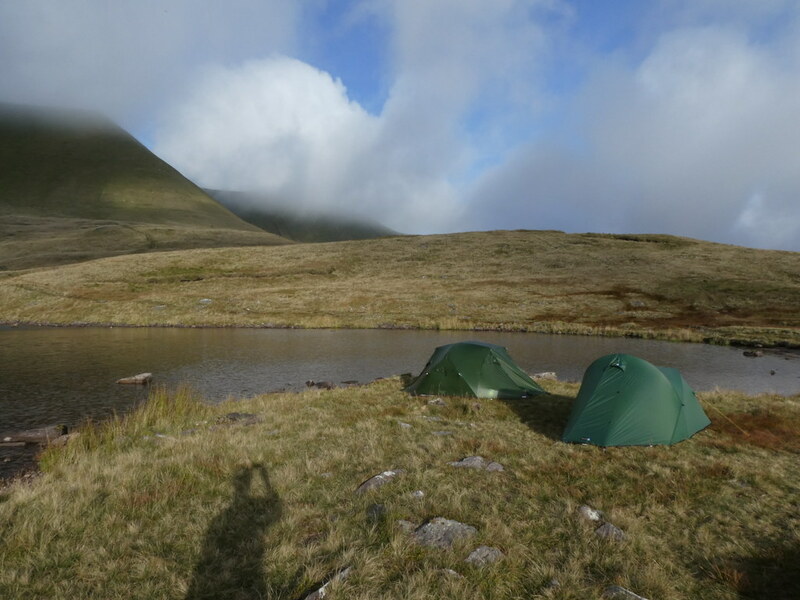 TJF was off at a sleepover with a friend so the Mountain triumvirate of me TJS and TBF planned a proper day out. 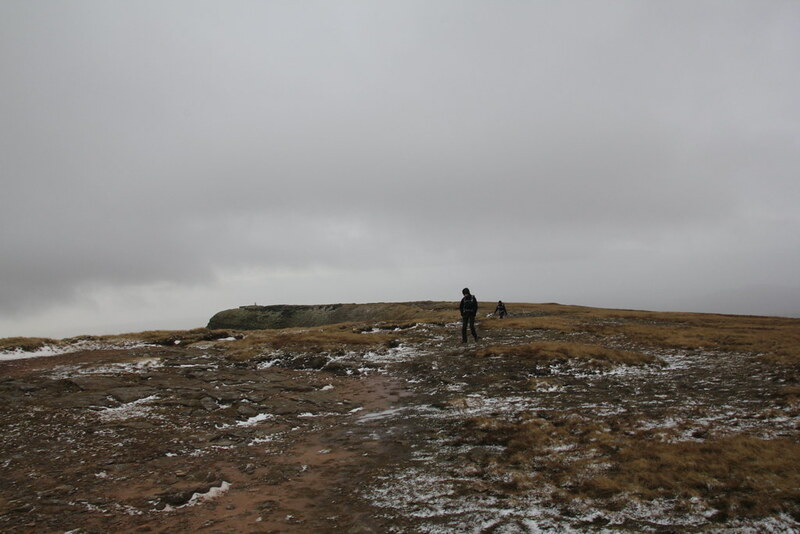 Alas the forecast wasn’t great and we were in the midst of some seriously stormy weather. 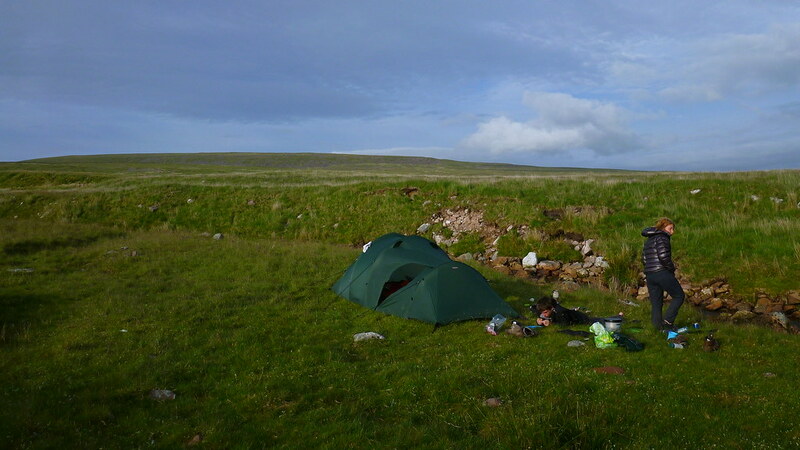 So stormy in fact that it ripped up most of my back garden fence and picked up our trampoline and threw it over a 8 foot fence and several hundred yards into the field next door. 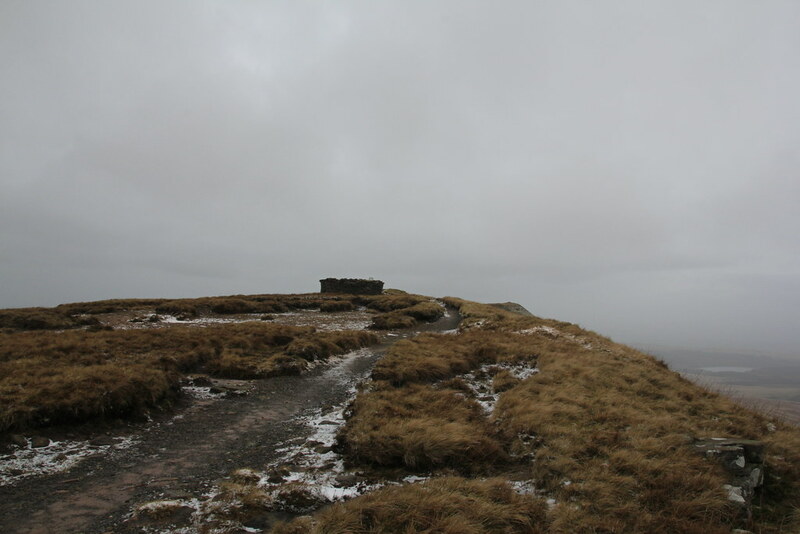 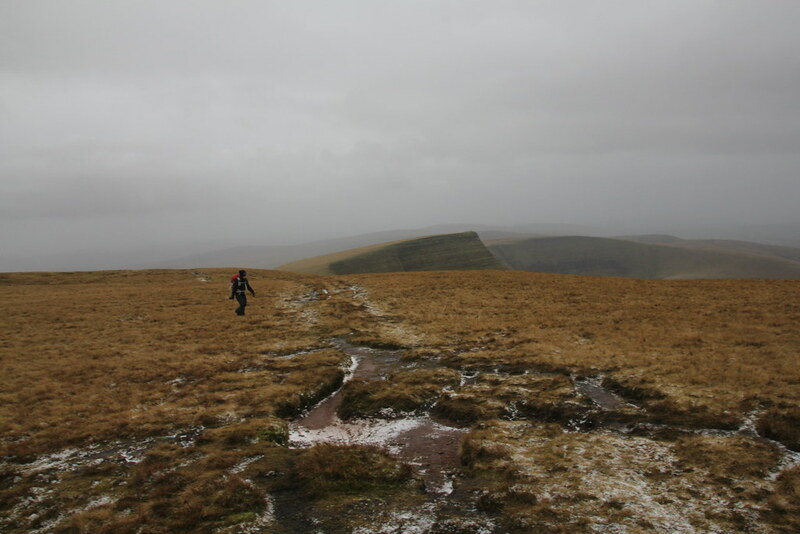 So, ideal conditions for a walk in the Black Mountain. 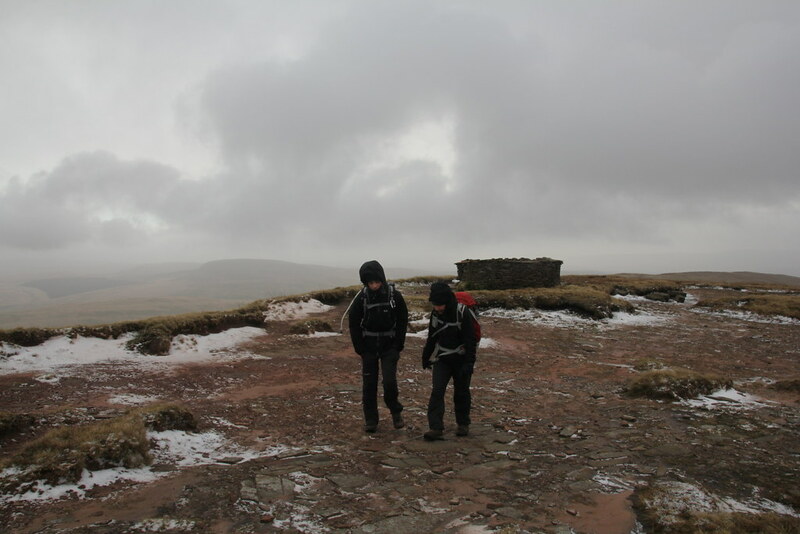 A blistering pace was needed to avoid the next battering and to keep warm. 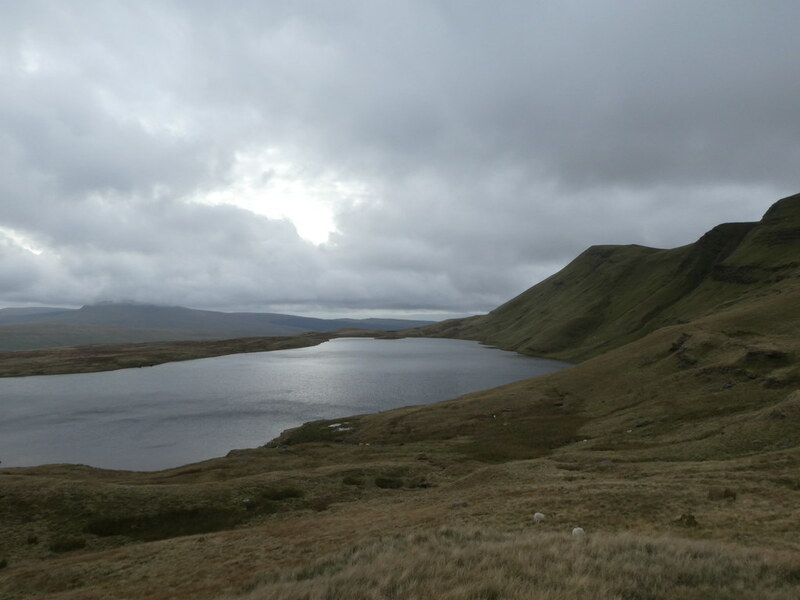 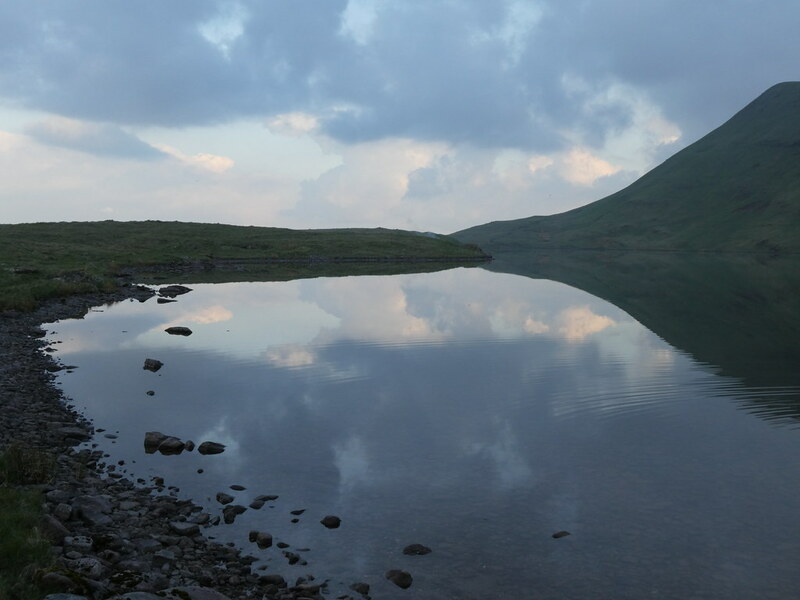 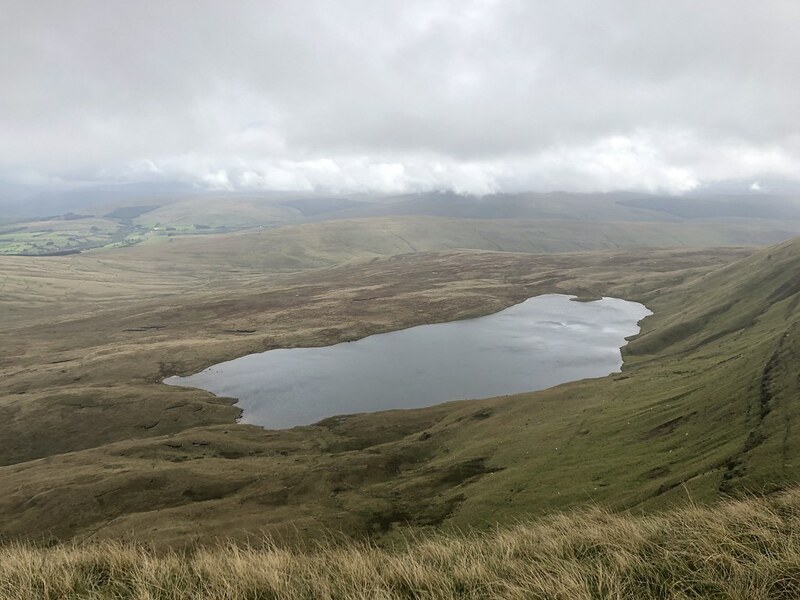 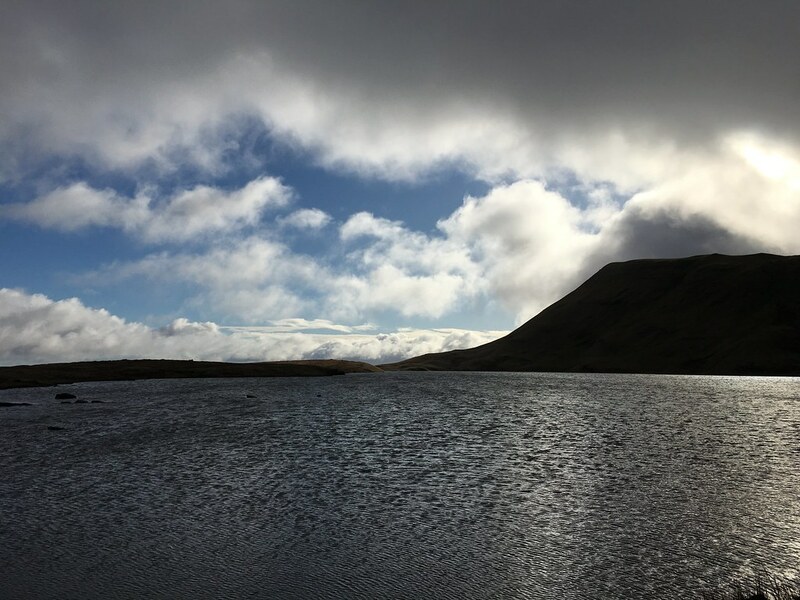 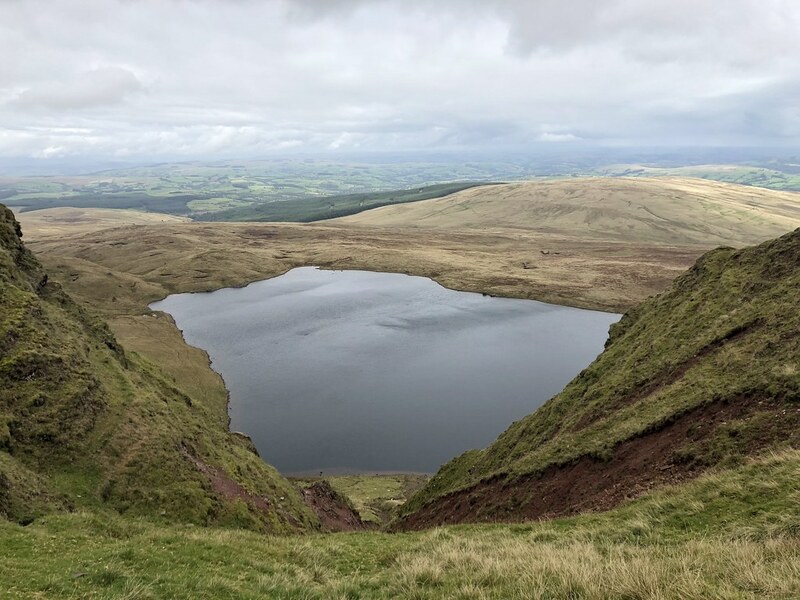 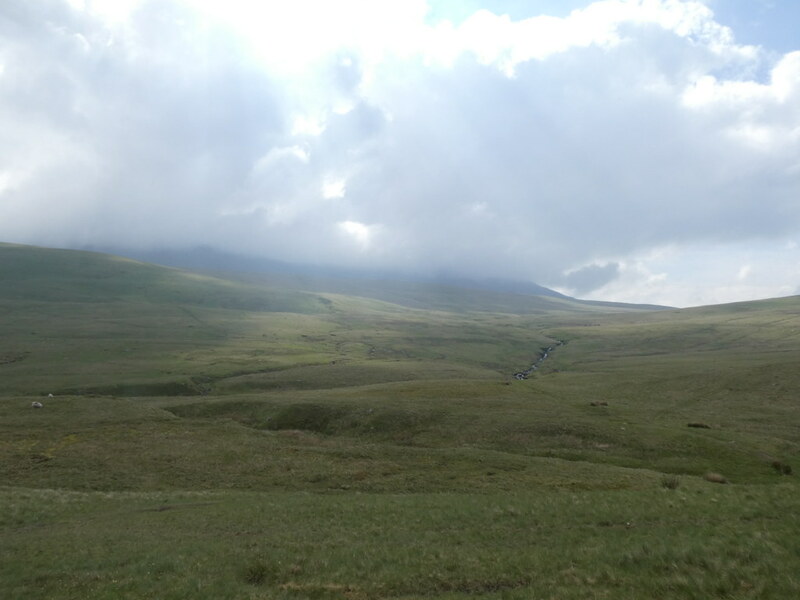 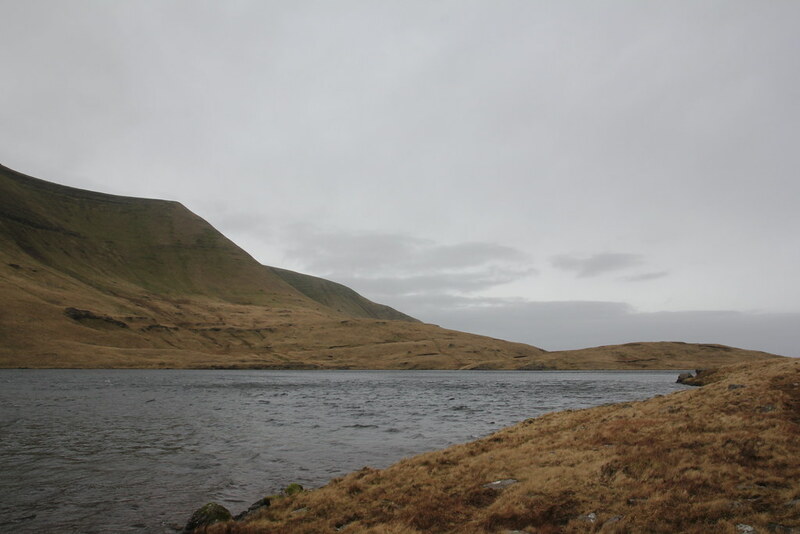 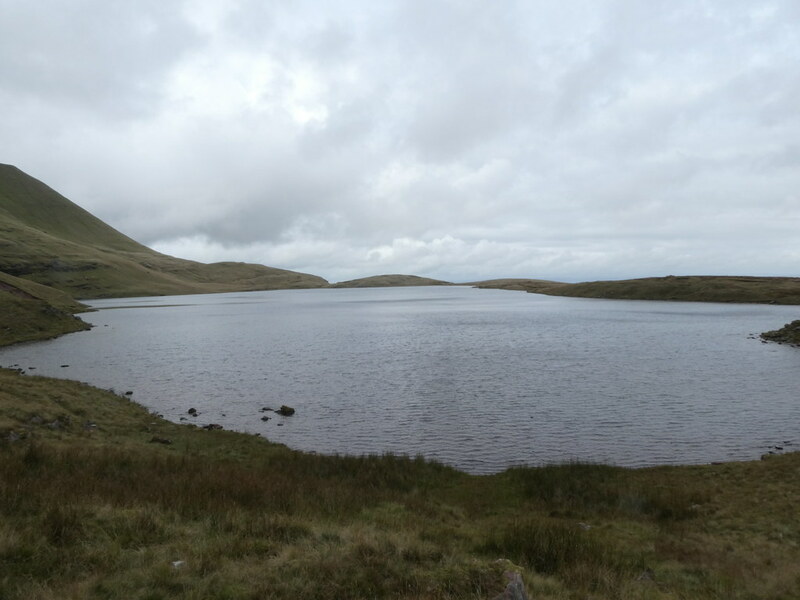 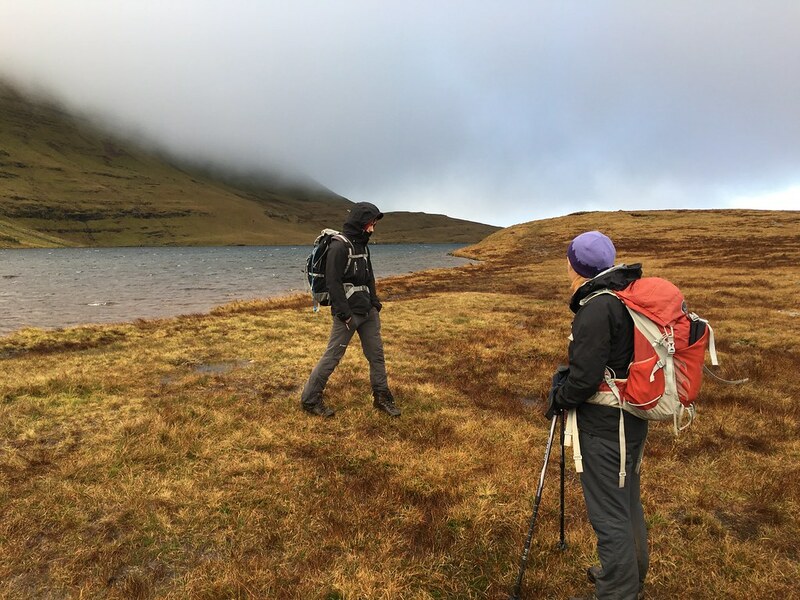 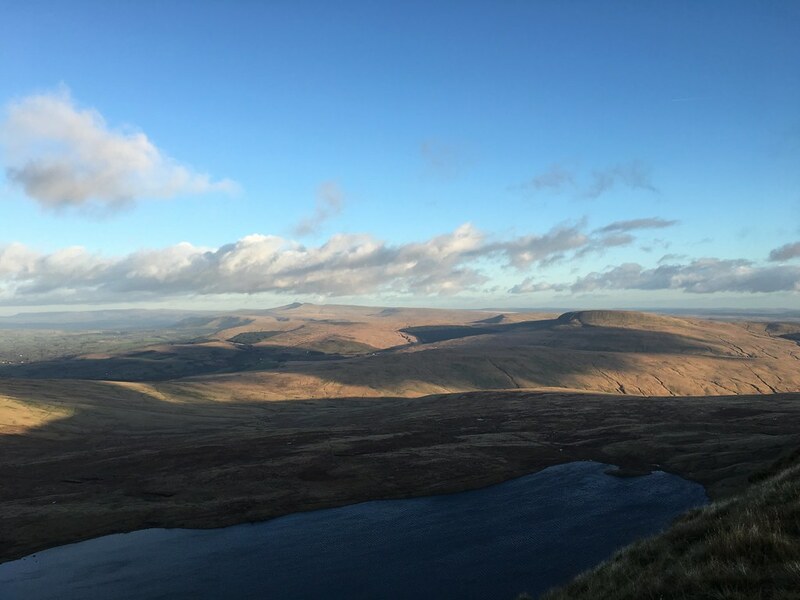 The plod up to Llyn y Fan Fawr is an extremely wet one, TBF regretting not having bought new boots to replace the one’s with holes in. 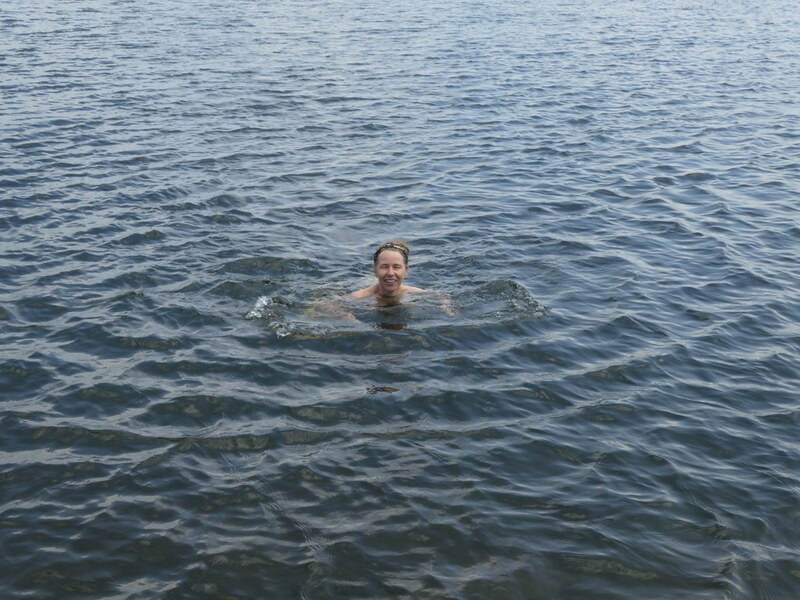 The lake is a wonderful spot and the last time I was up here it was in warm March sunshine. 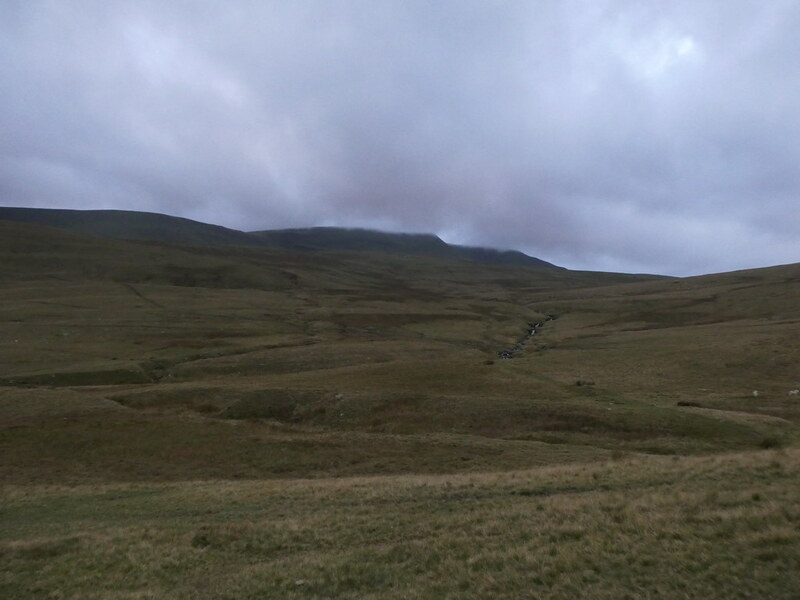 No stopping today. 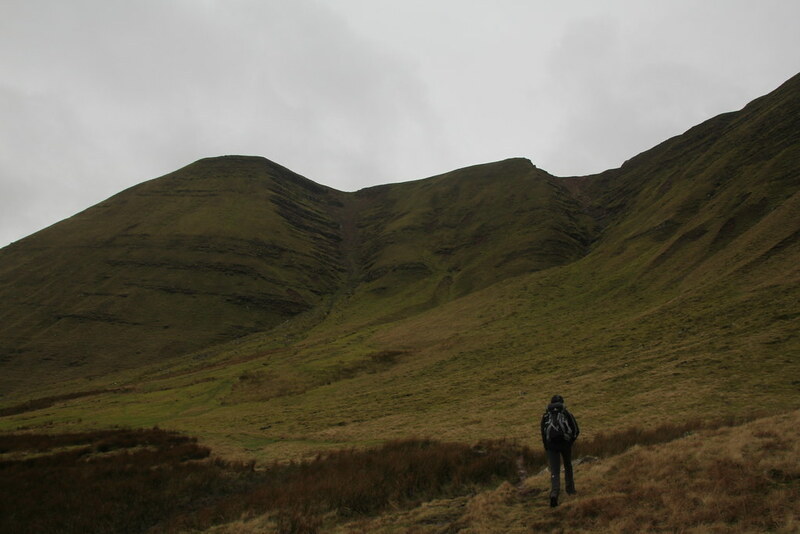 Onwards and upwards. 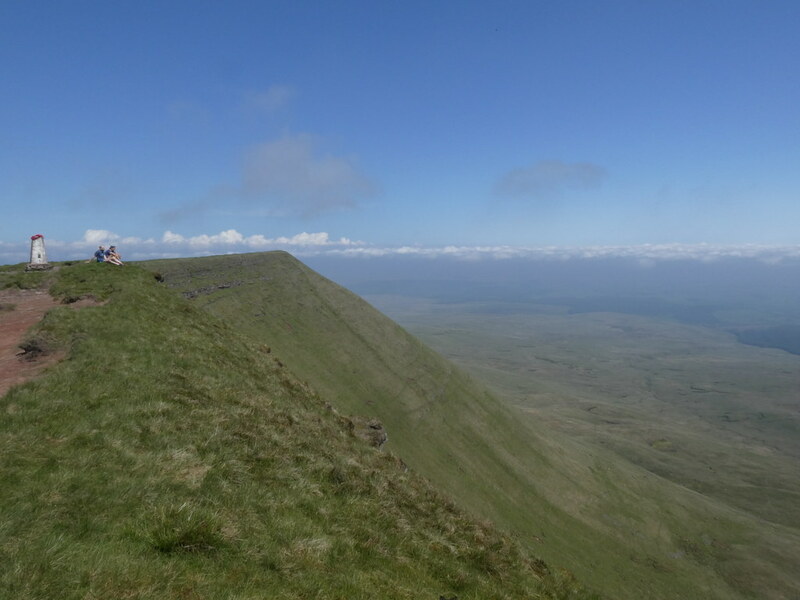 When we hit the edge of Fan Brycheiniog we hit the wind. 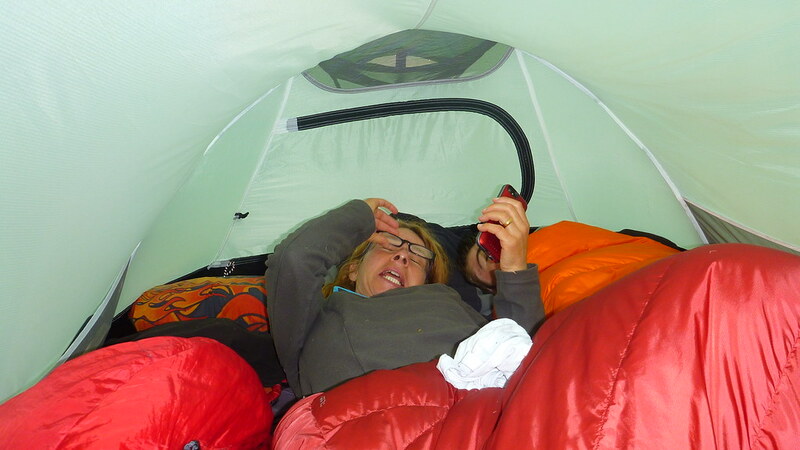 It was ferocious. 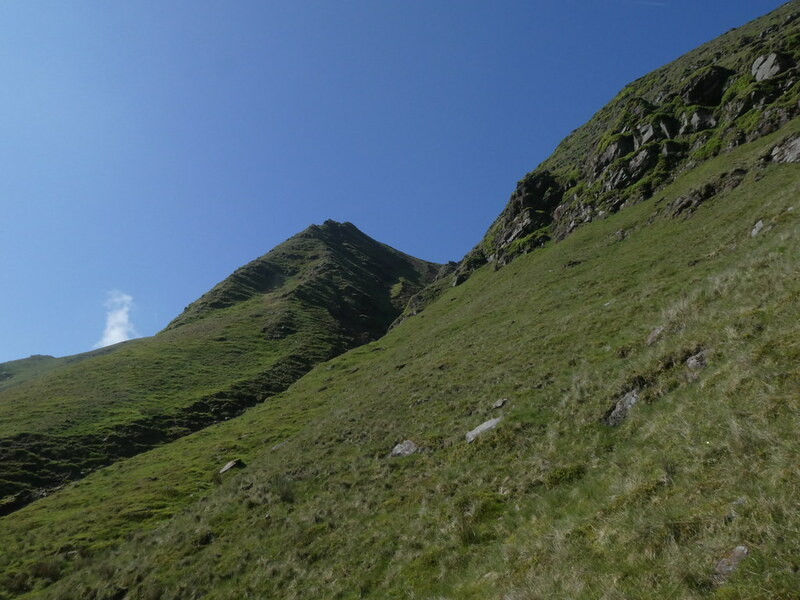 A real battle to stay upright. 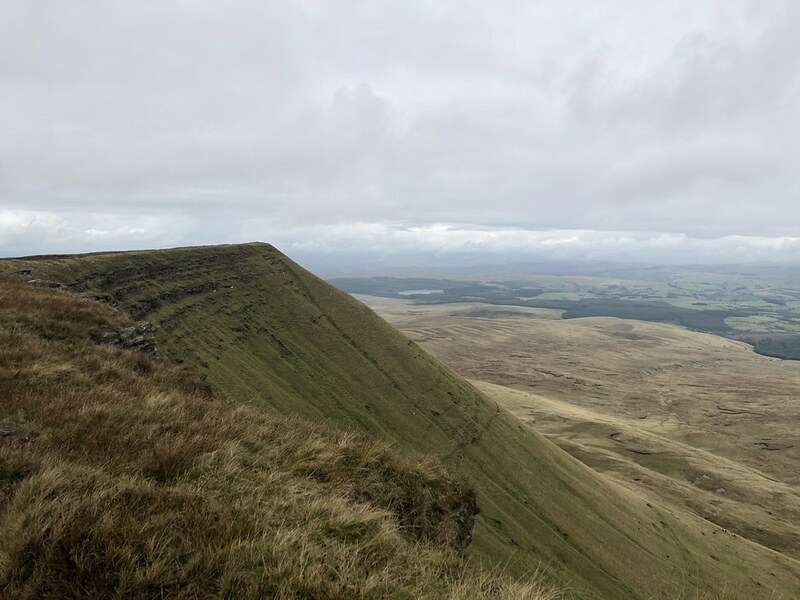 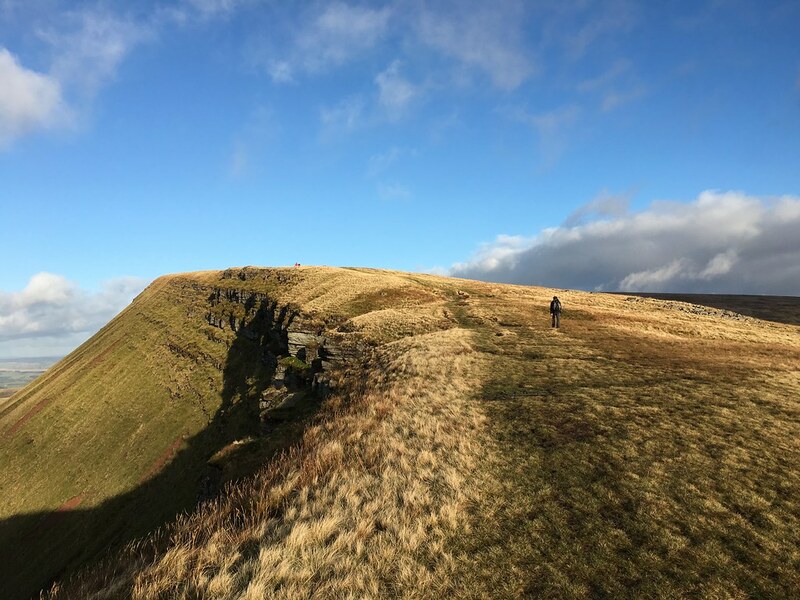 It’s hard work and a little disconcerting – the edge is quite sharp and the drop quite significant – but I love walking in a gale. 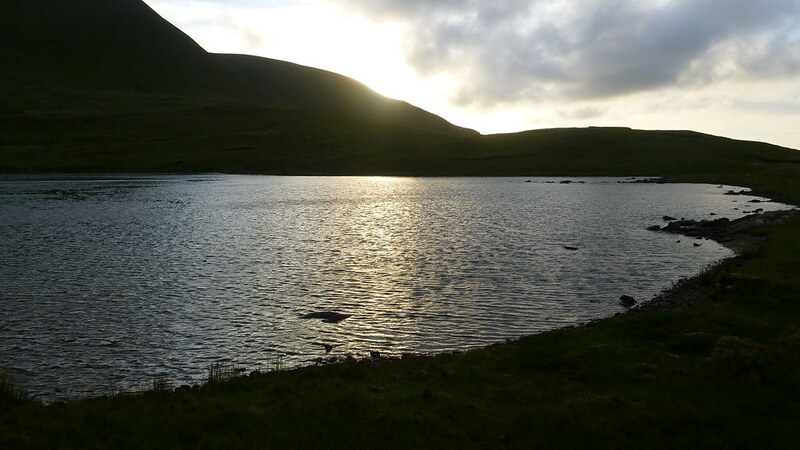 Blows the working weeks dust out from the brain and makes you feel properly alive. 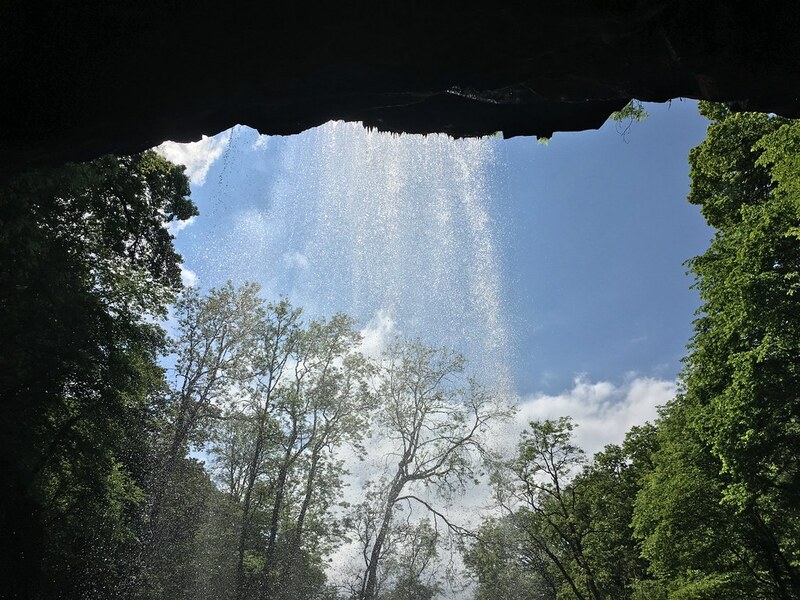 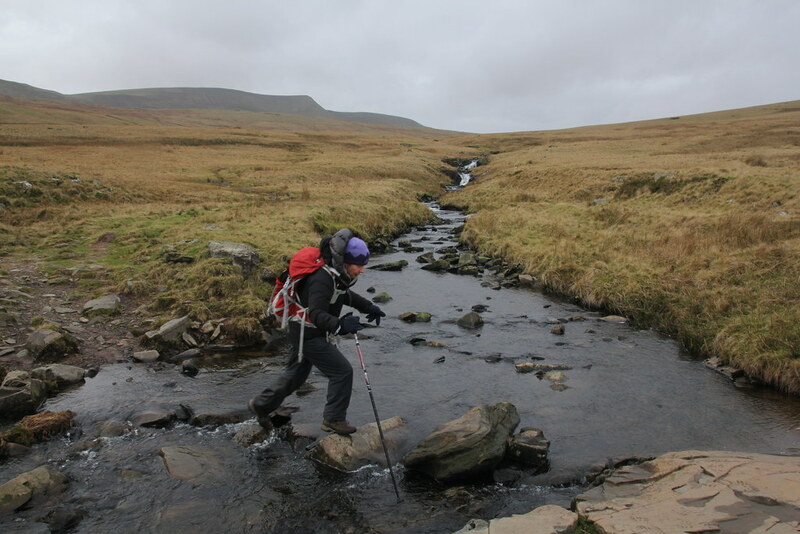 A battle with the elements is good for the soul. 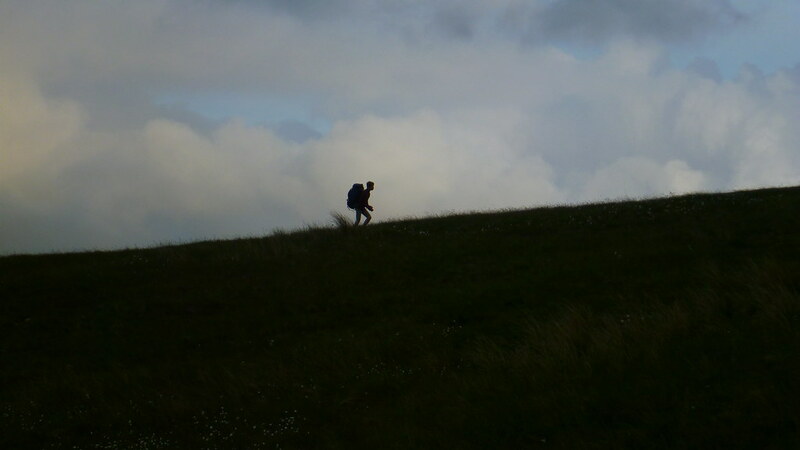 Again despite hunger we just pressed on, staying away from the edge for fear of being blown off. 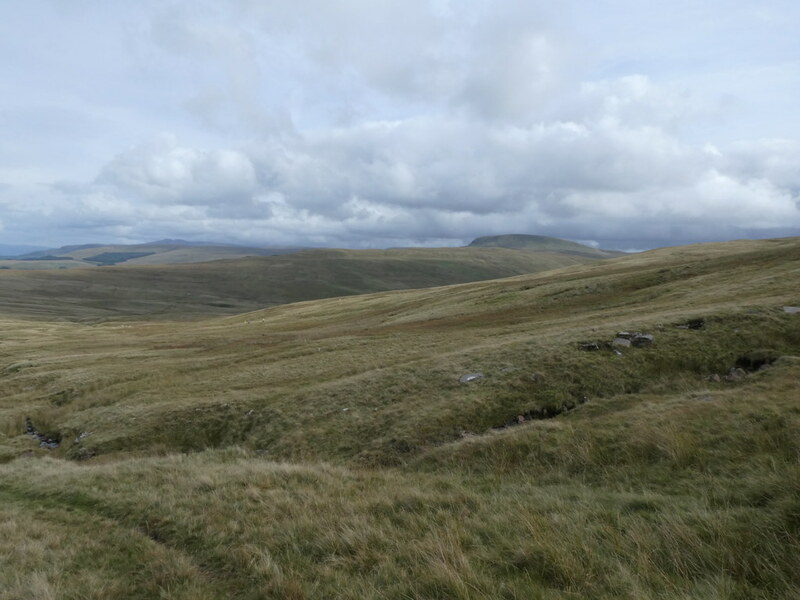 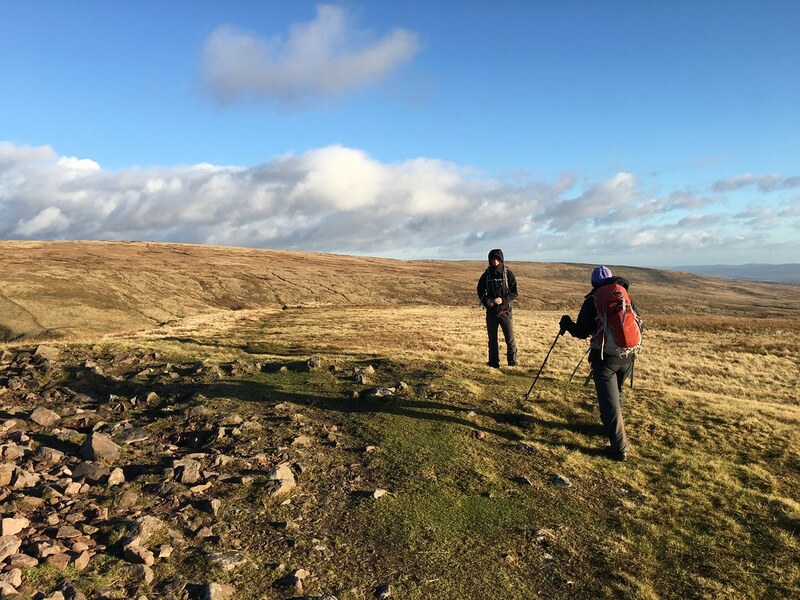 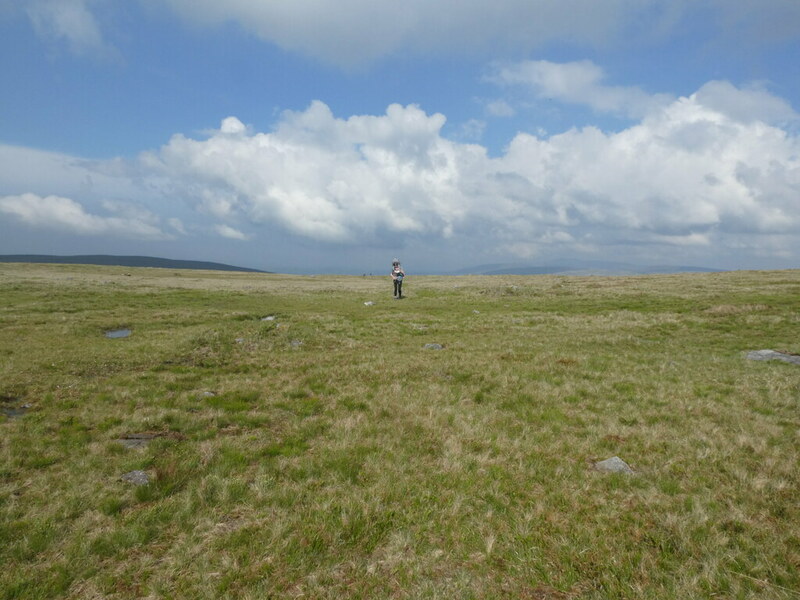 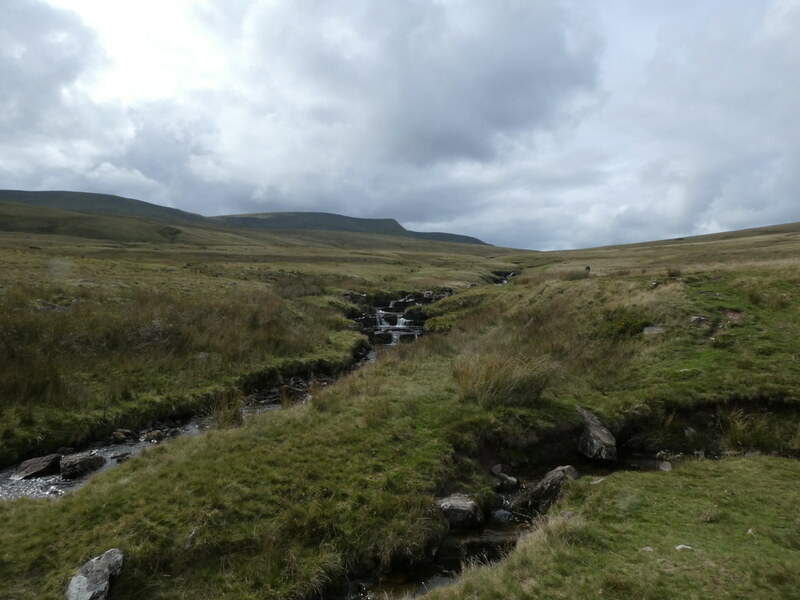 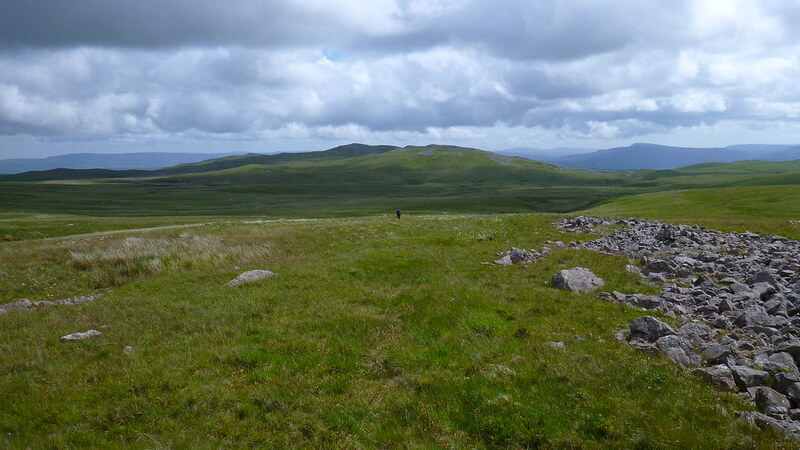 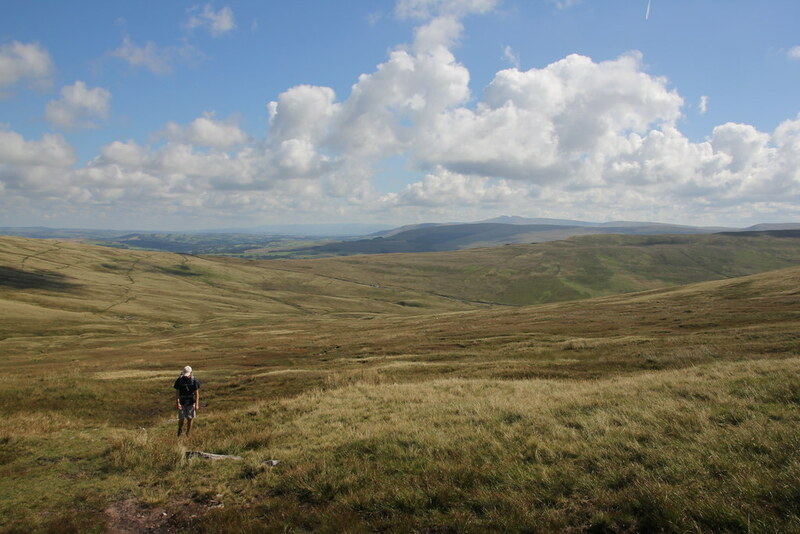 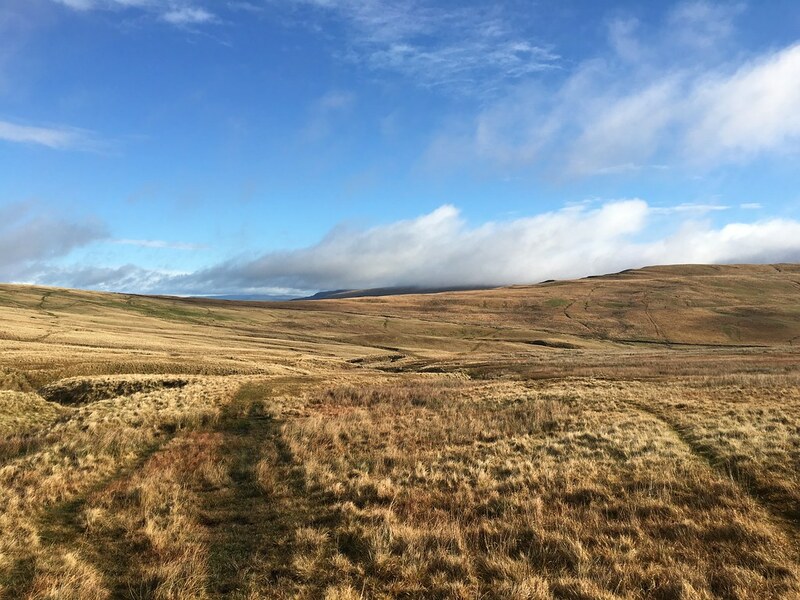 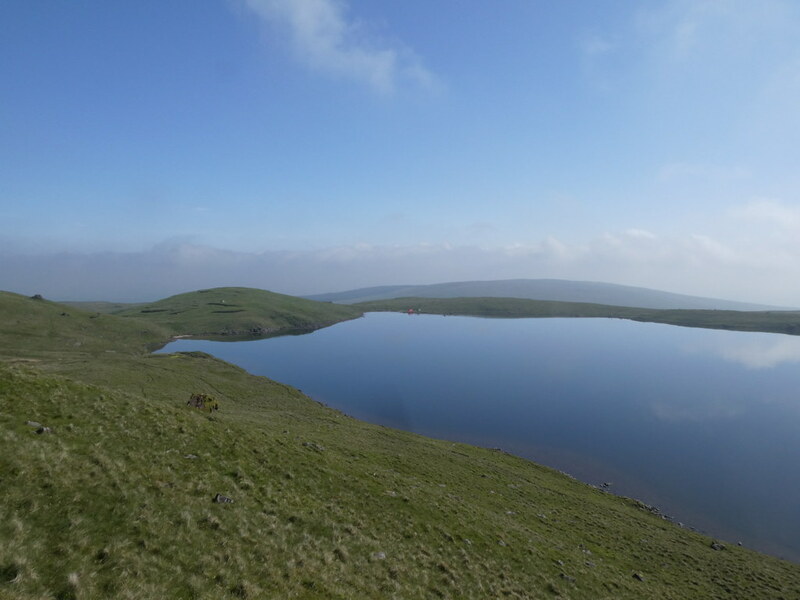 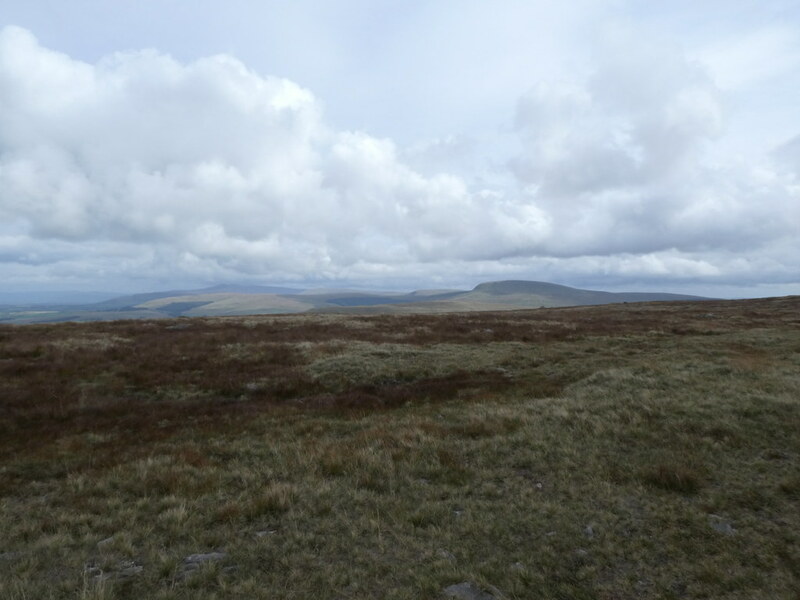 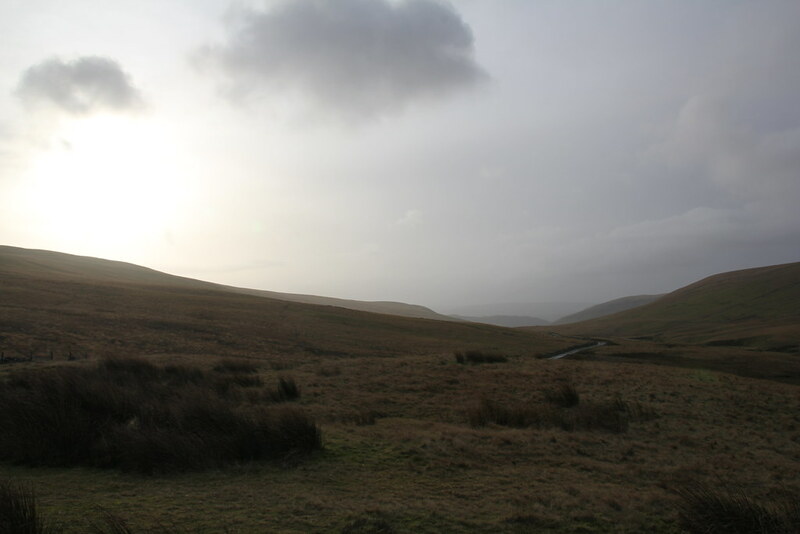 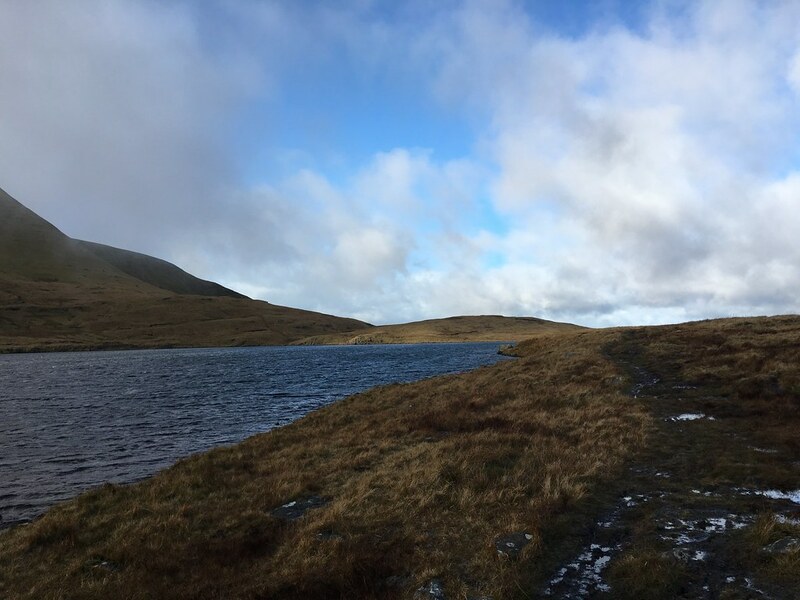 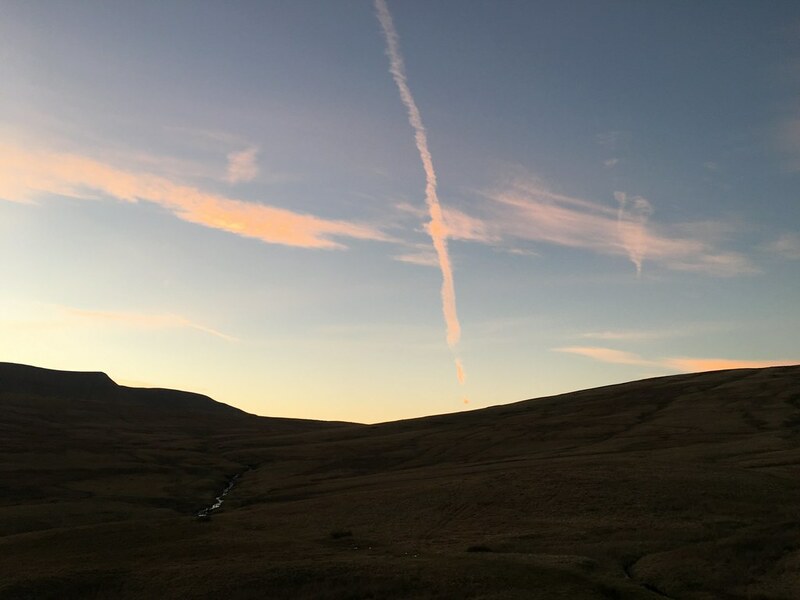 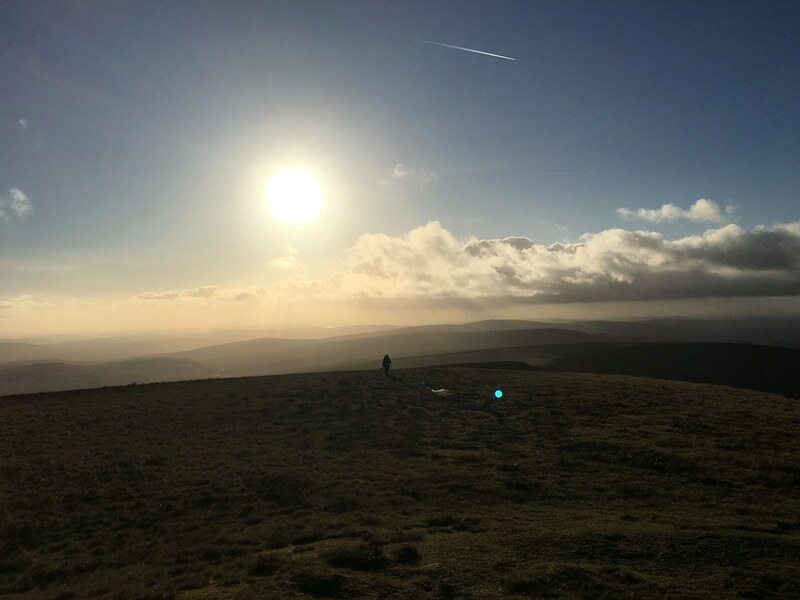 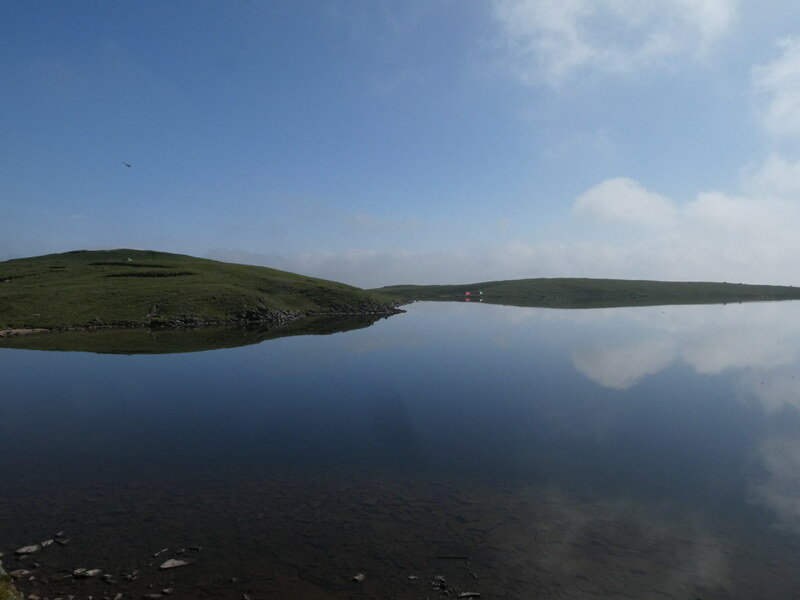 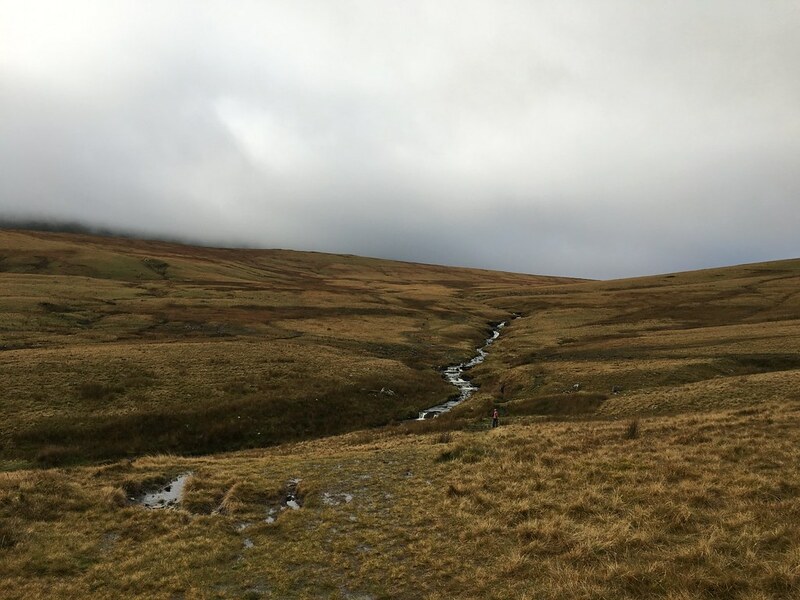 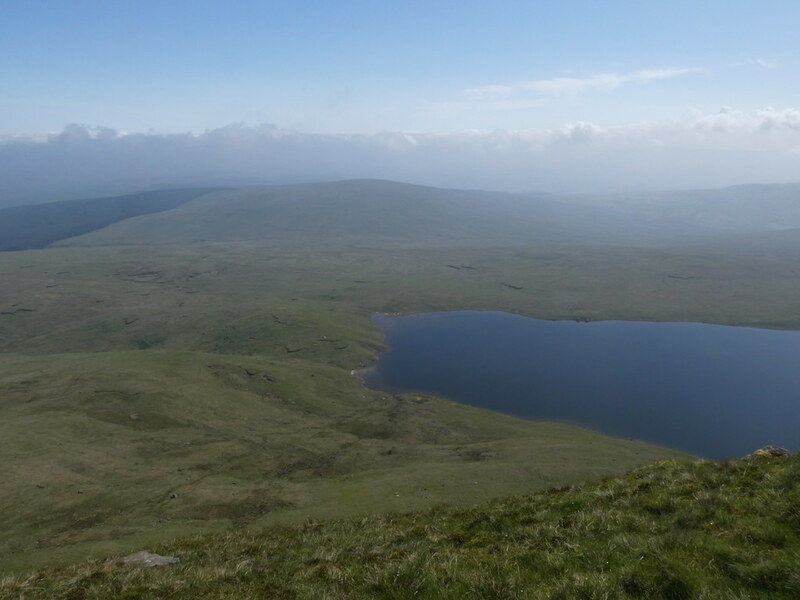 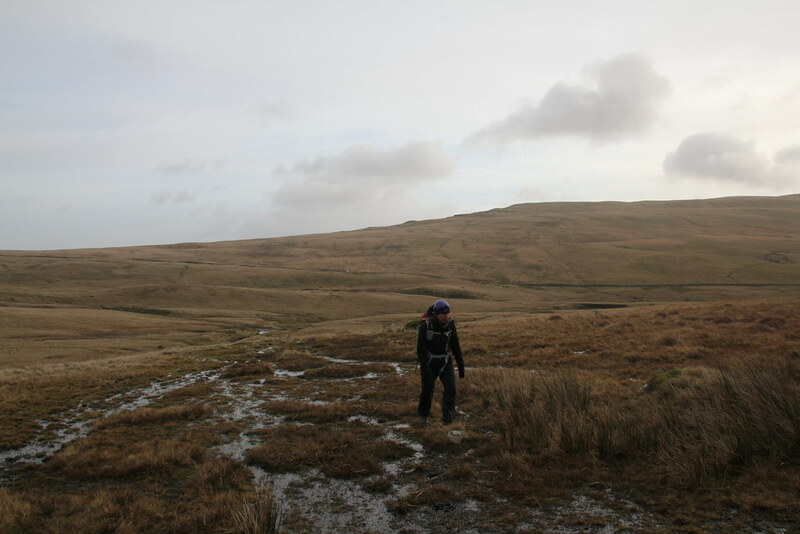 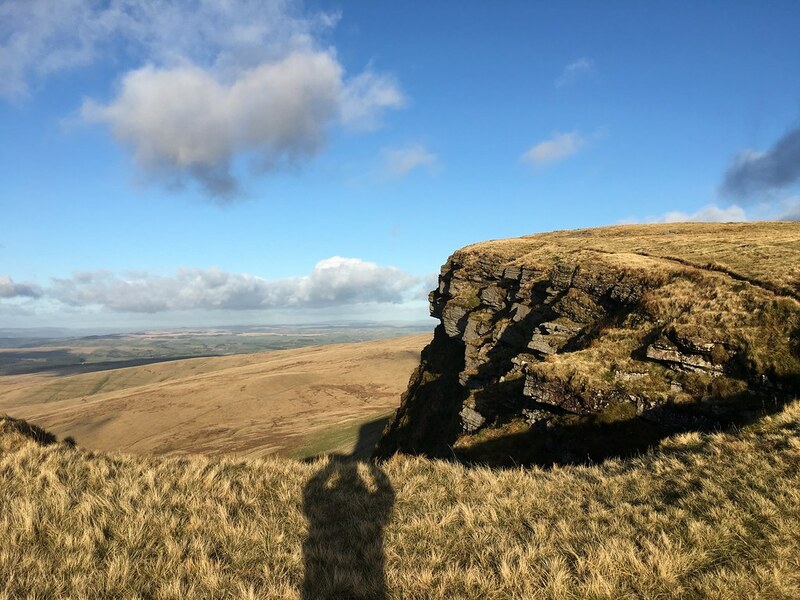 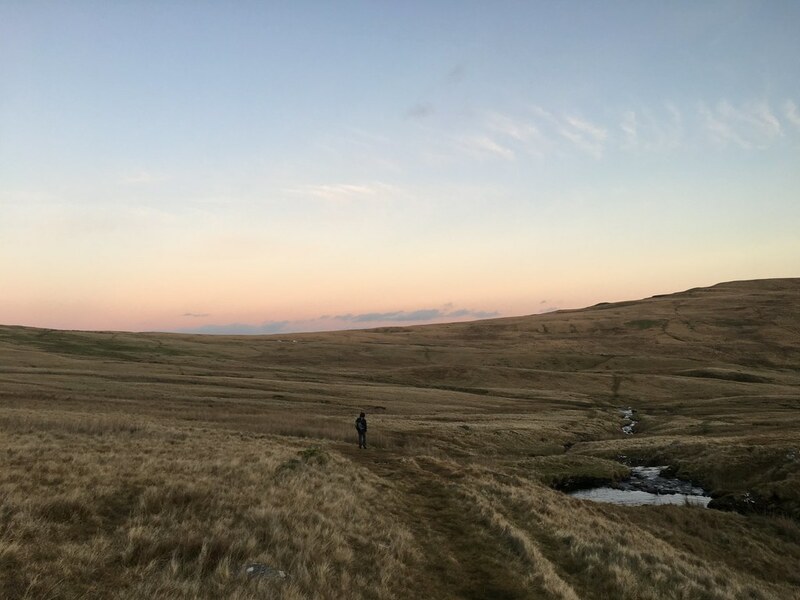 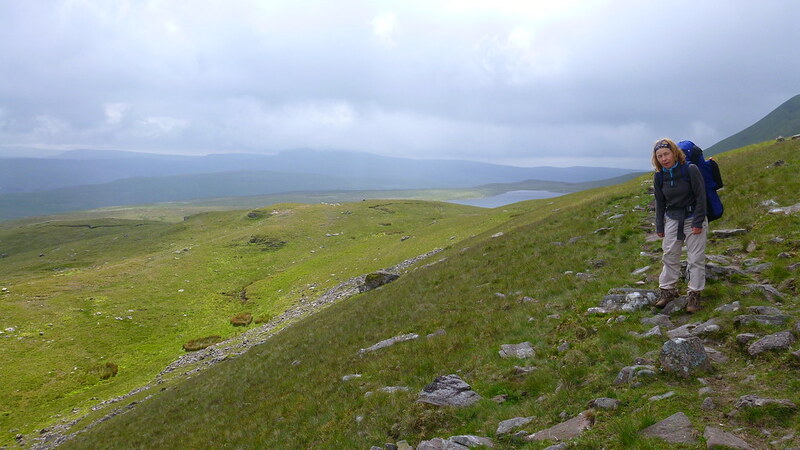 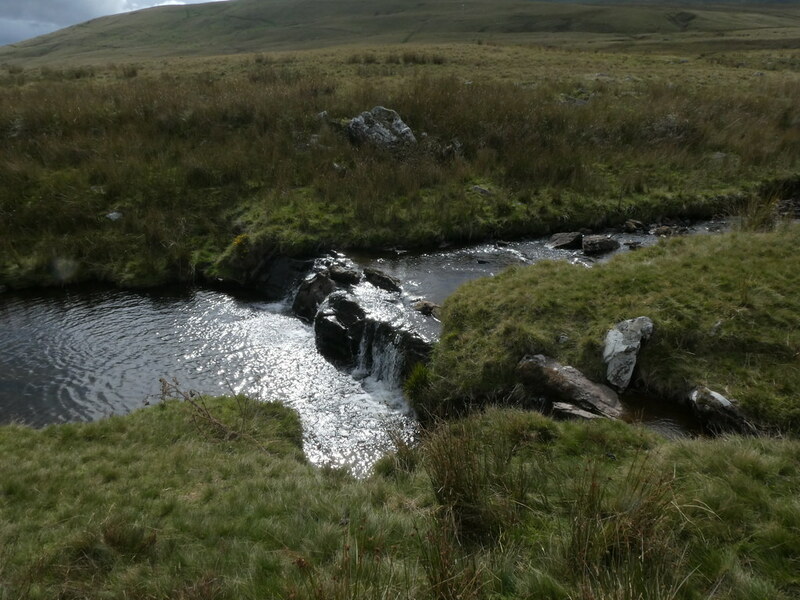 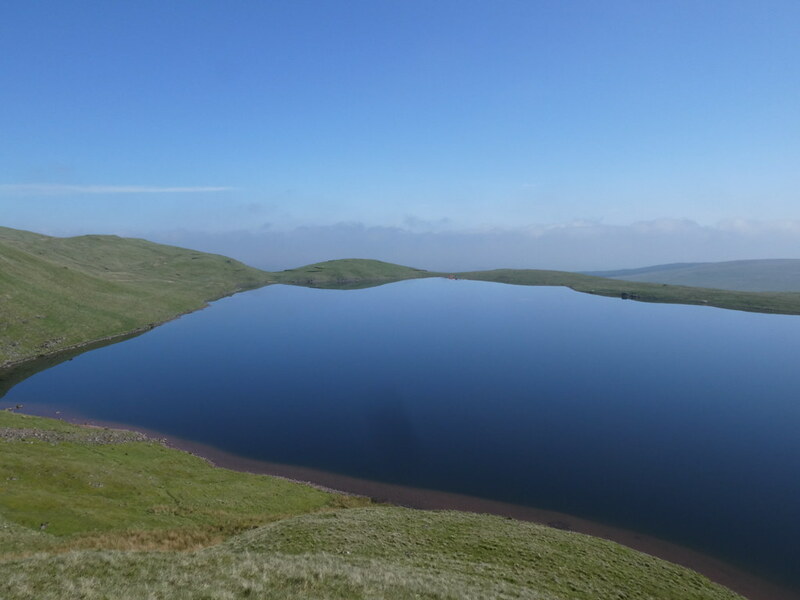 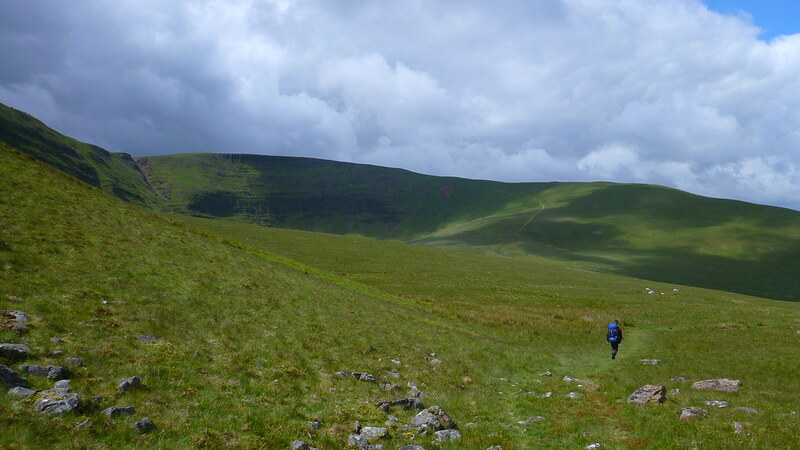 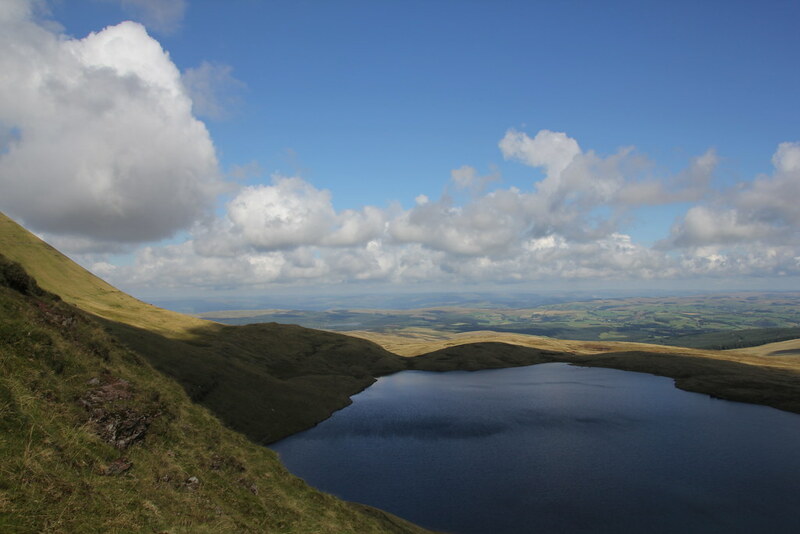 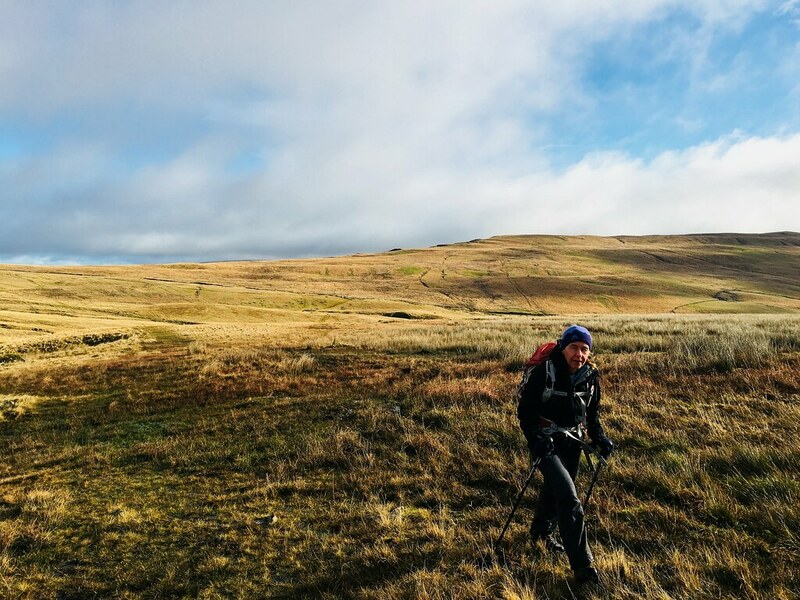 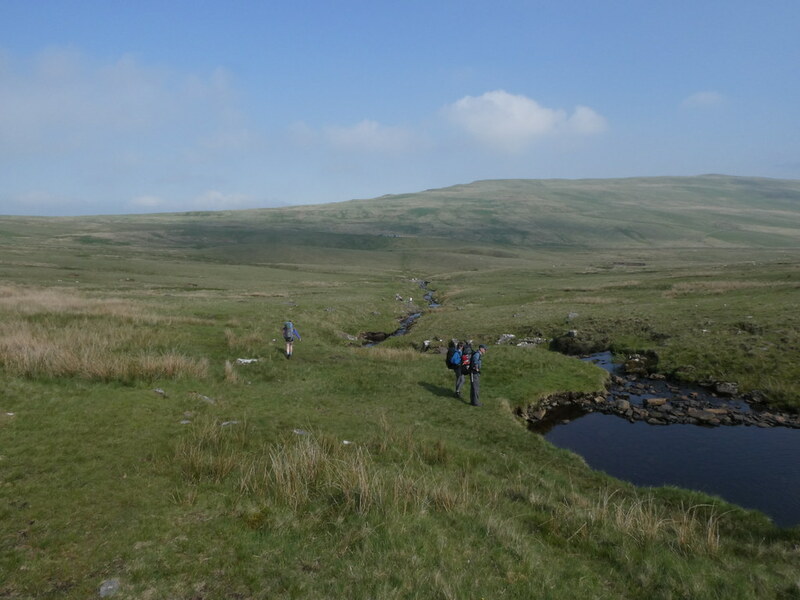 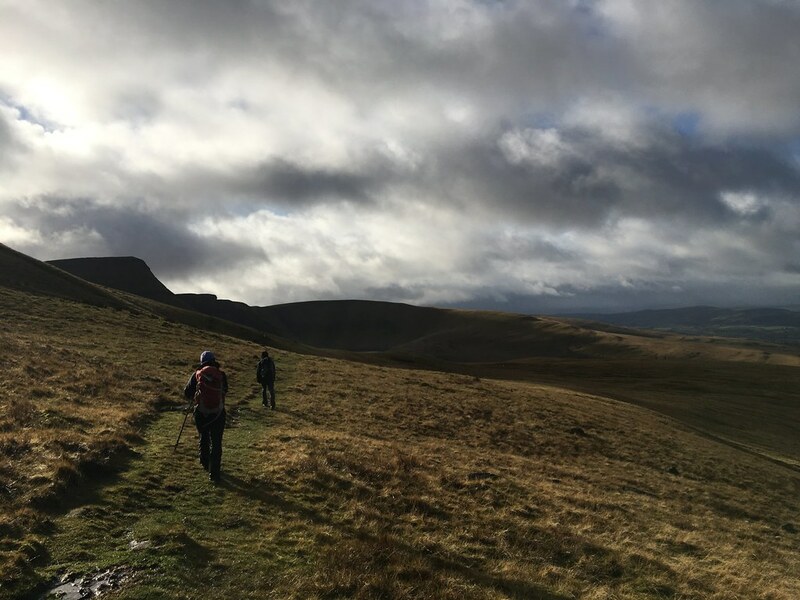 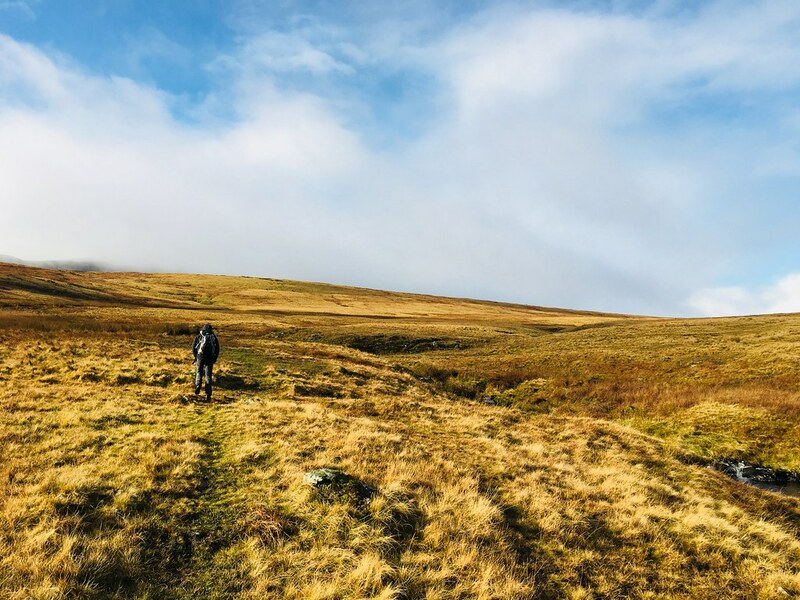 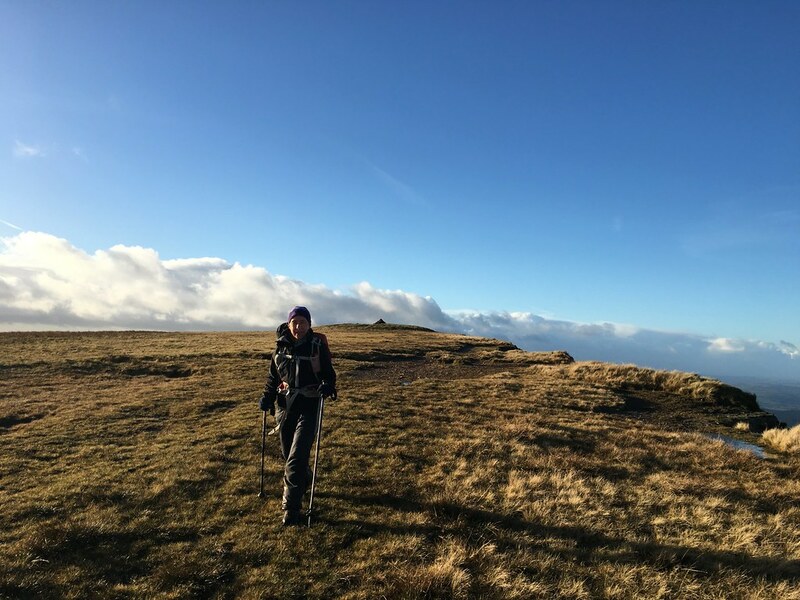 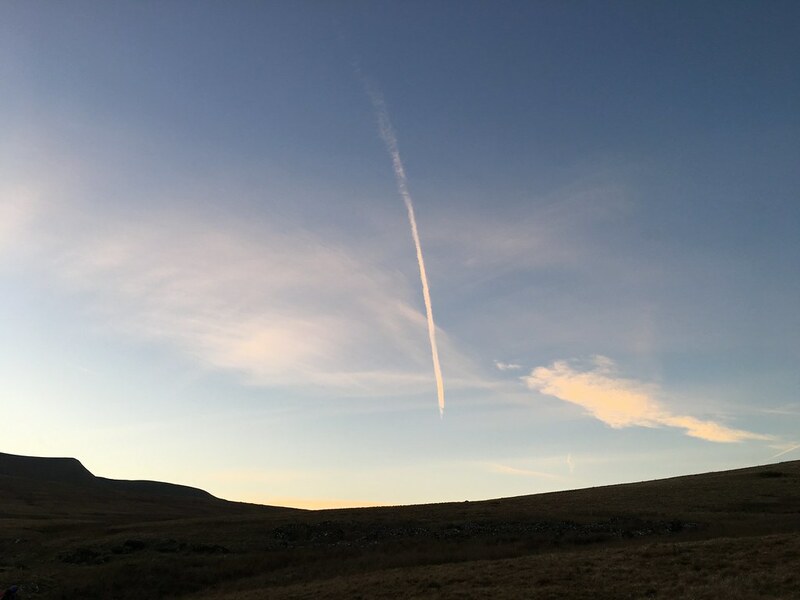 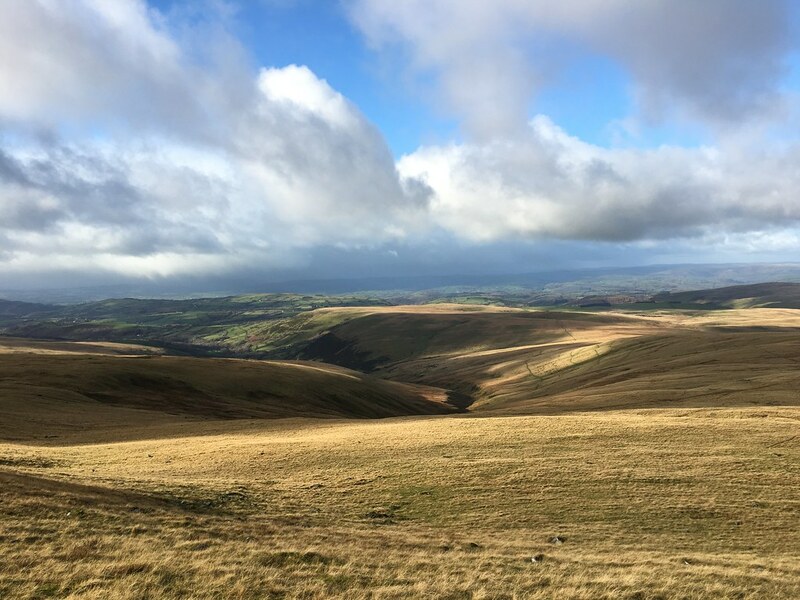 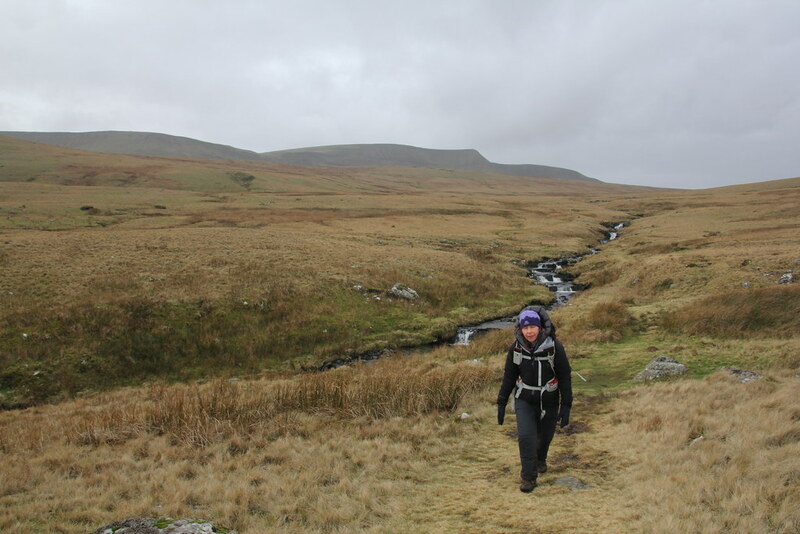 At Fan Foel we made the decision to abort the rest of the route to Bannau Sir Gaer and head down. 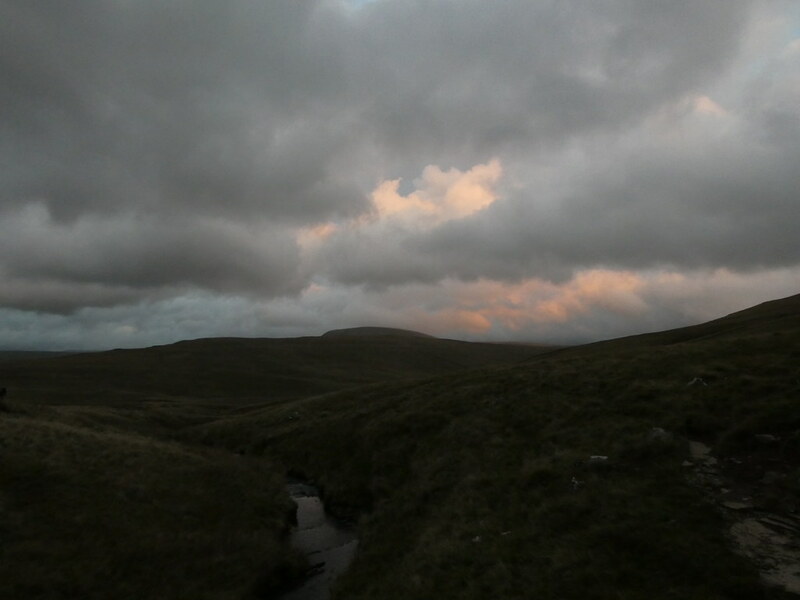 The clouds were darkening and we’d have been walking into the teeth of the gale for an hour. 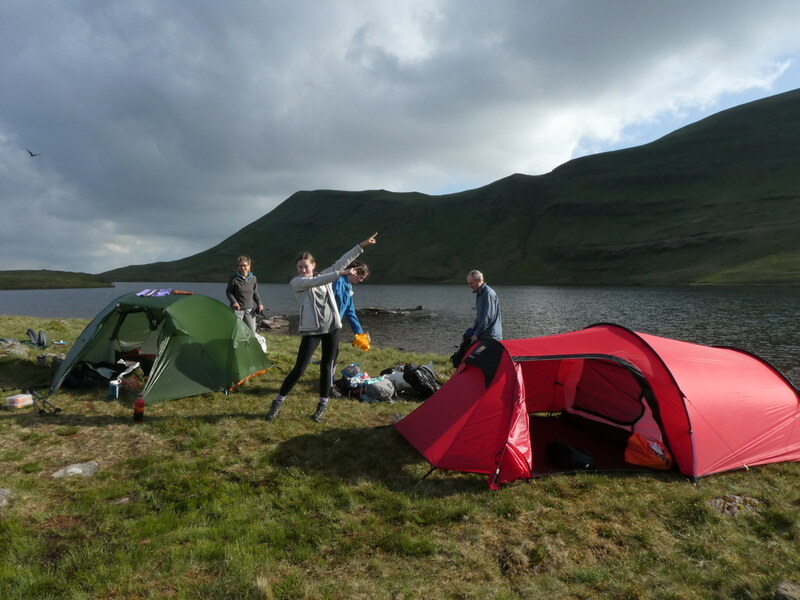 It meant an earlier finish but we had enough fun in the wind for now. 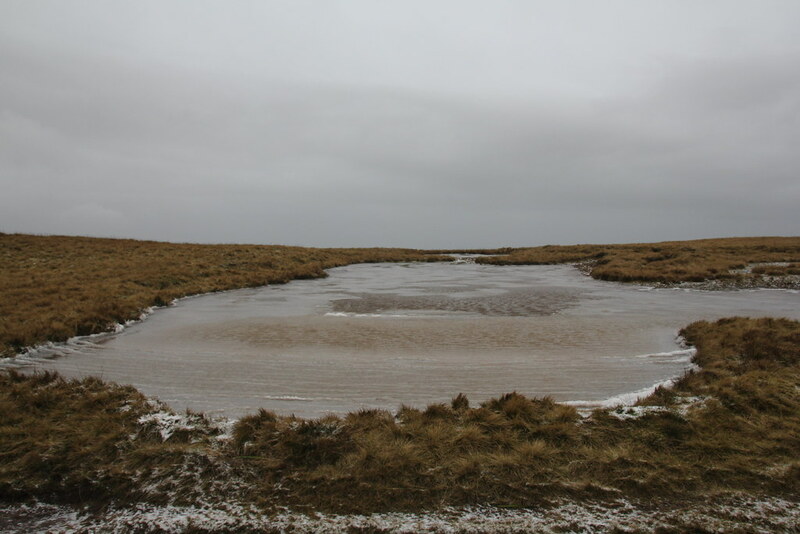 The small pools of water on the top had been blown and then frozen – a capture of small waves in action. 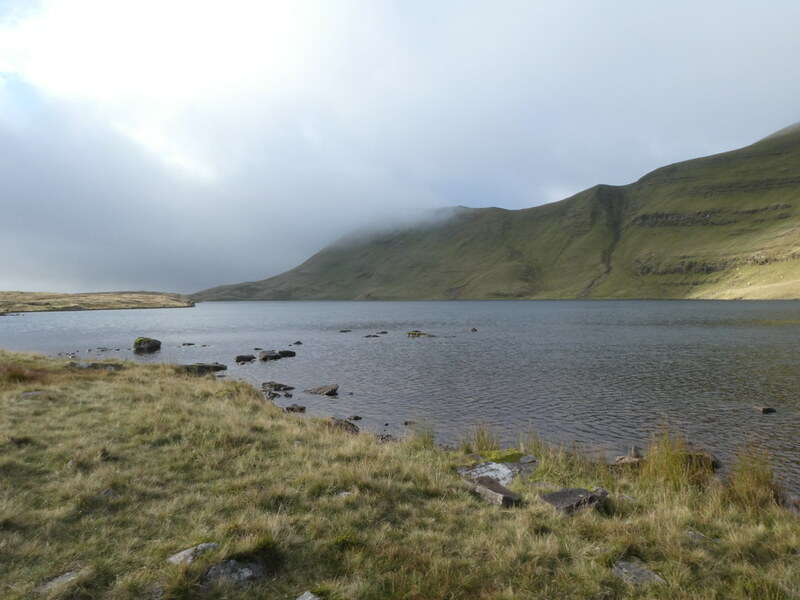 As soon as we reached the lake we were blasted by the wind again. 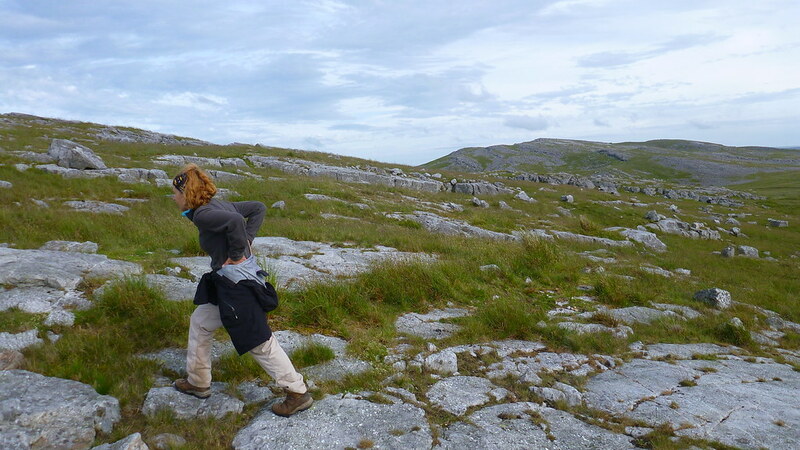 The trouble with still images is they don’t really capture how windy it is. 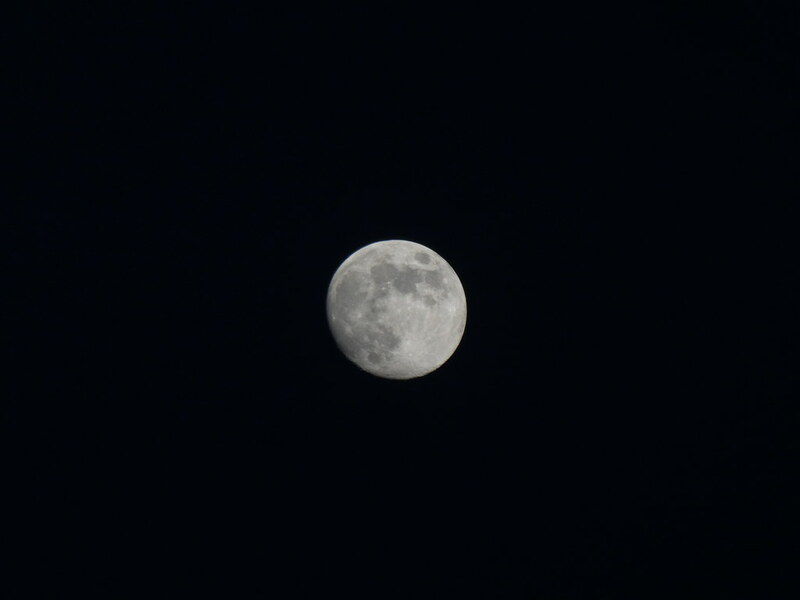 Except this shot. 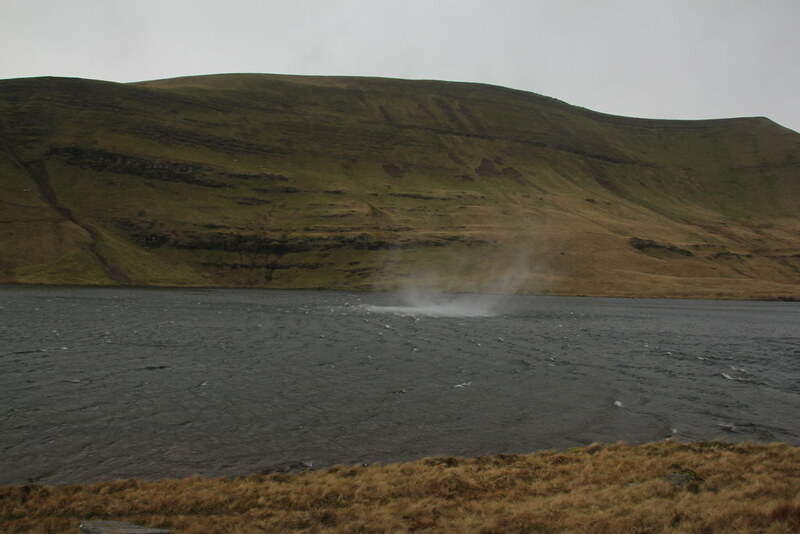 As the gusts of wind roared across the lake they whipped some mightily impressive tornadoes of spray with a deafening growl. 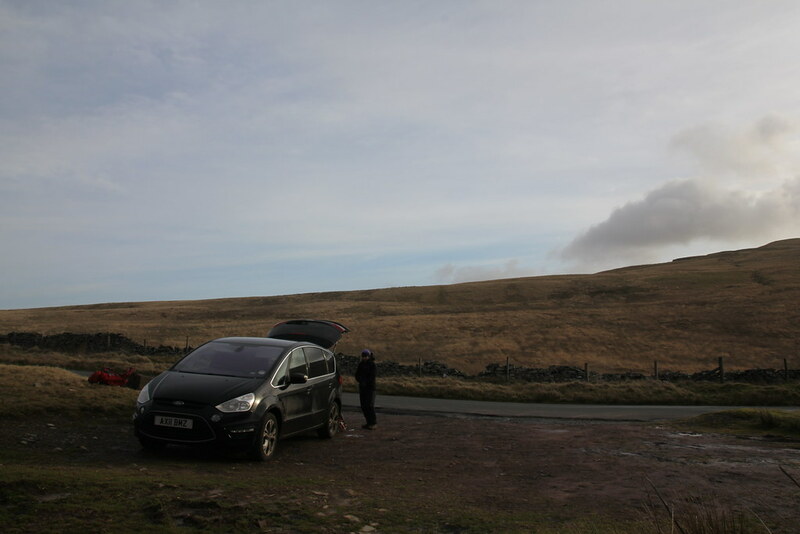 Back down through the bogs to the car. 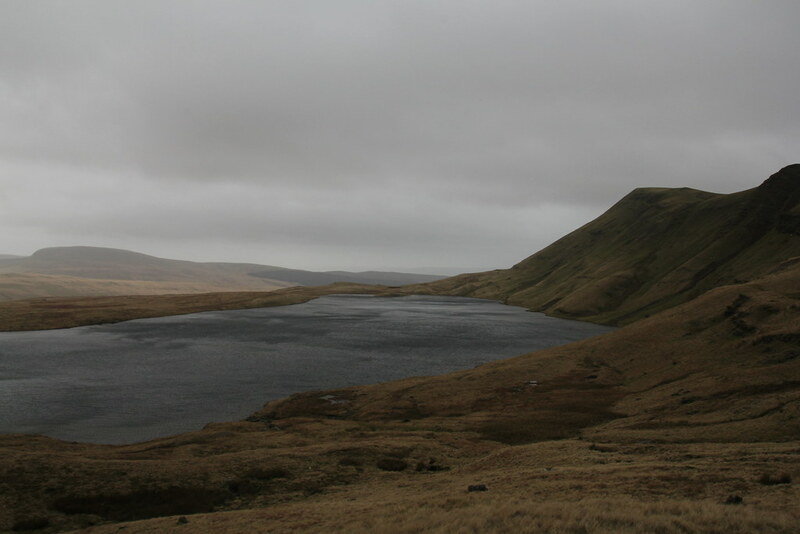 Almost a relief to sit in the car in silence without the constant drone of the wind. 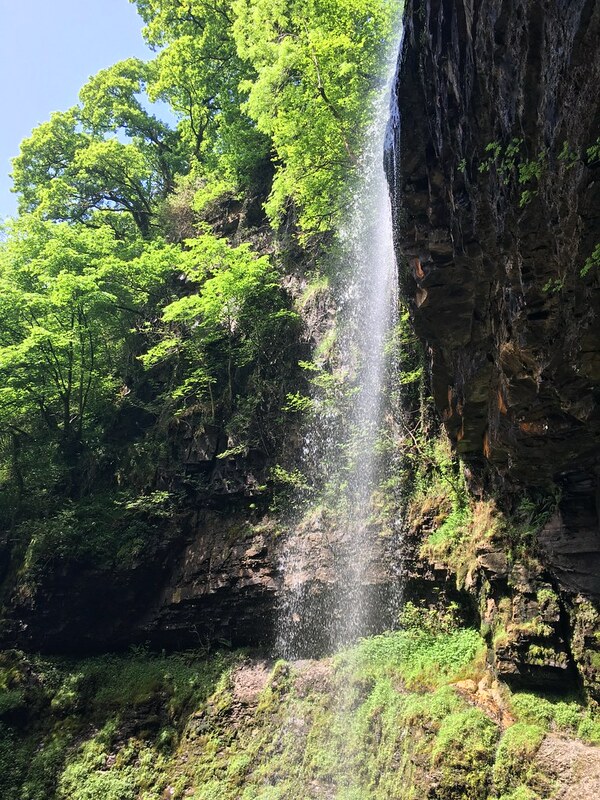 Normal service resumed here at Surfnslide after the family holiday to France – normal service meaning me trying to catch up on trips from a couple of months back – will I ever catch up? 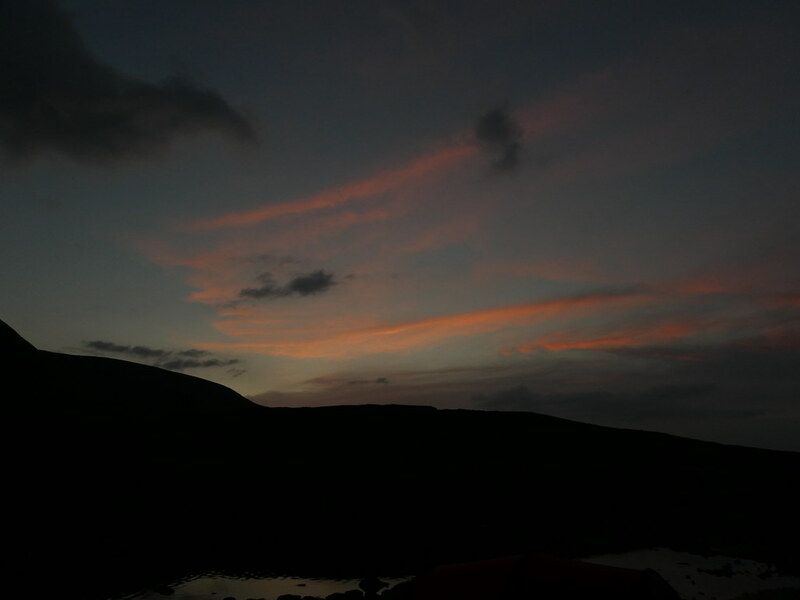 Why am I asking you? 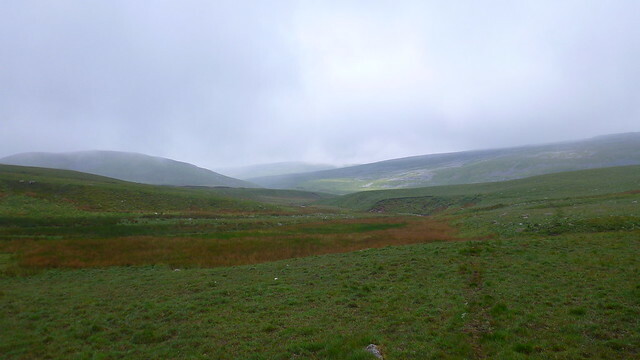 We headed off to follow the Haffes valley into the hills. 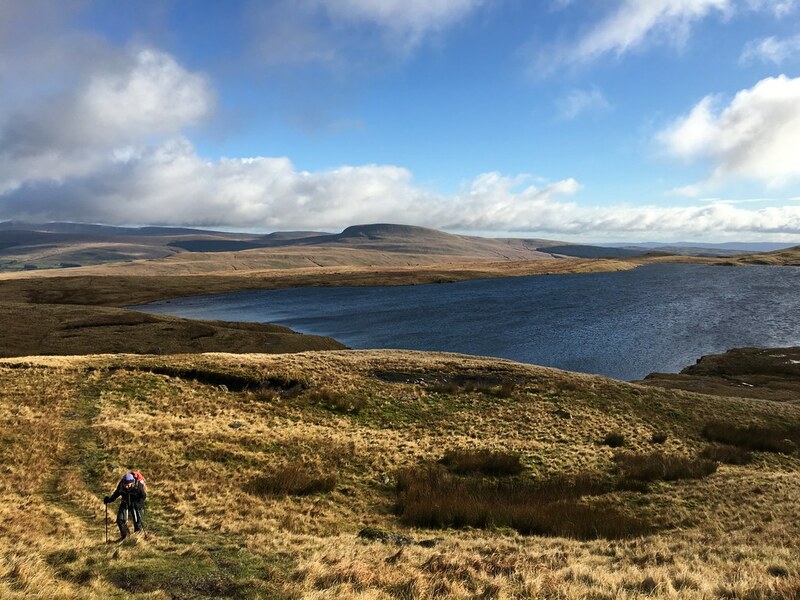 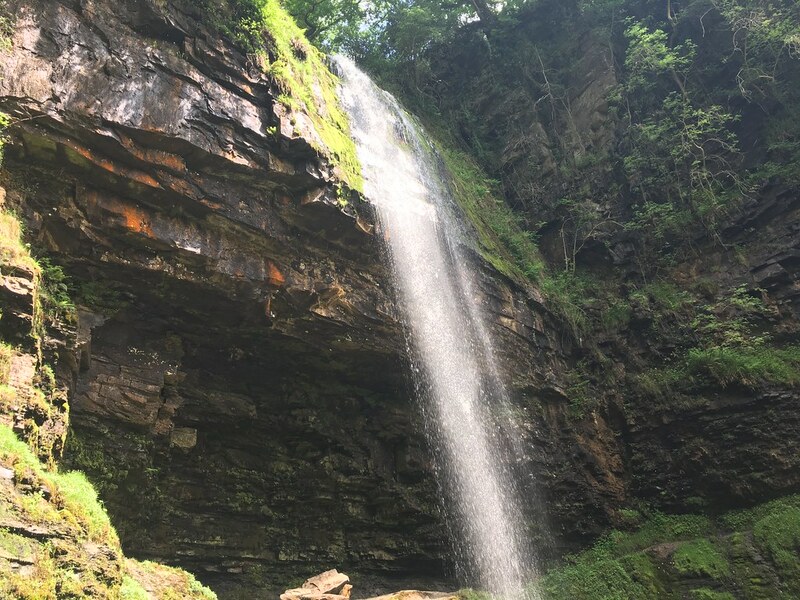 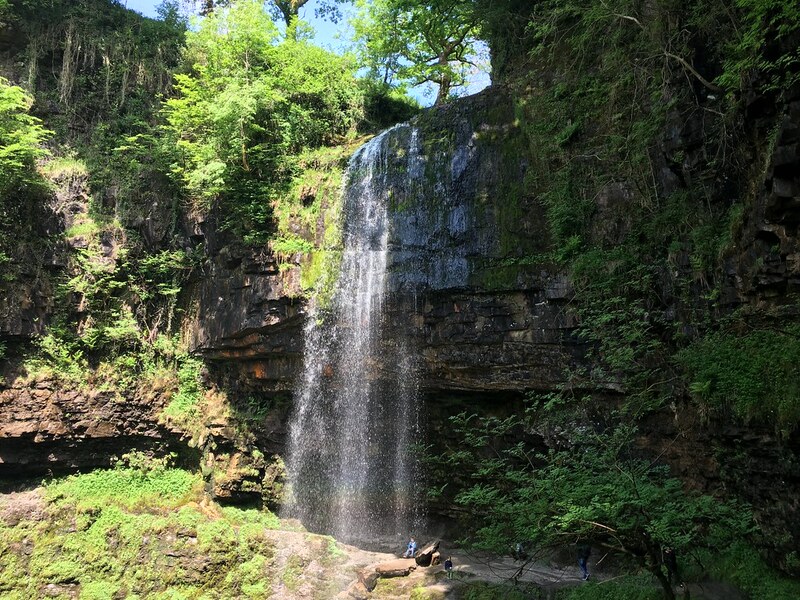 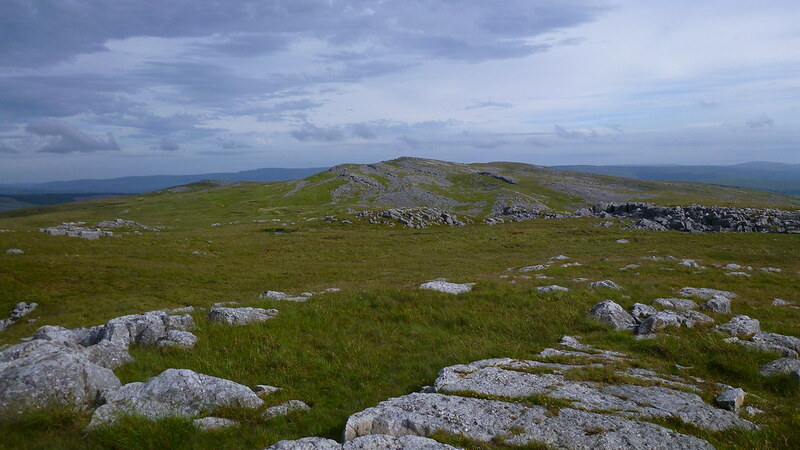 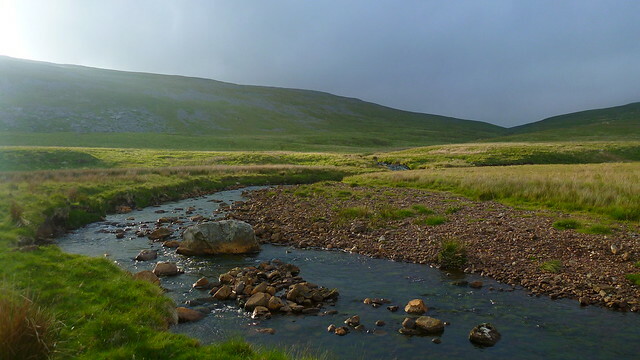 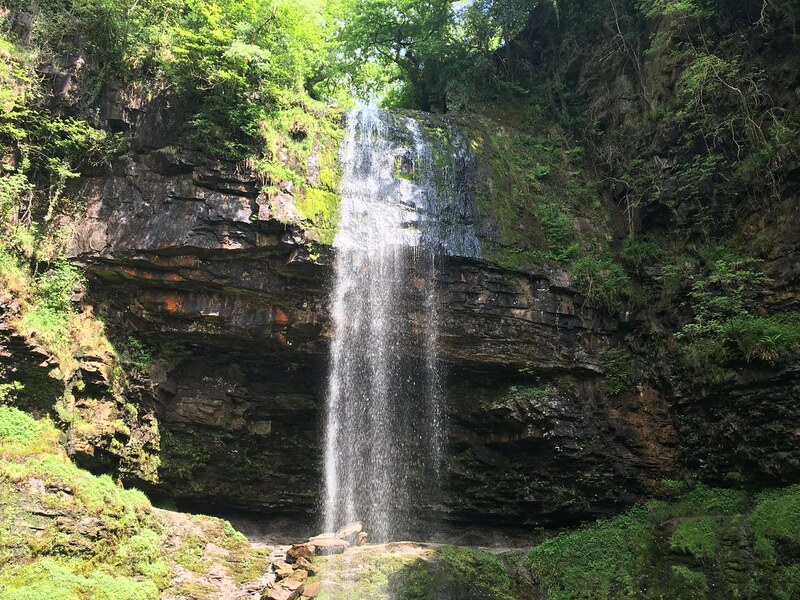 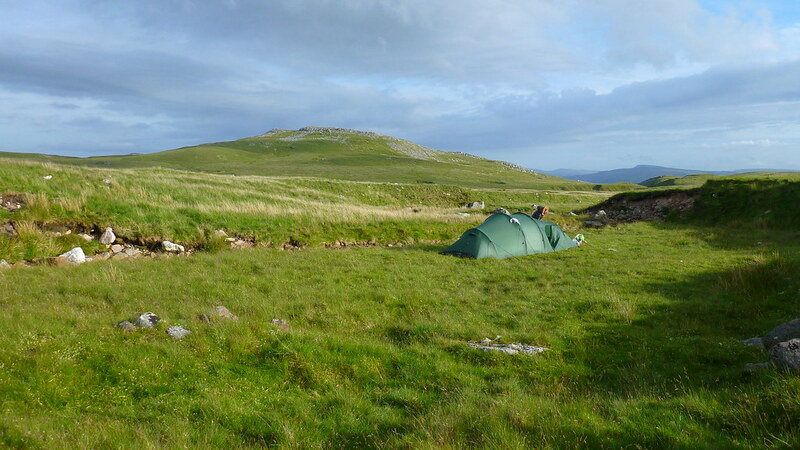 I was using a Cicerone guide “Backpackers Britain – Wales” by Graham Uney that i’d seen on Amazon and looked promising for some route and wild camp site ideas. 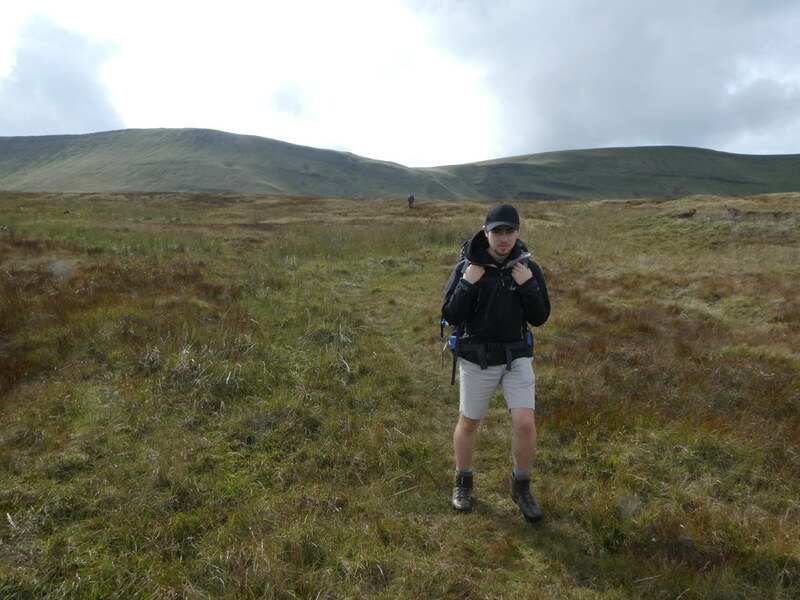 I’m normally a fan of Cicerone guides but let me just say that this one is a massive disappointment. 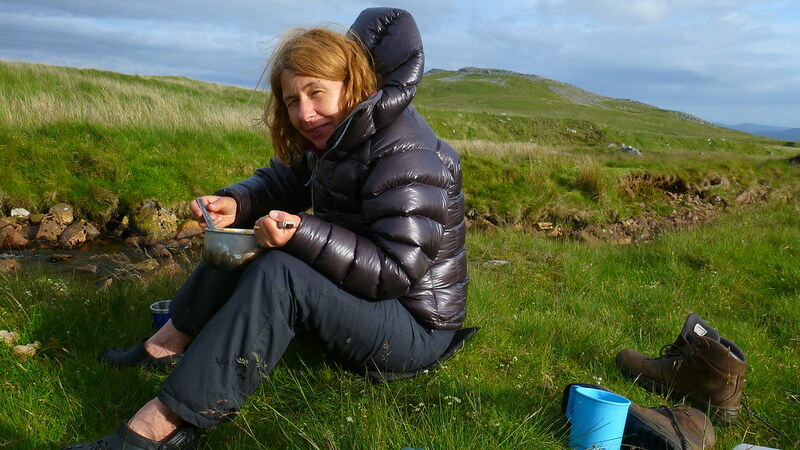 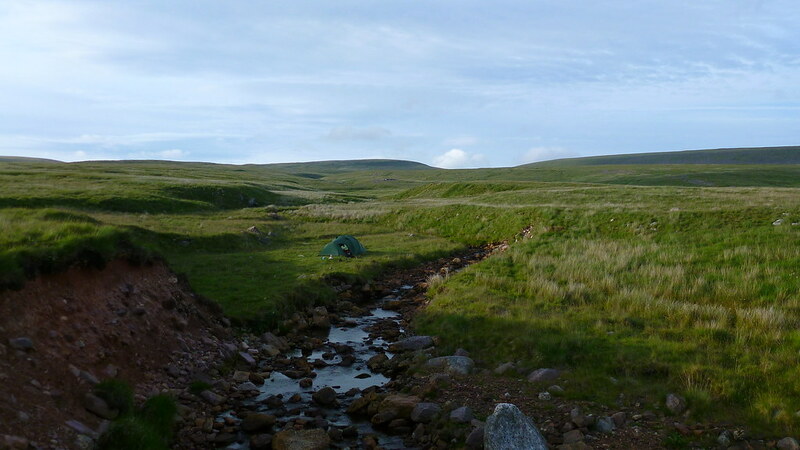 For a start the majority of routes involve overnights at campsites, pubs and guest houses, not exactly backpacking in the proper sense. 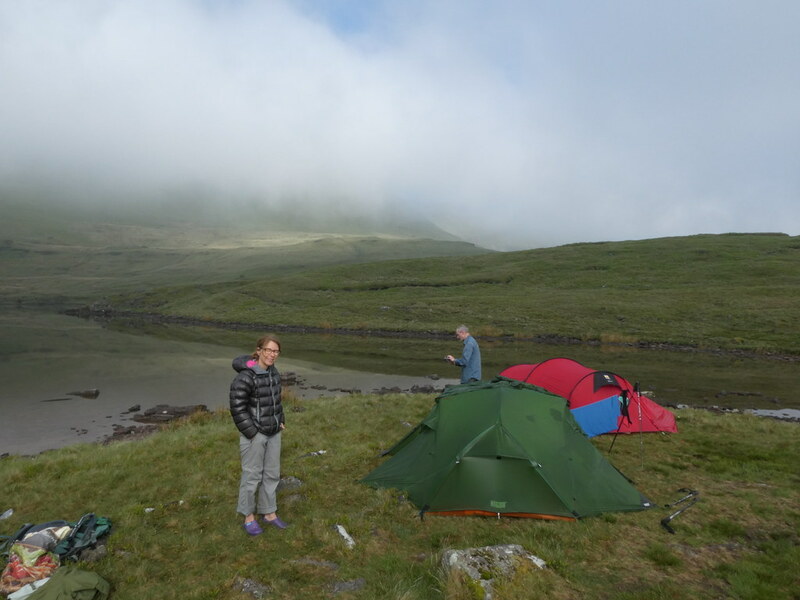 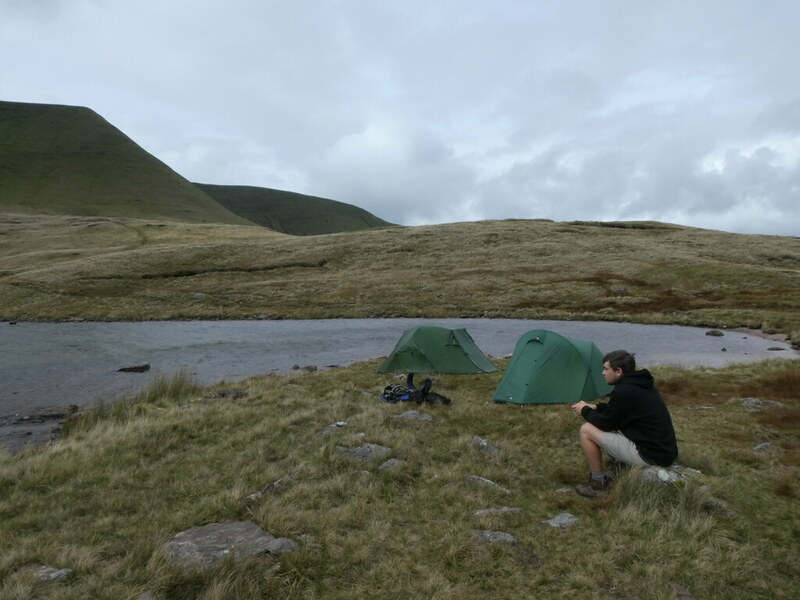 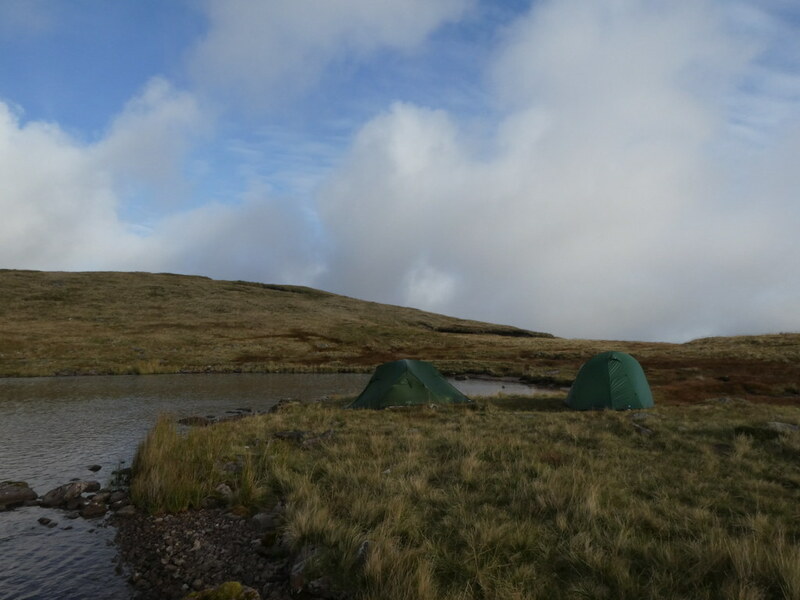 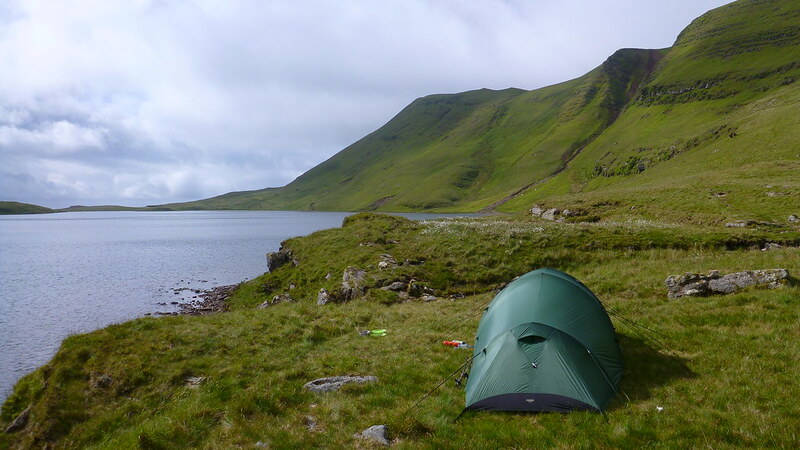 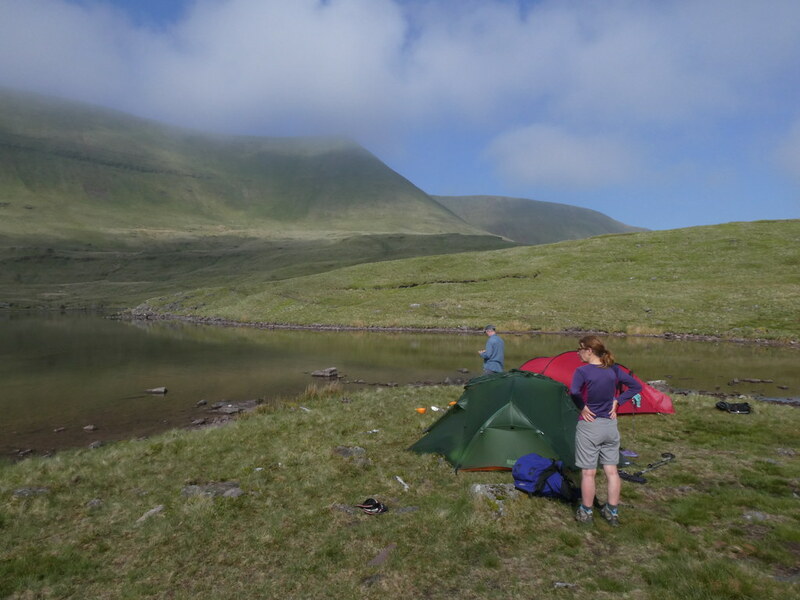 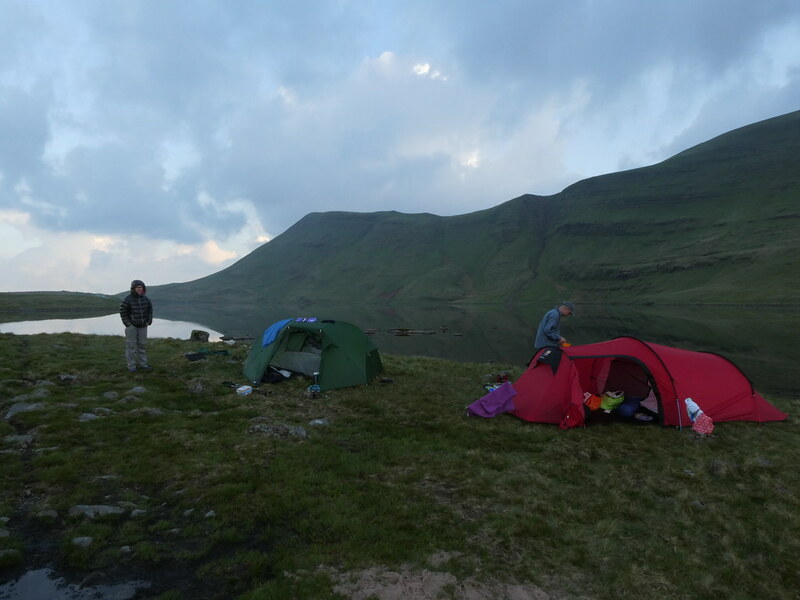 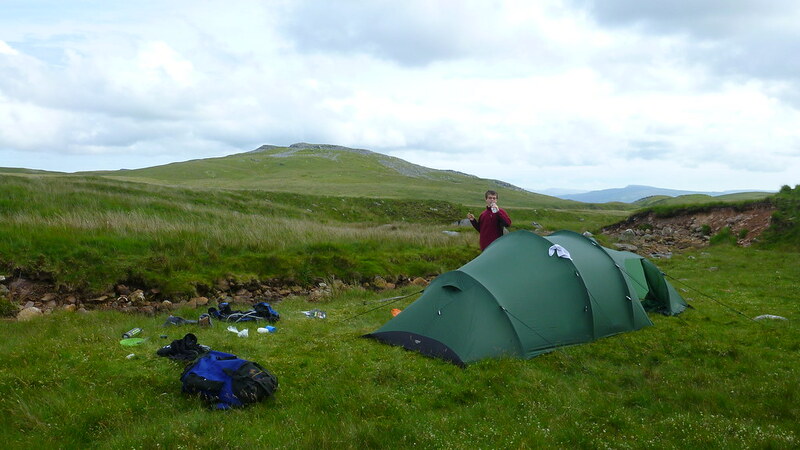 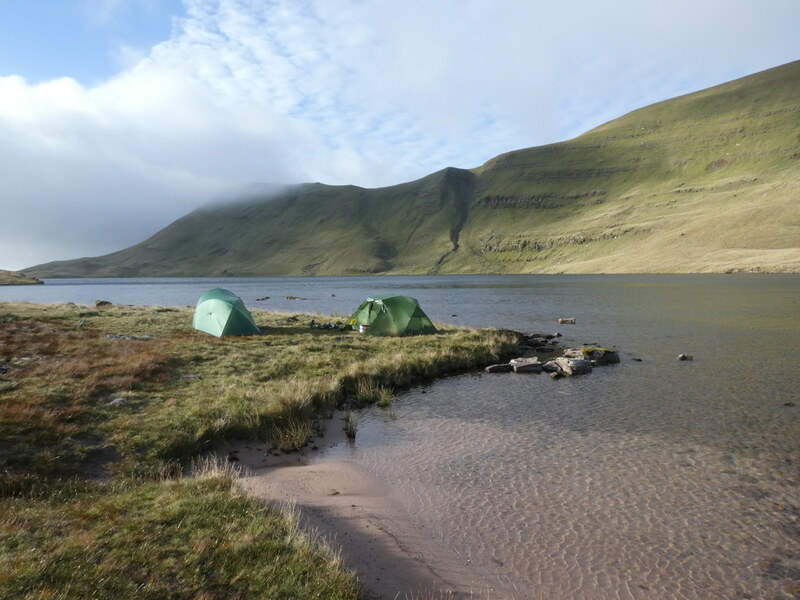 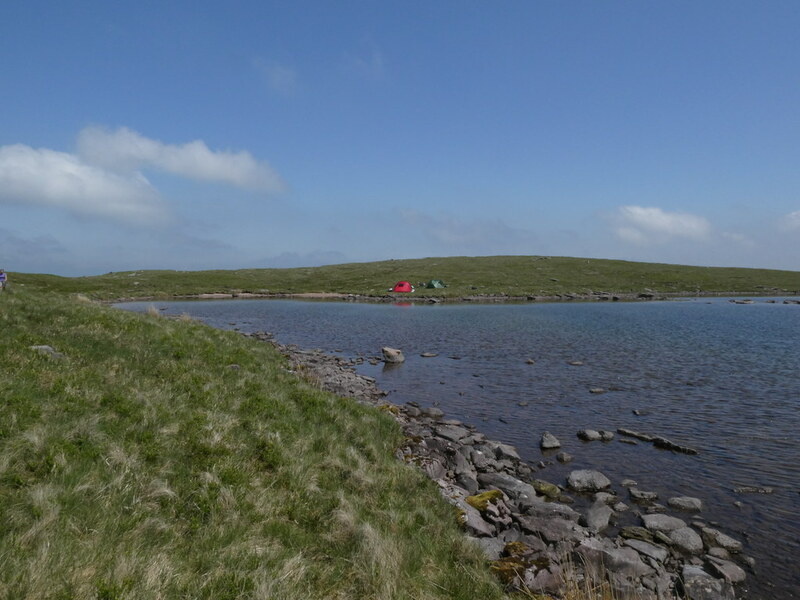 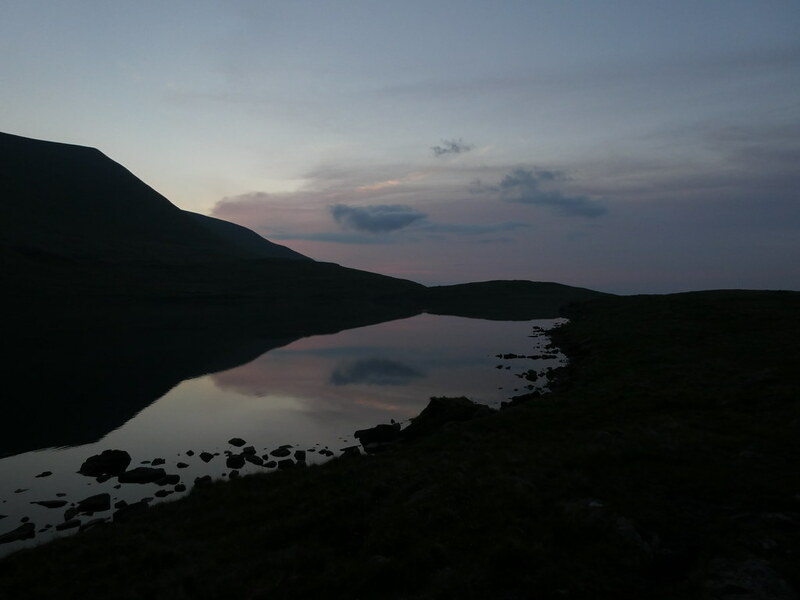 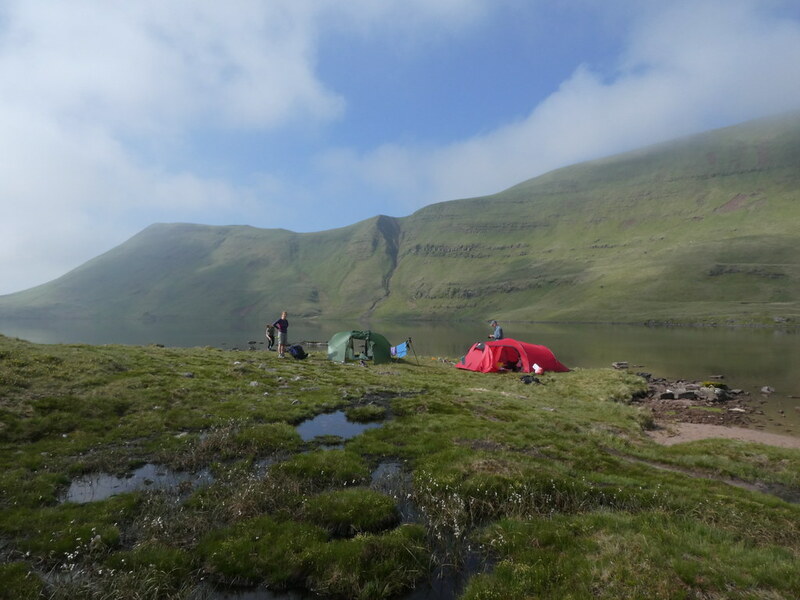 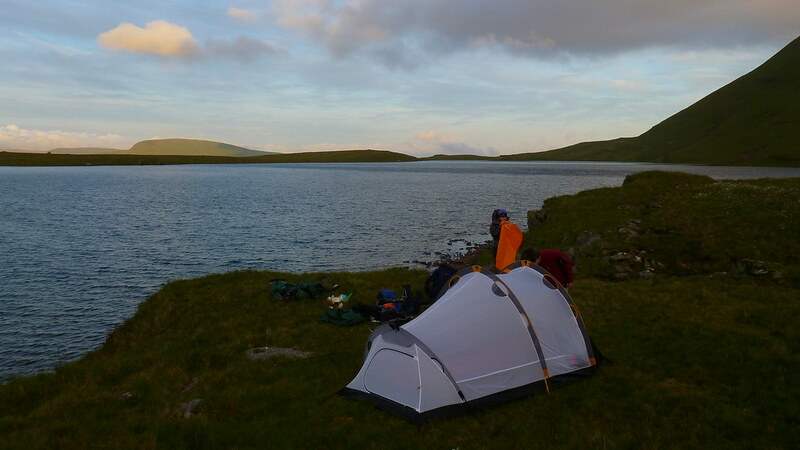 Only a few have wild camp sites as their overnight. 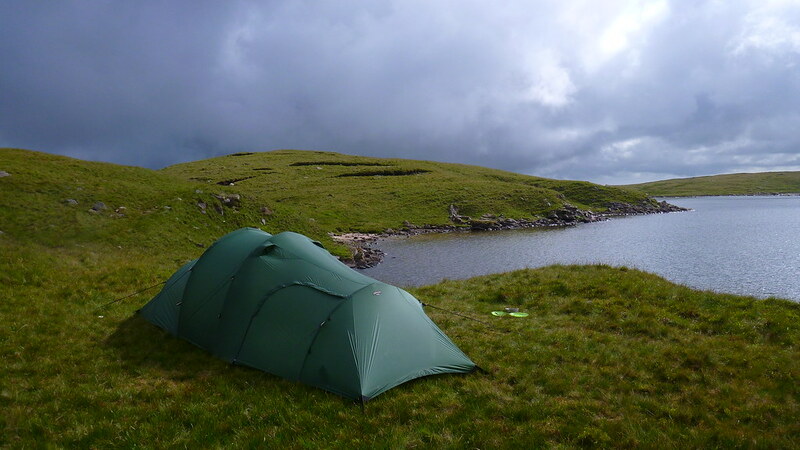 There are a few that use bothies but they are not well researched. 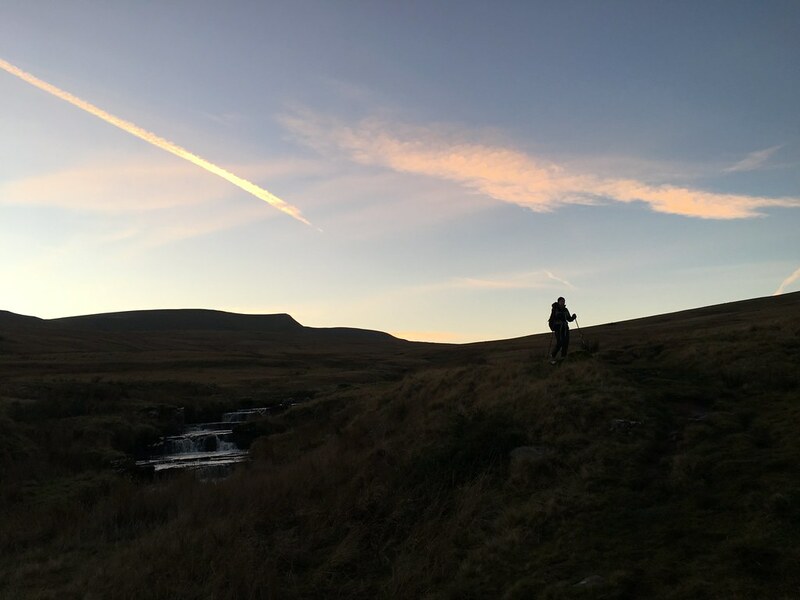 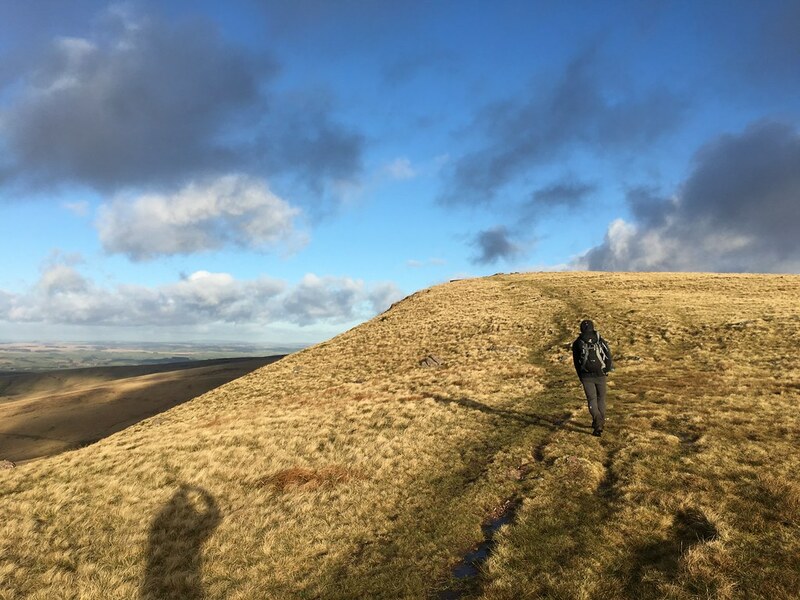 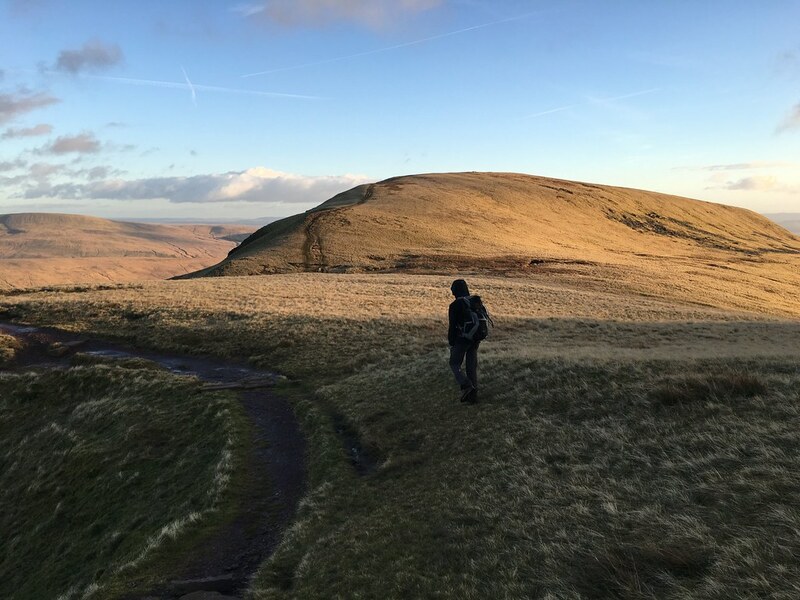 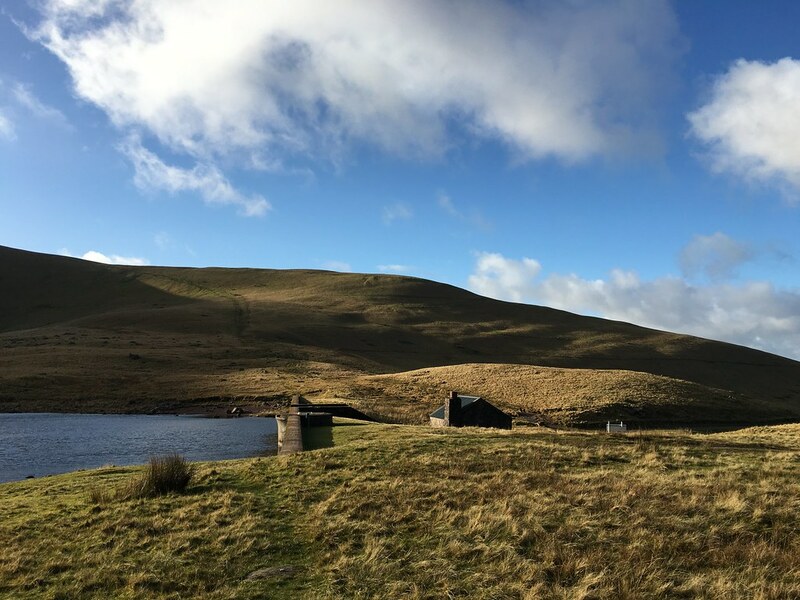 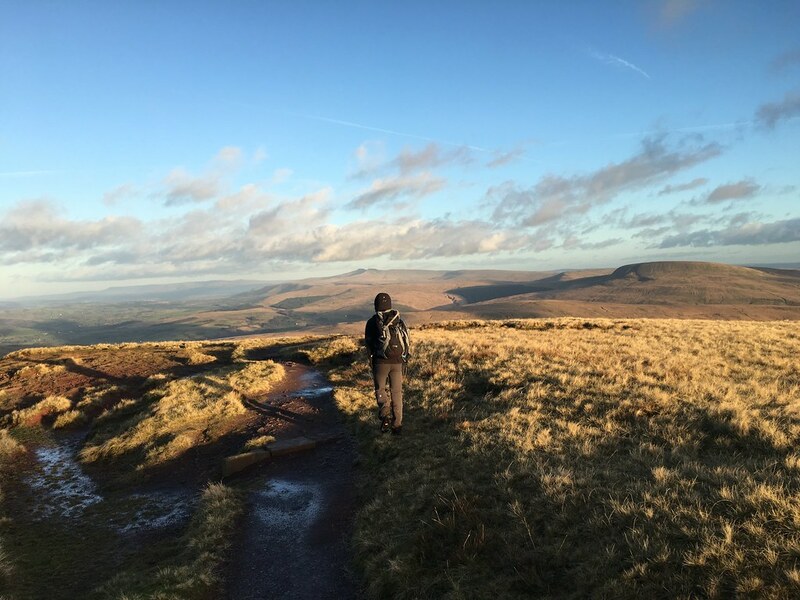 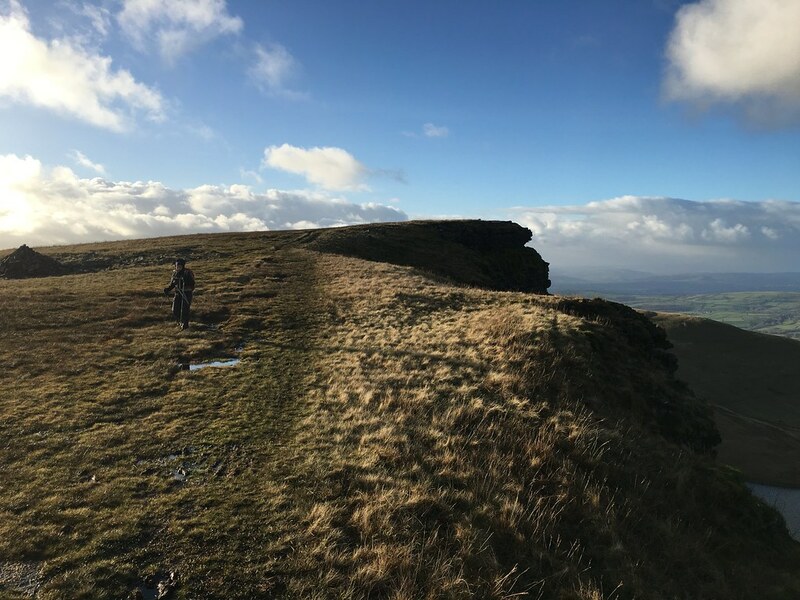 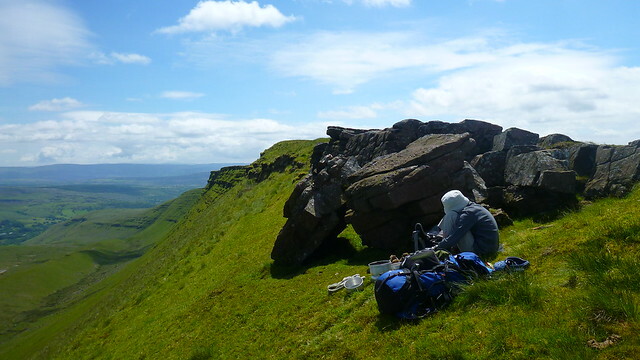 A few routes use the Grwyne Fawr bothy in the Black Mountains which is fine but it’s tiny, near the road end and very well-known. 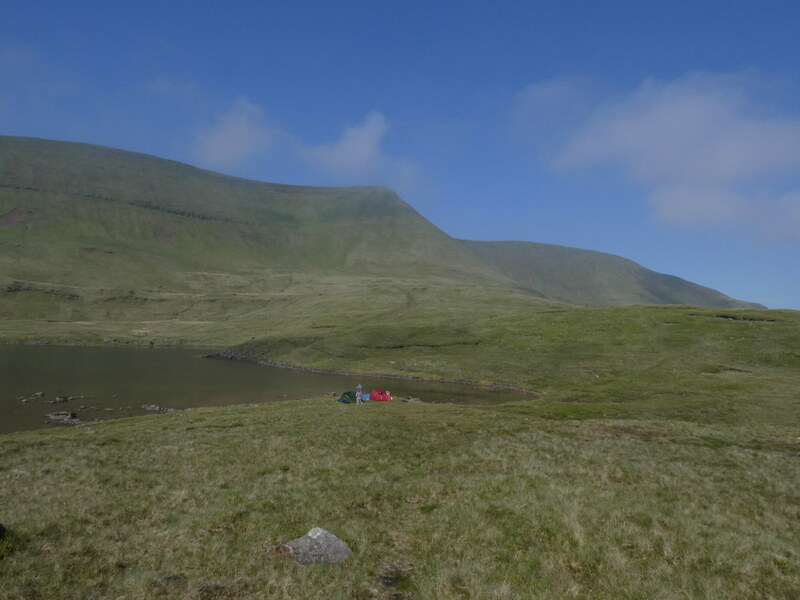 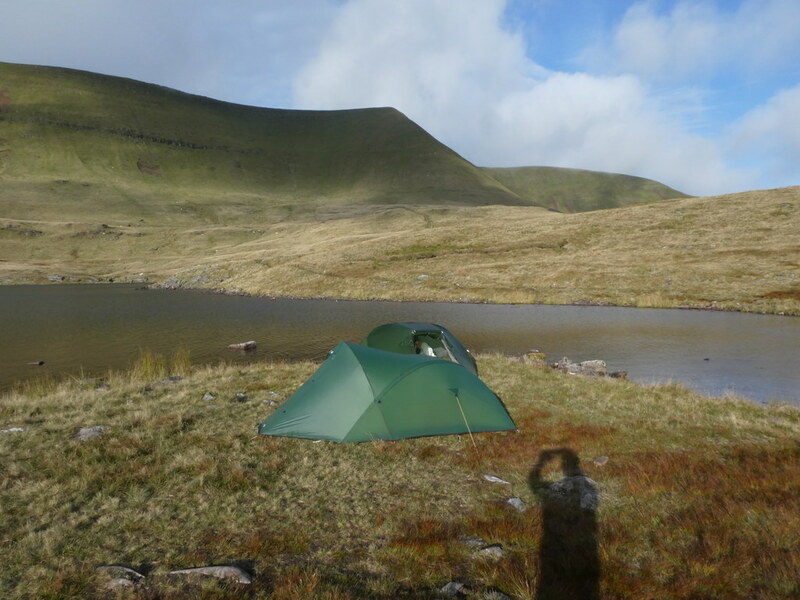 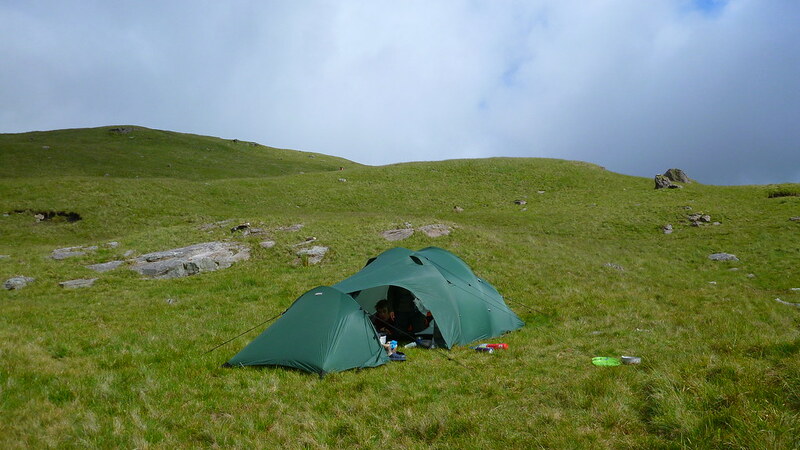 on weekends it is very likely to be full and there is very little alternative if you happen not to have a tent. 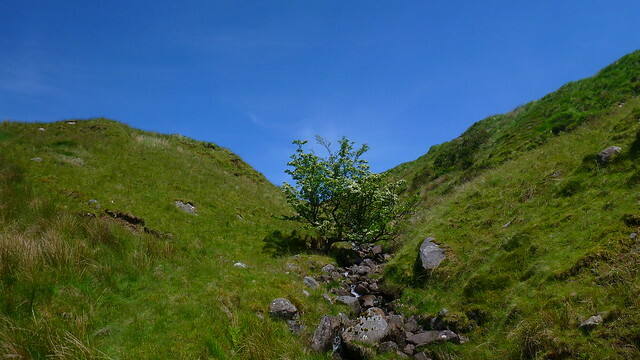 None of this is mentioned in the book which I think is a little remiss. 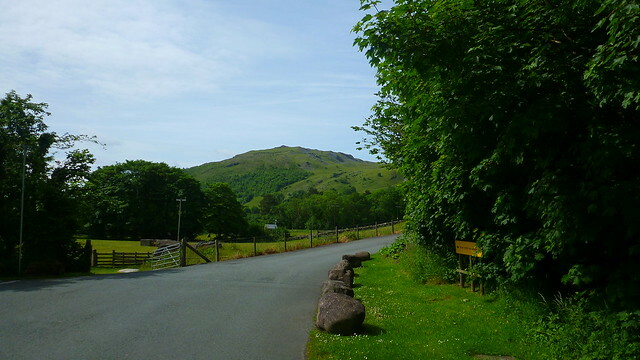 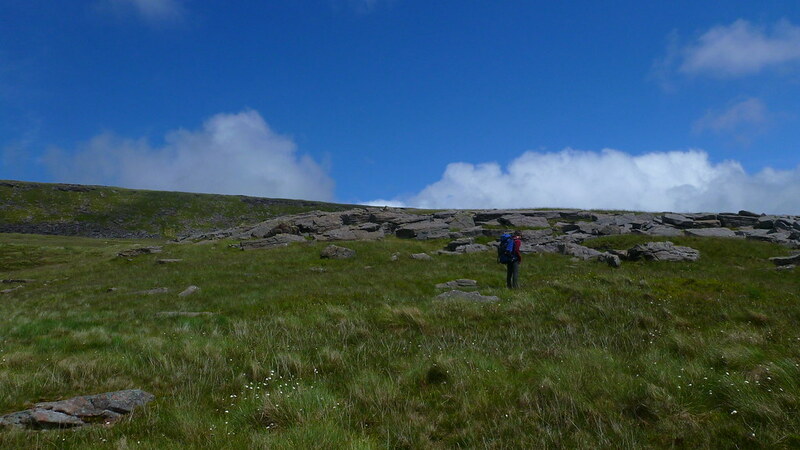 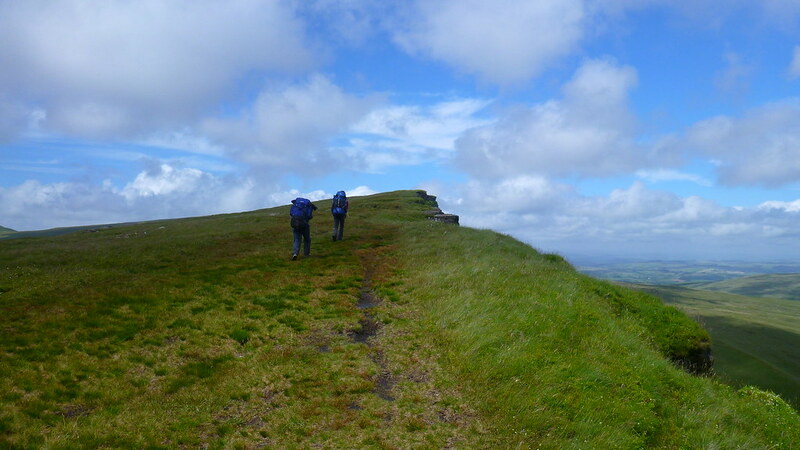 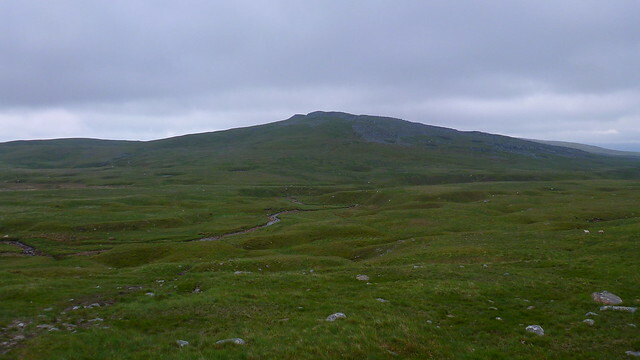 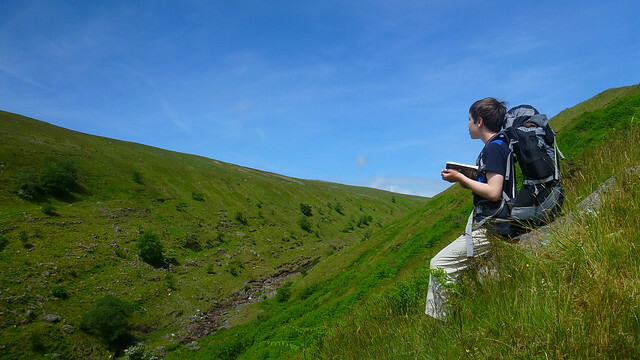 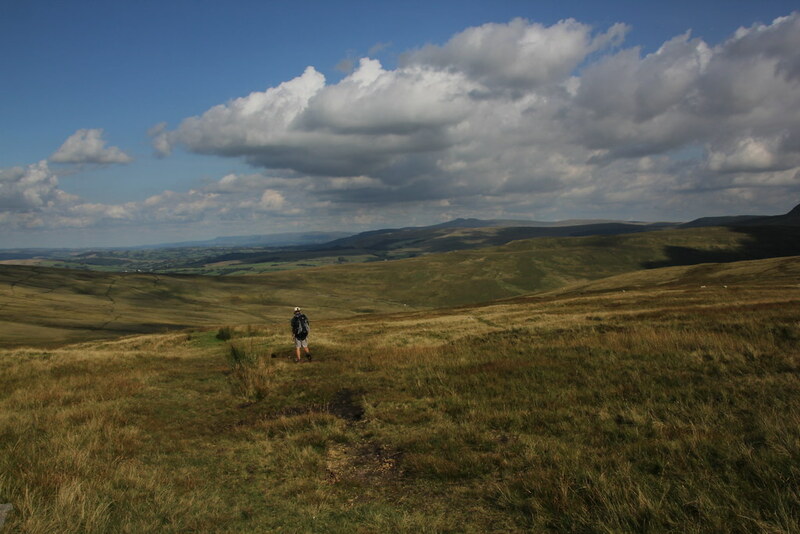 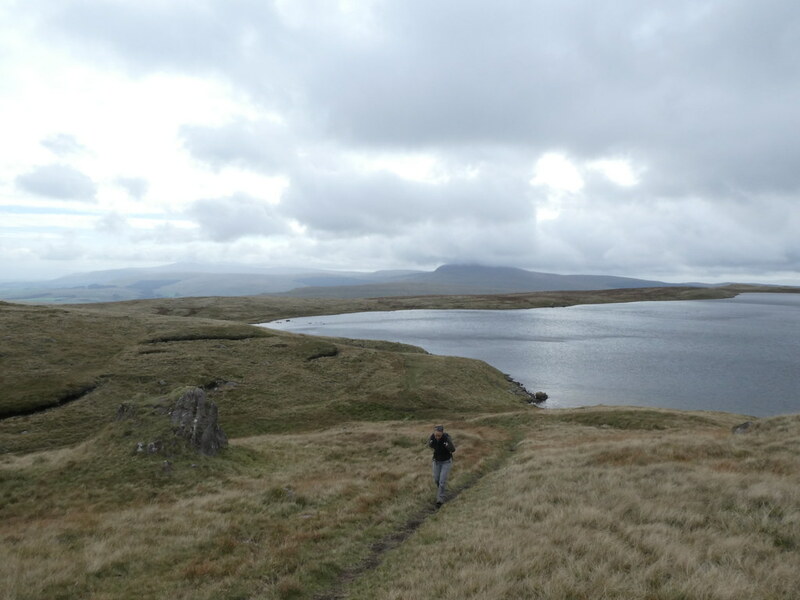 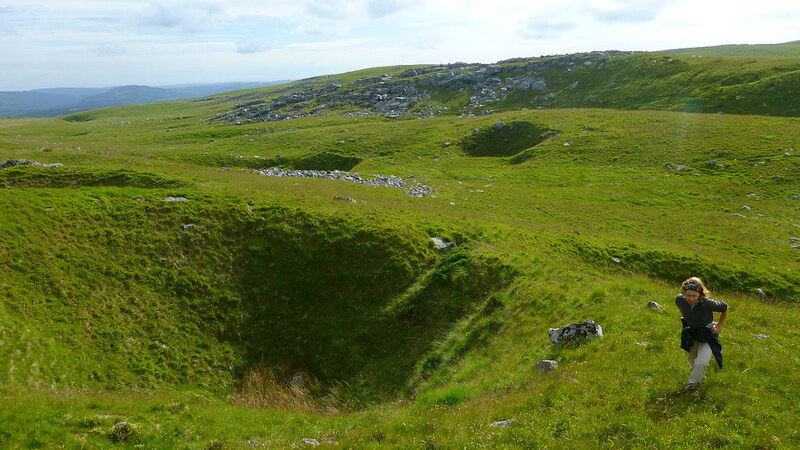 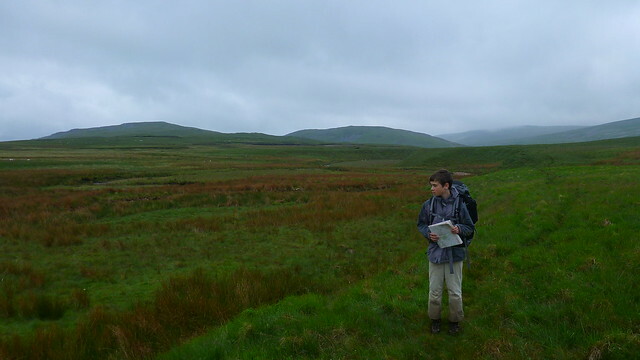 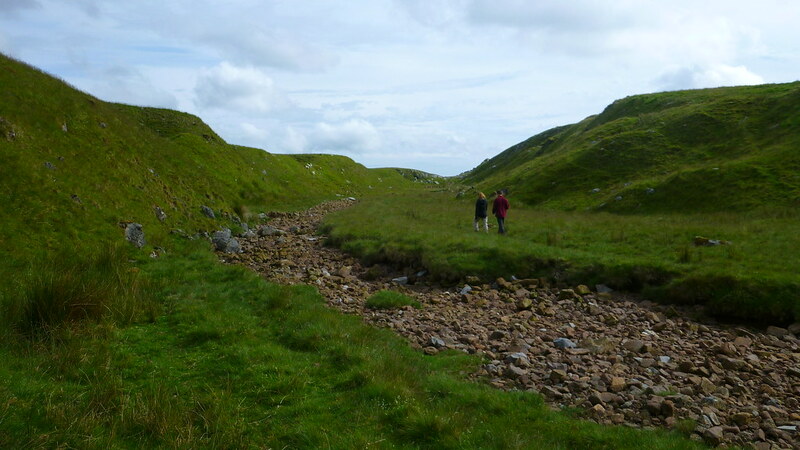 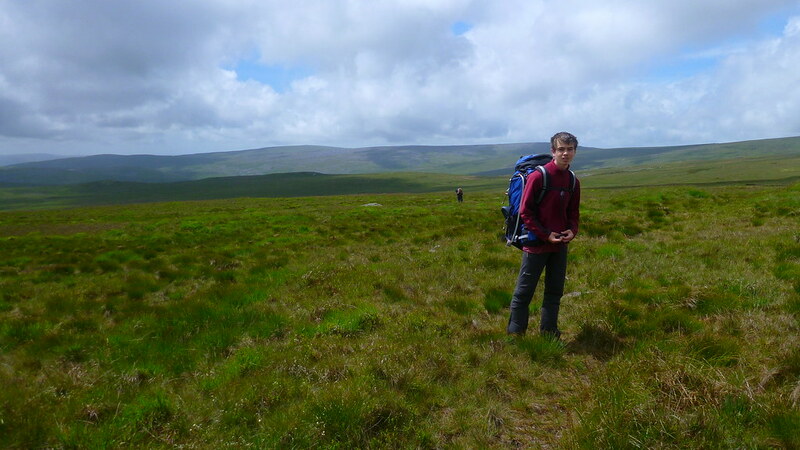 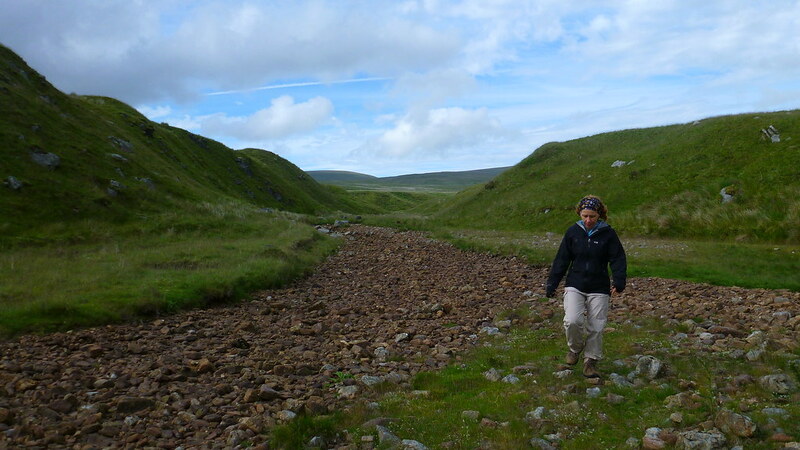 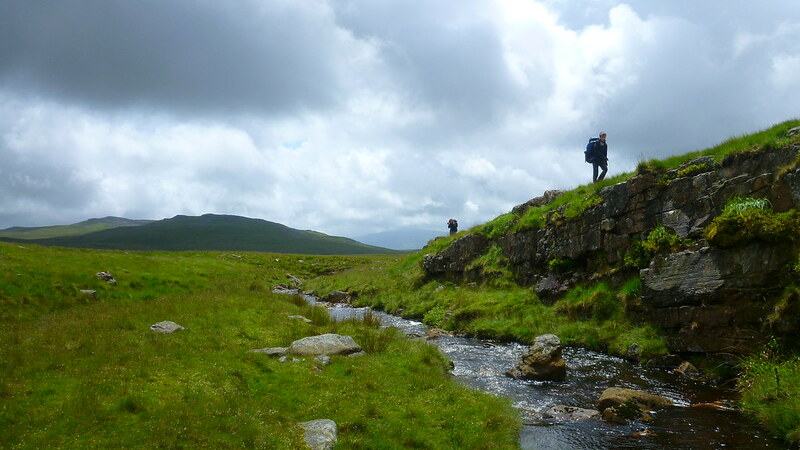 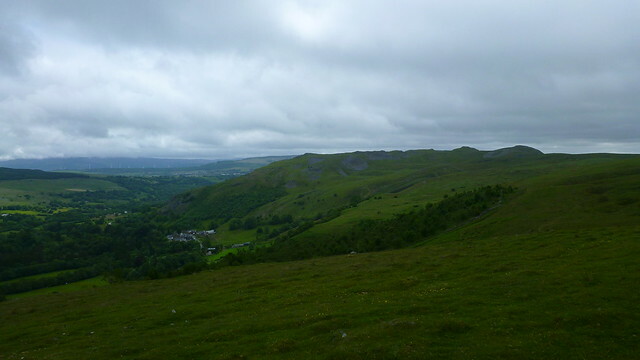 TJS has done most of his walking on well-known hills with broad paths. 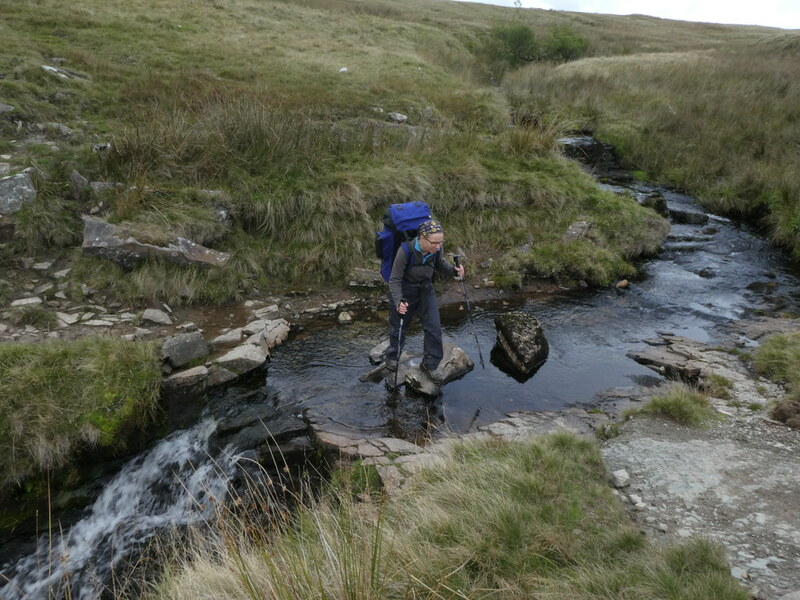 This was the first time I’d taken him “off-piste” and he didn’t seem to appreciate the subtle charms of tussocks and bog without a path (neither do I but that’s not the point). 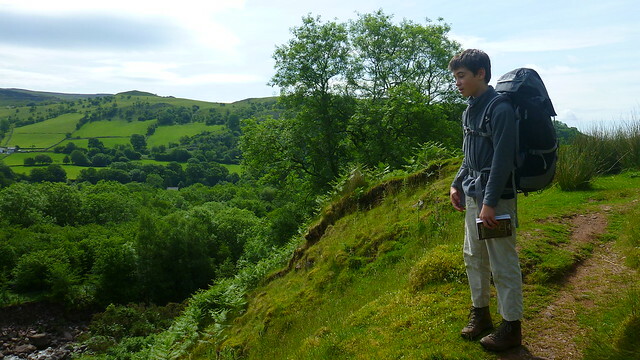 He was mightily relieved when we finally reached the path. 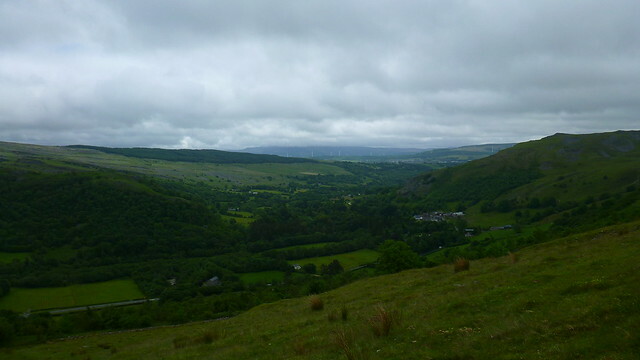 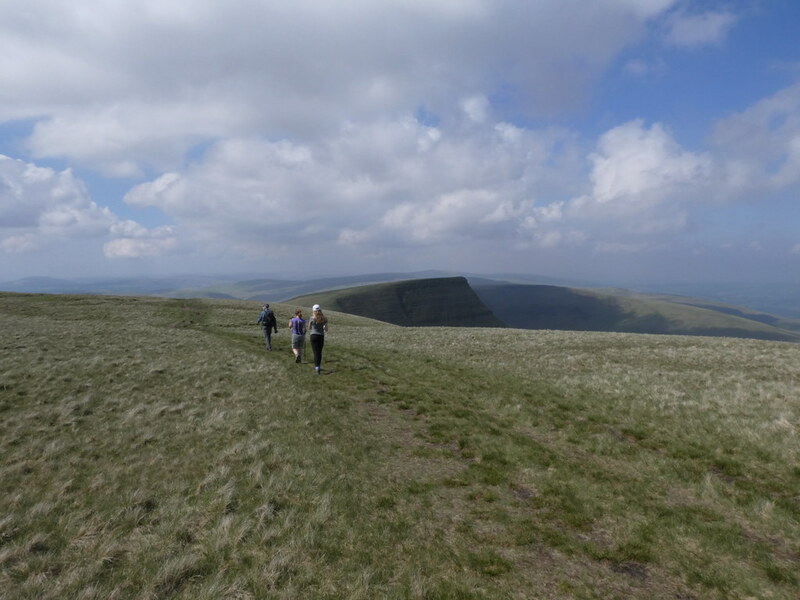 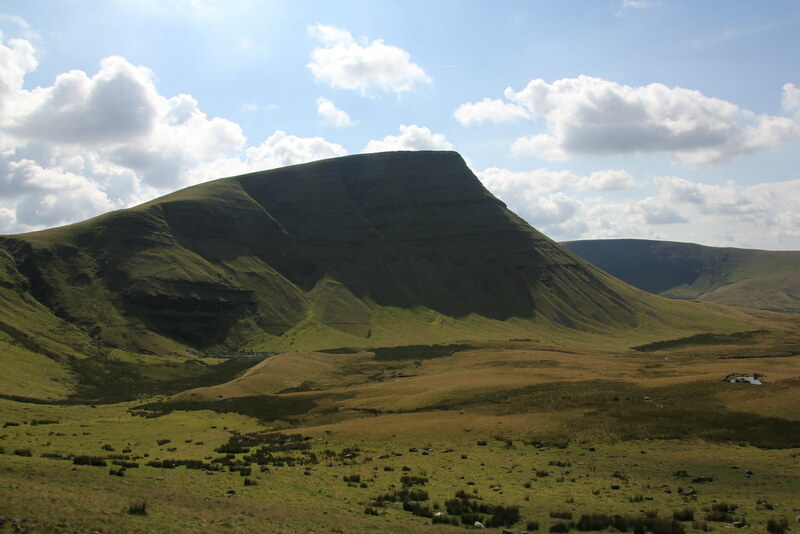 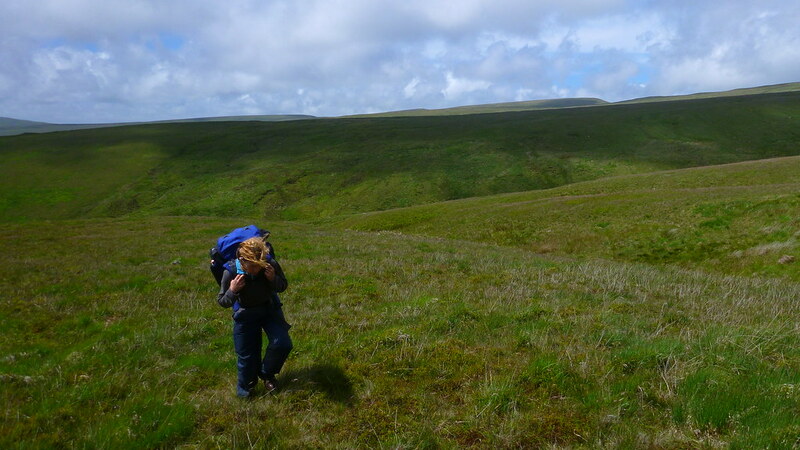 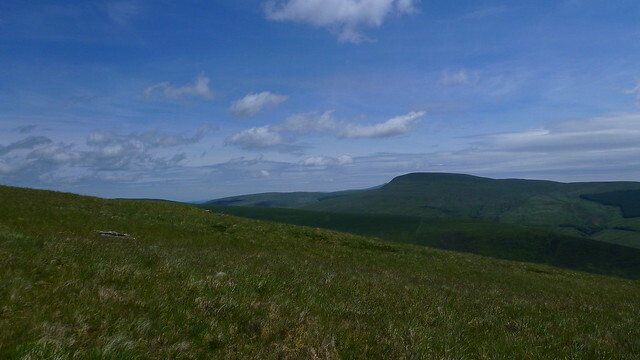 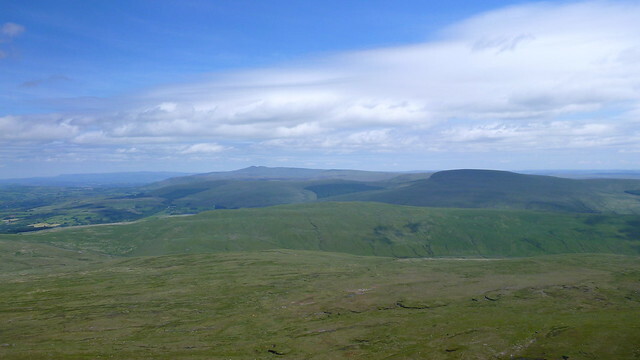 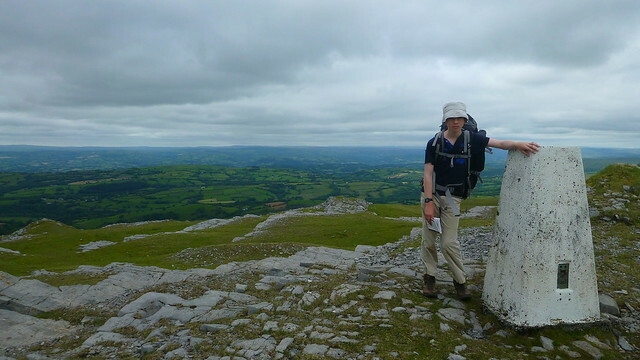 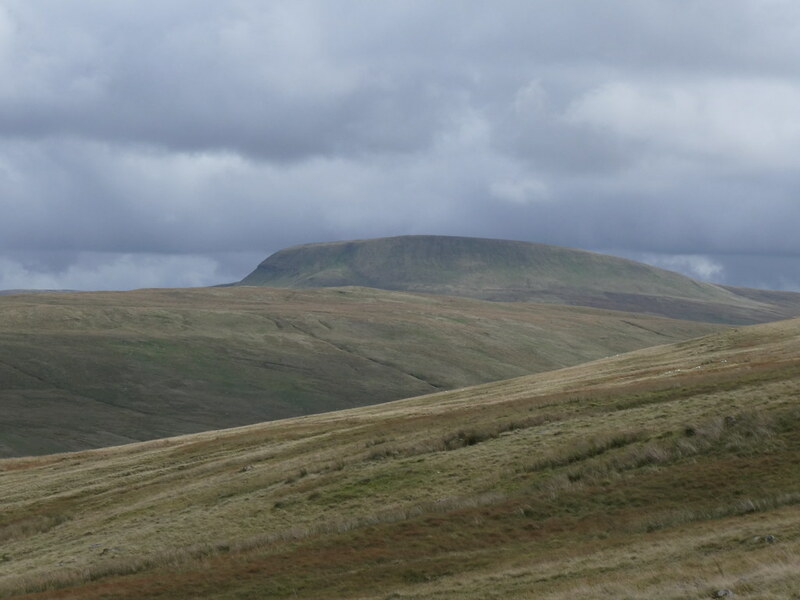 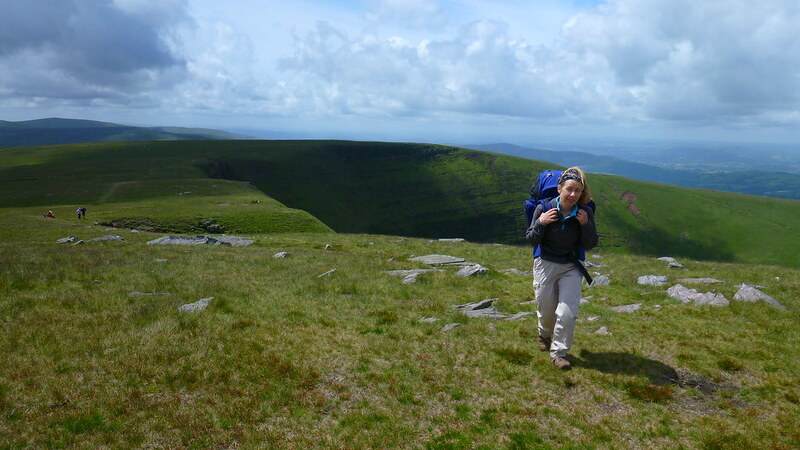 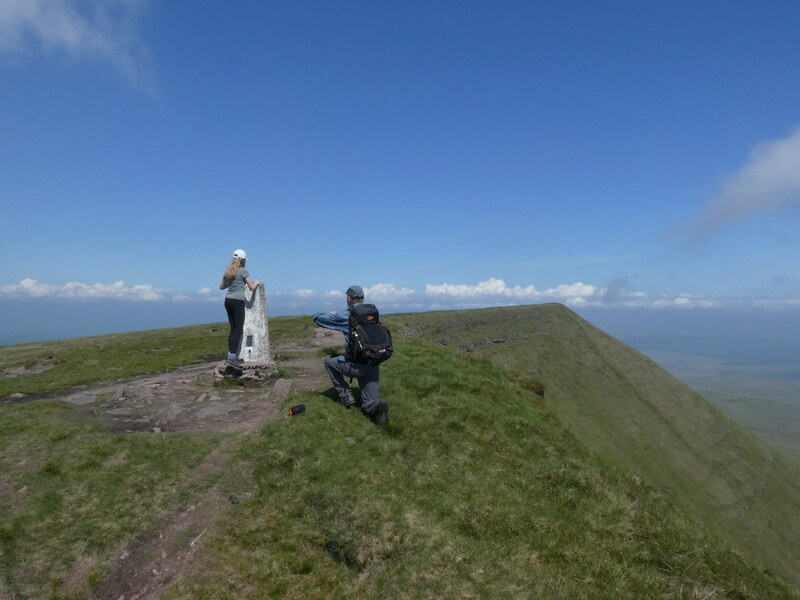 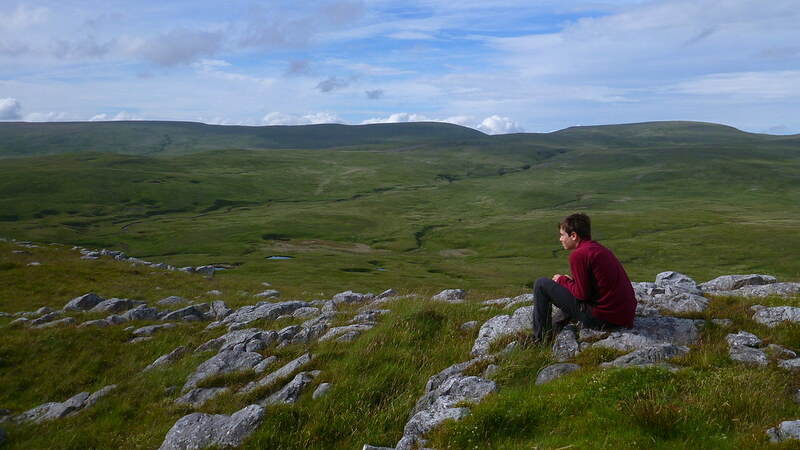 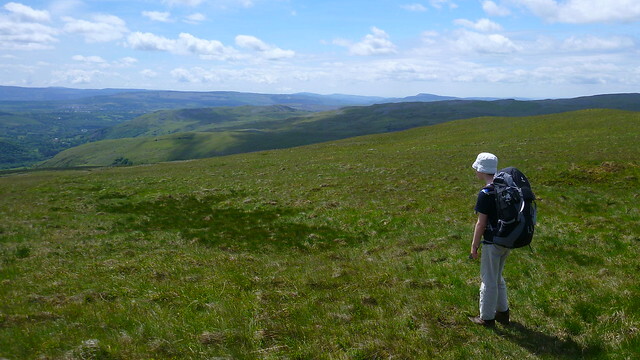 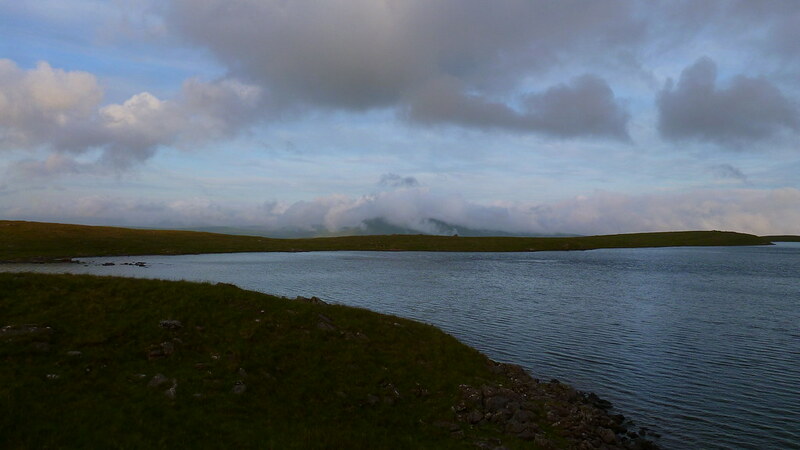 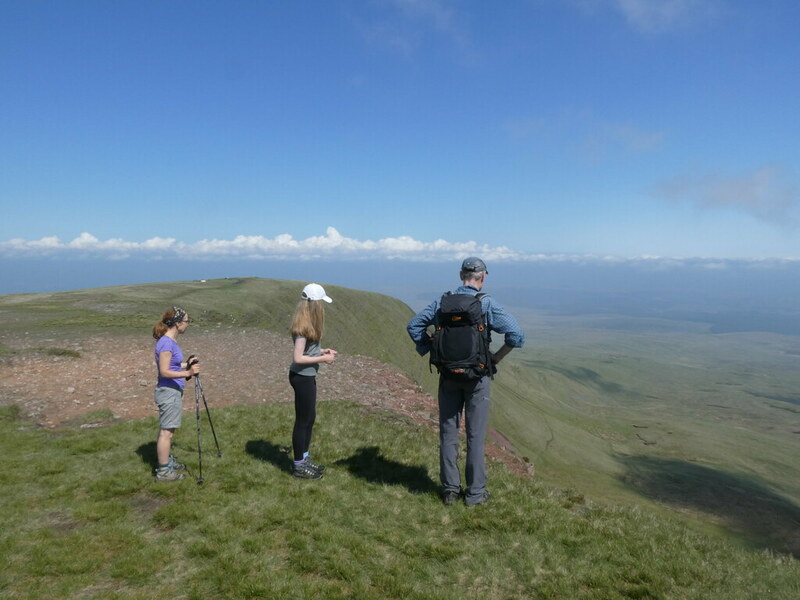 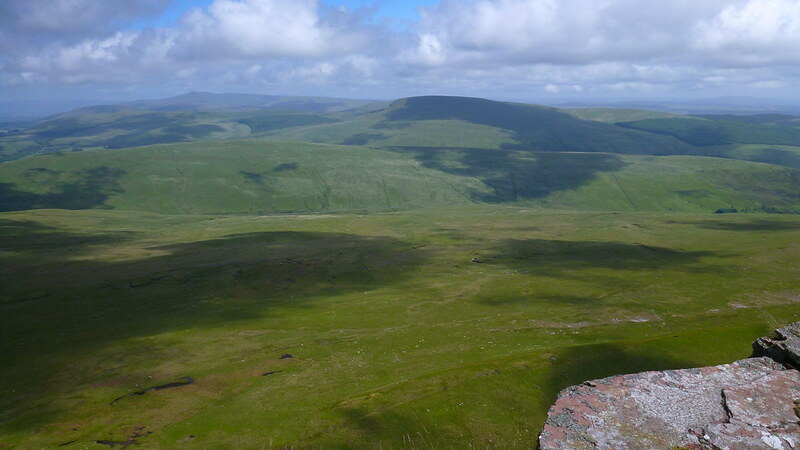 We pressed on to take in the next set of tops along the escarpment, Fan Brycheiniog and Fan Fawr. 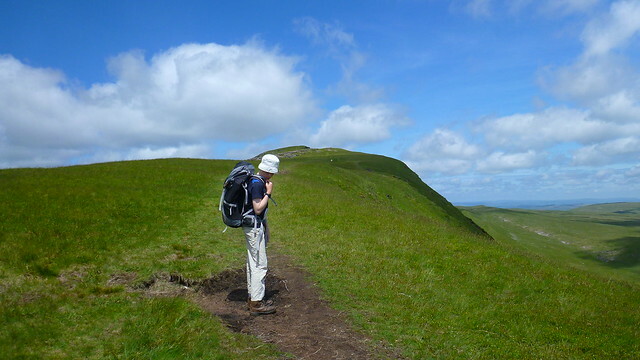 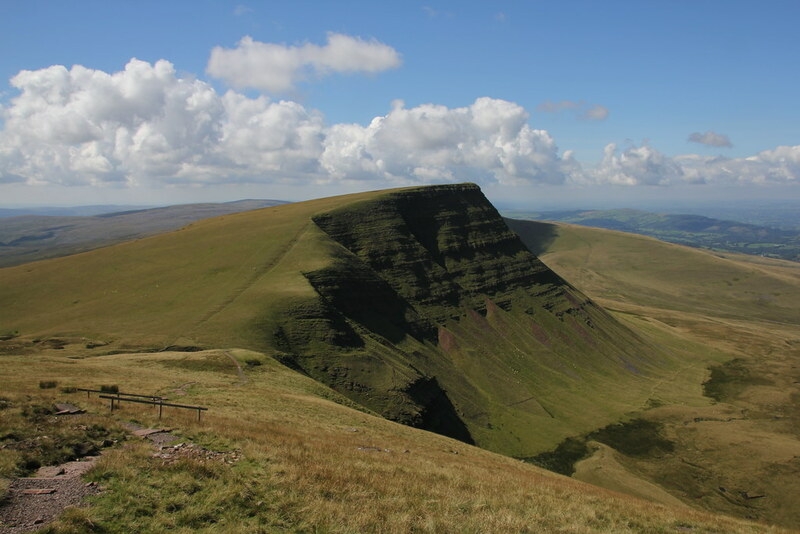 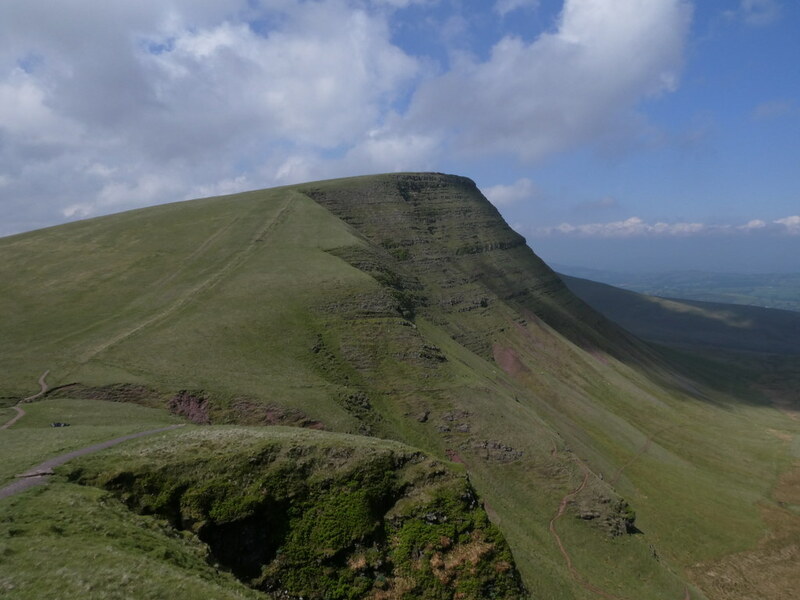 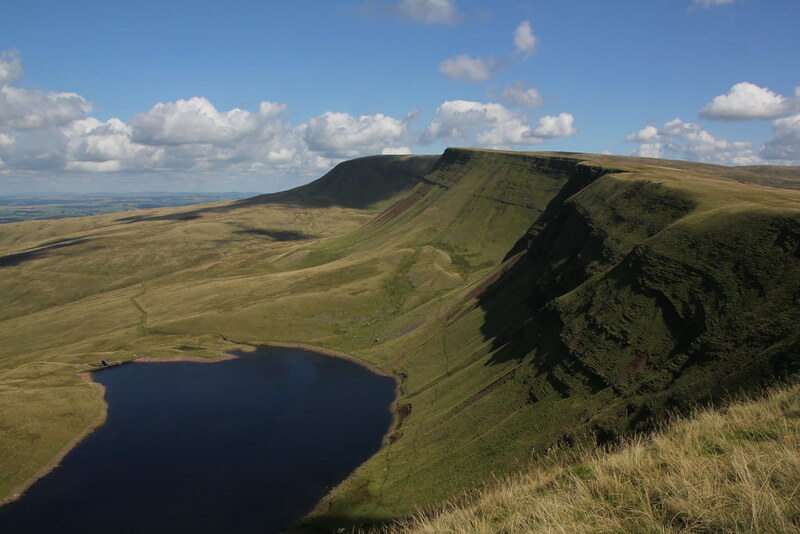 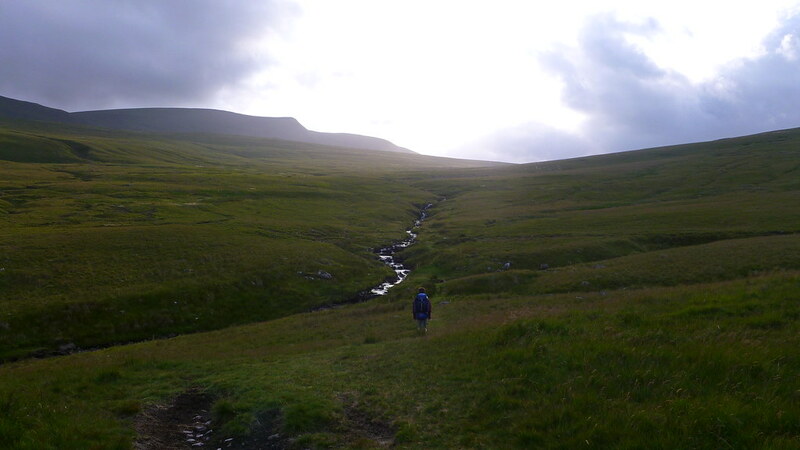 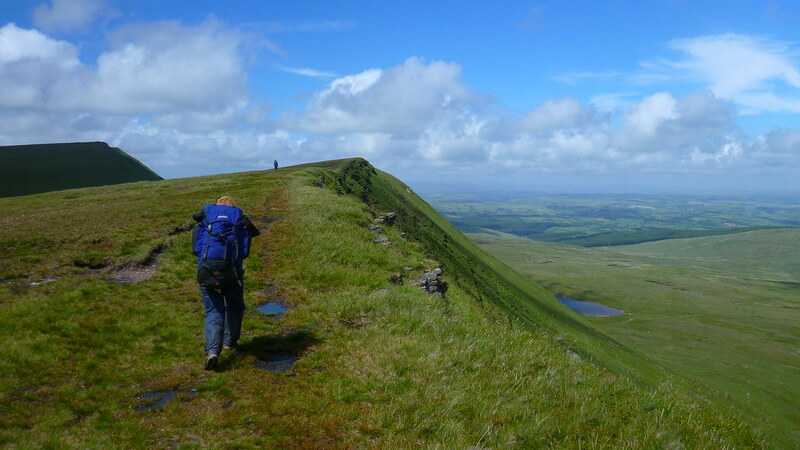 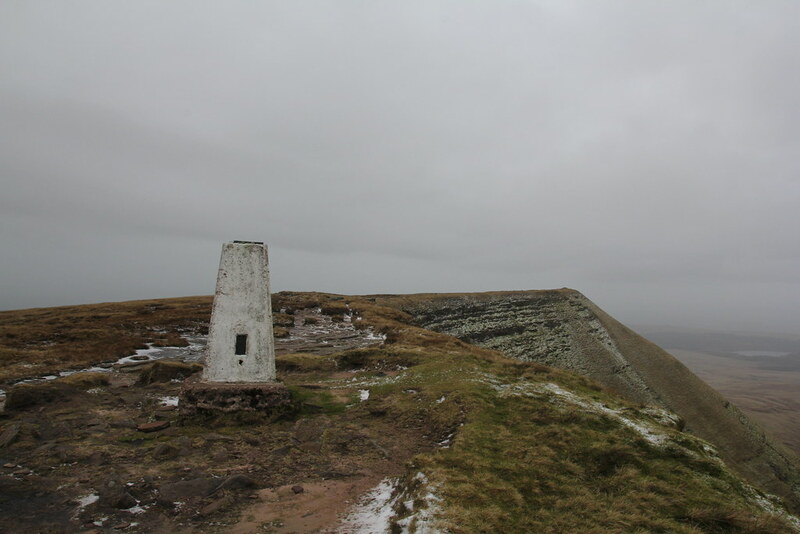 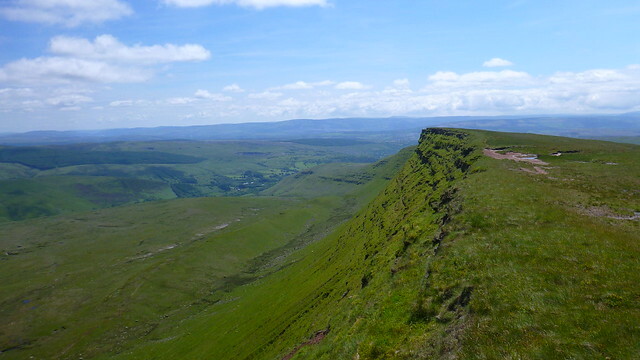 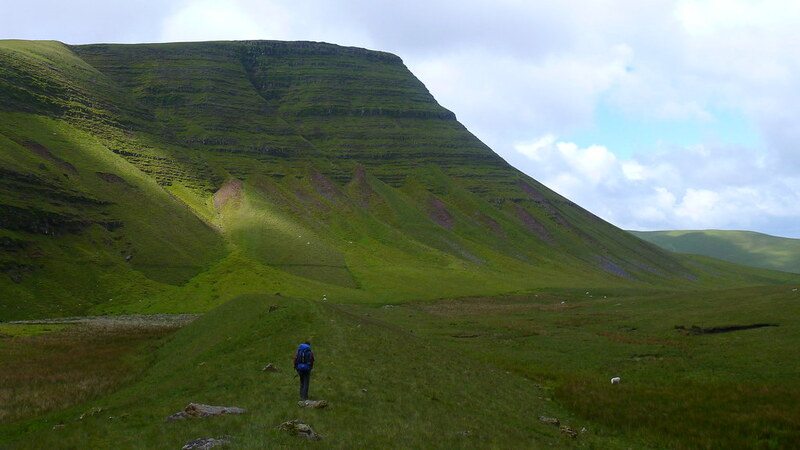 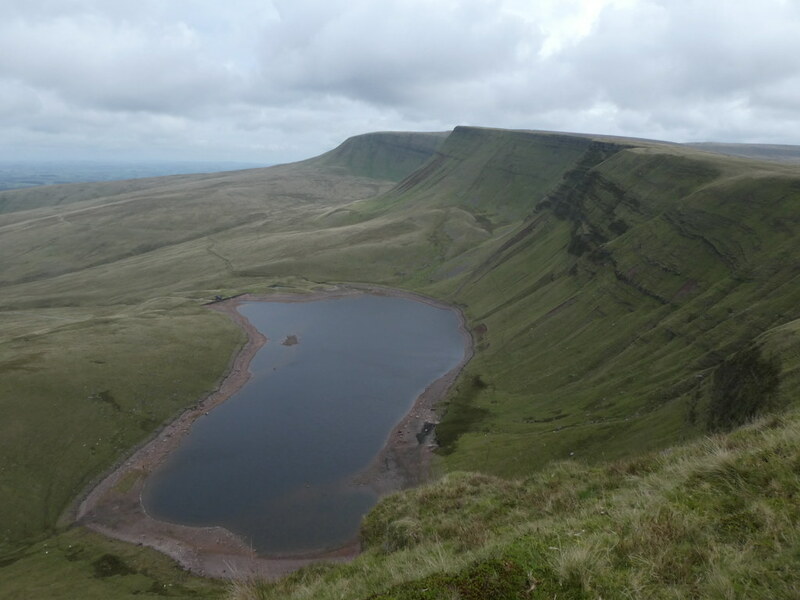 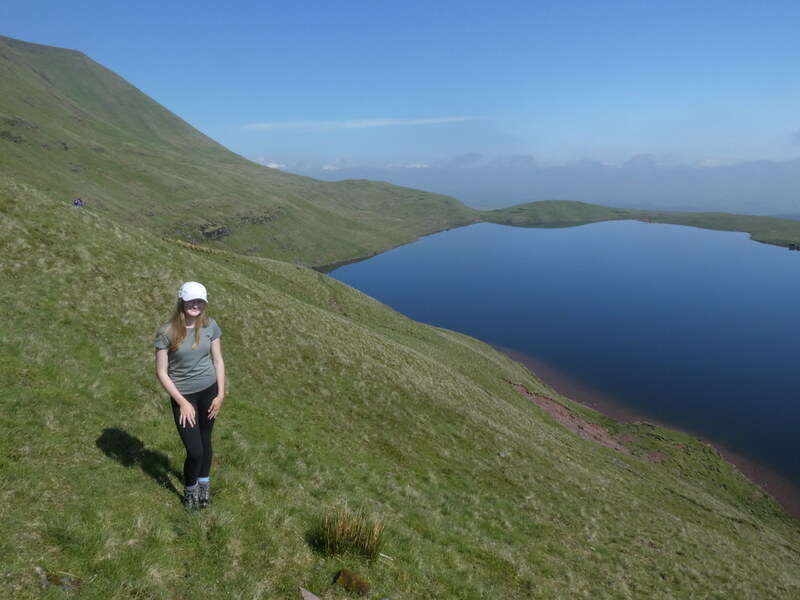 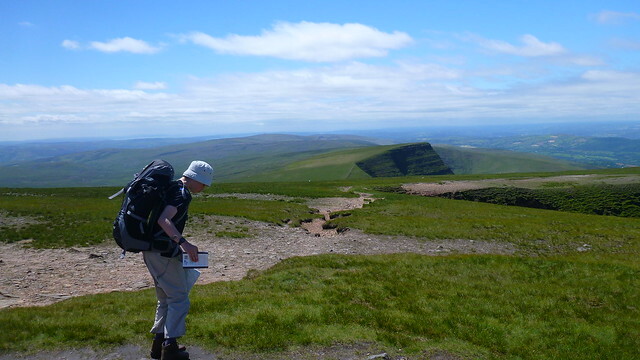 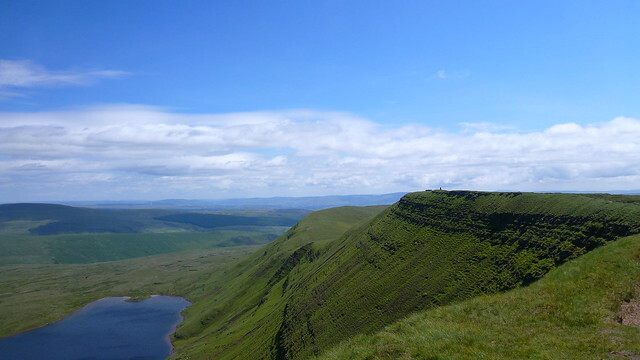 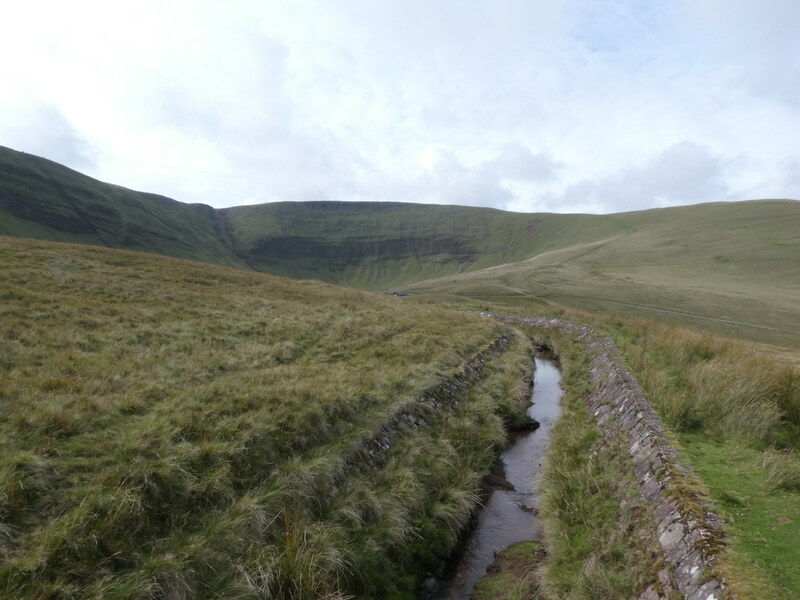 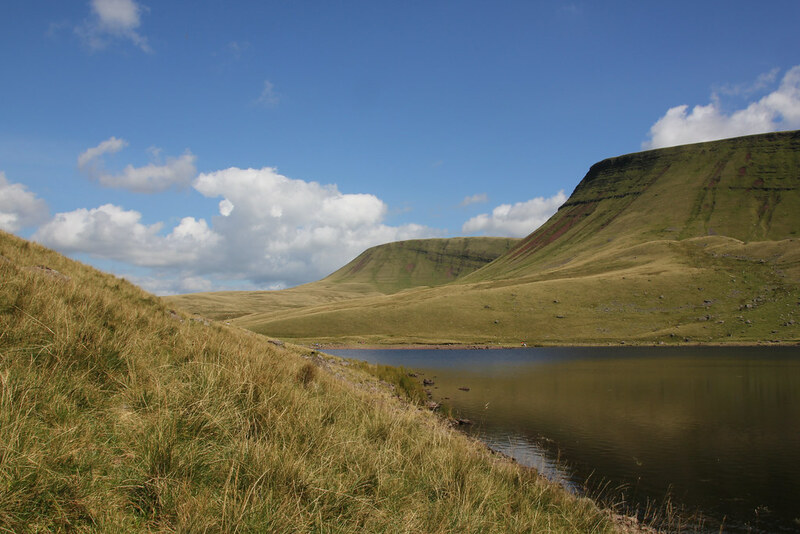 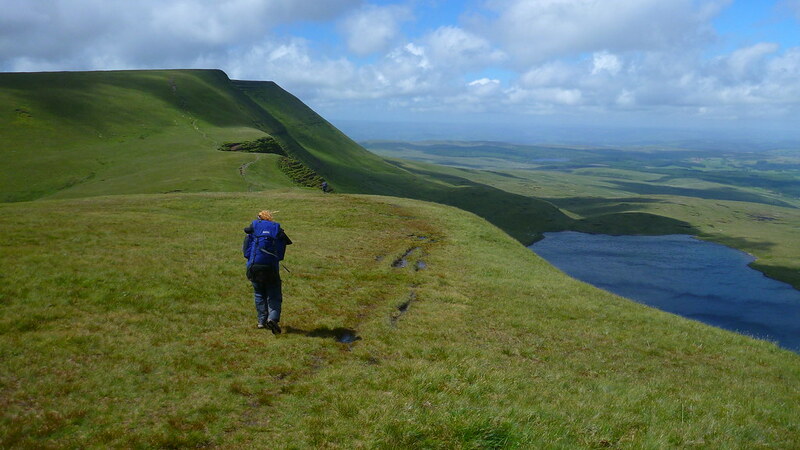 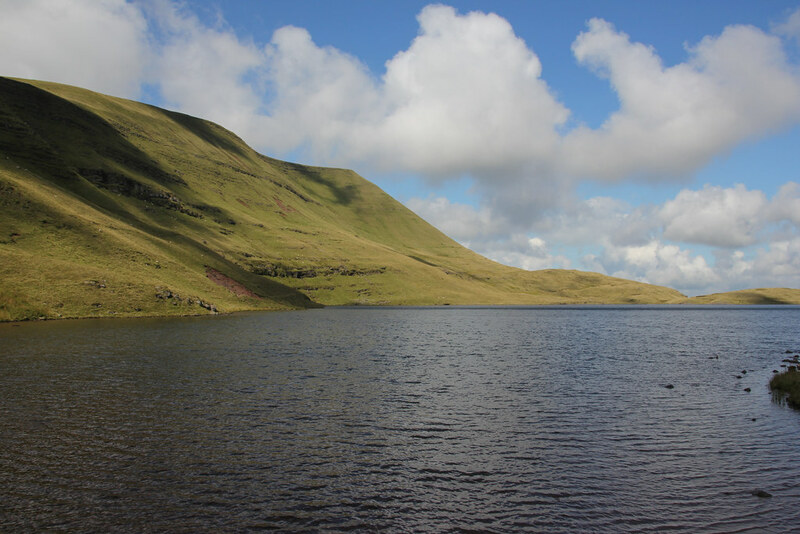 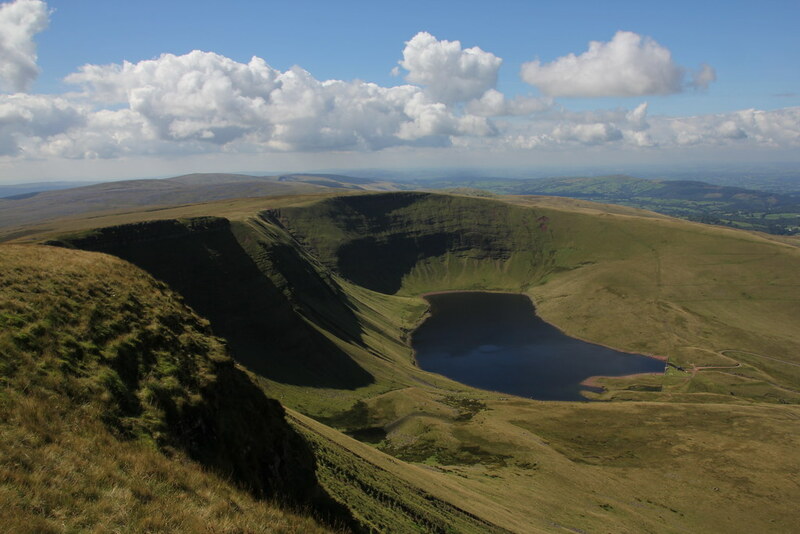 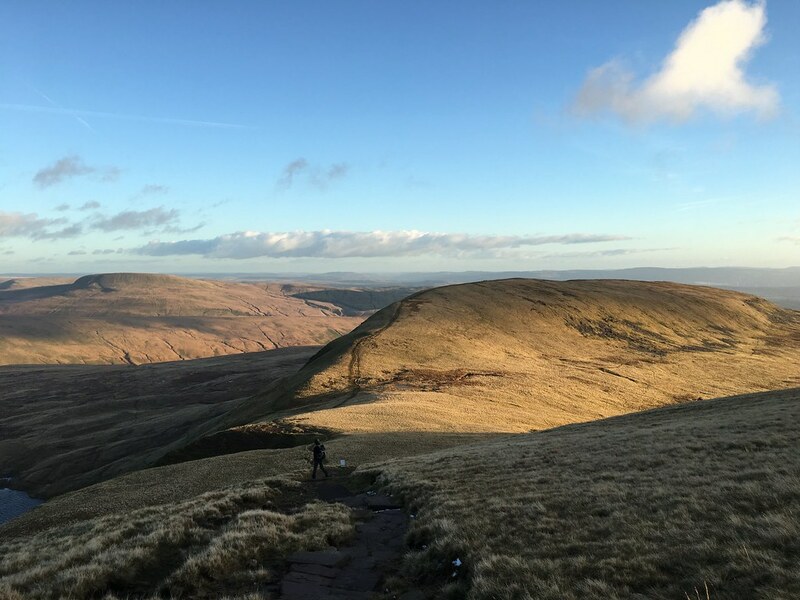 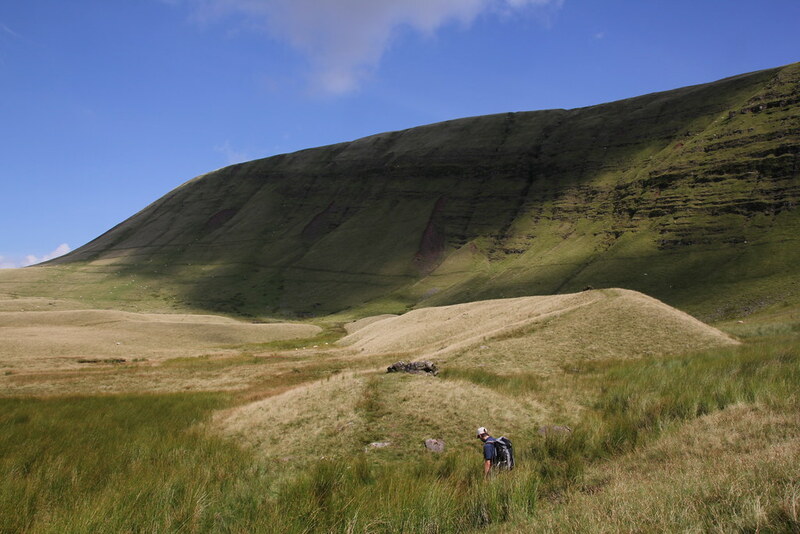 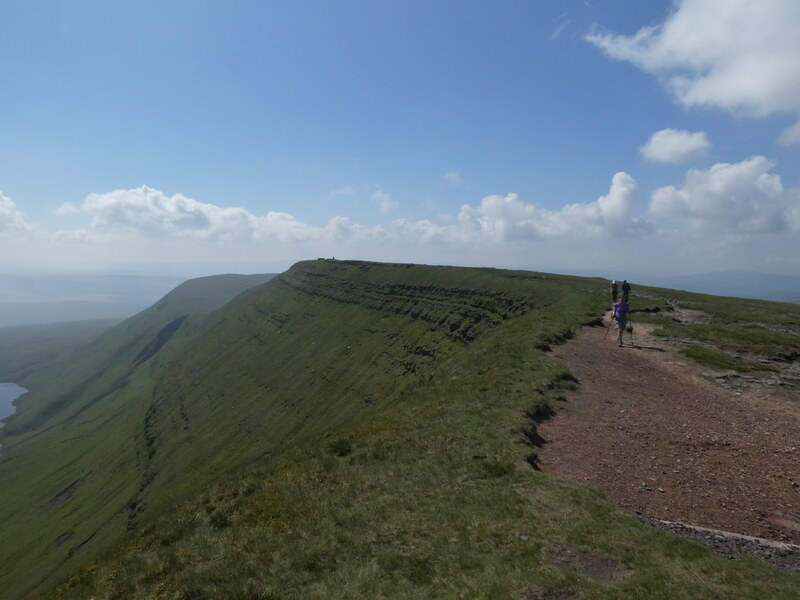 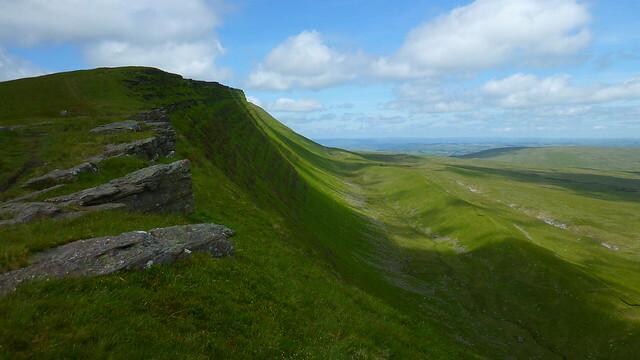 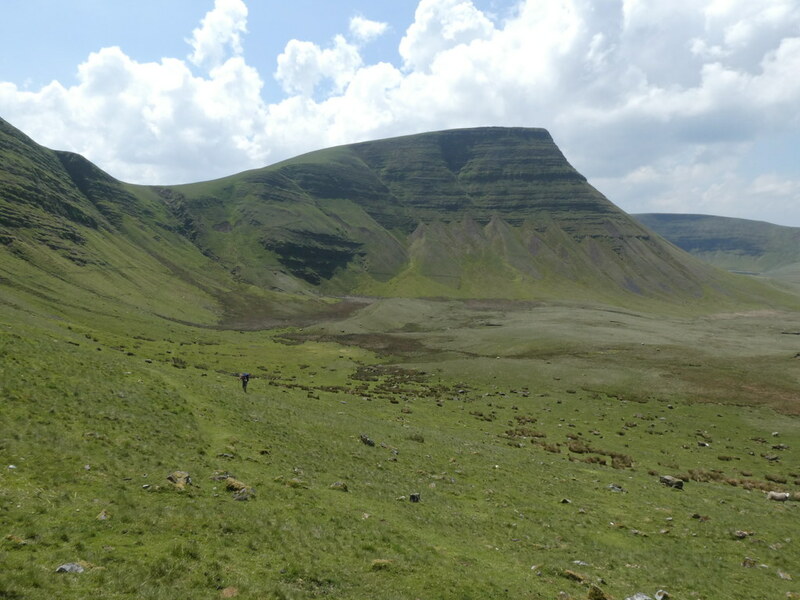 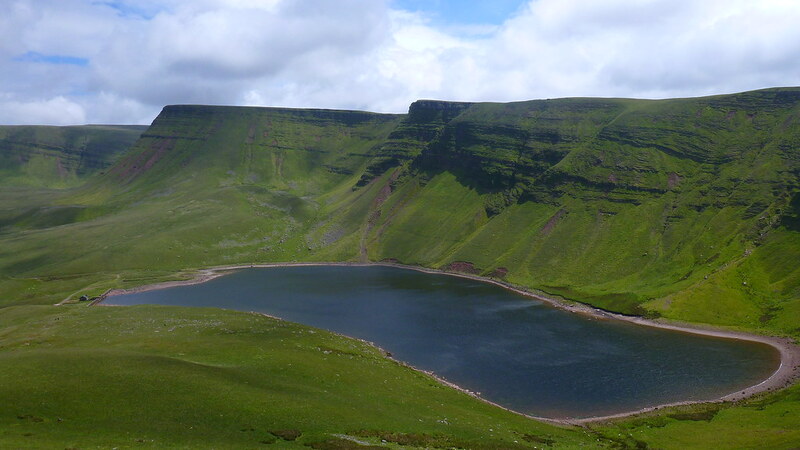 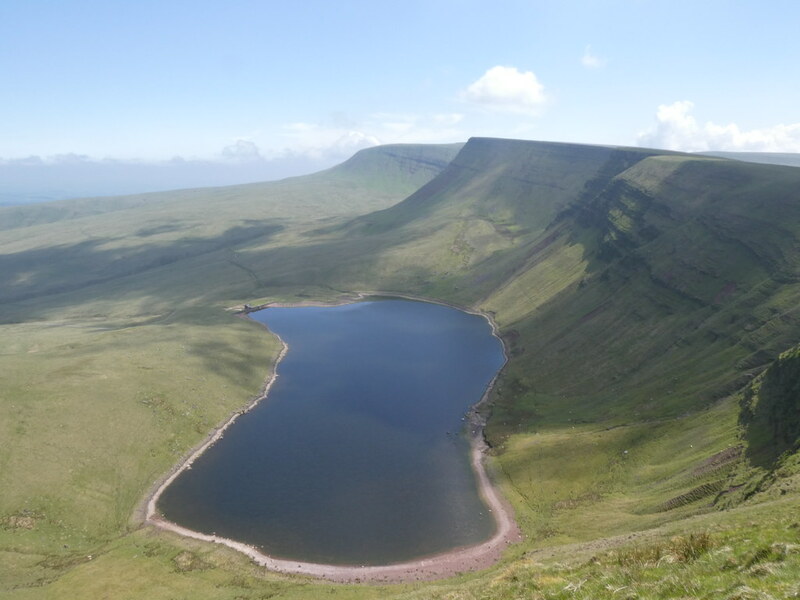 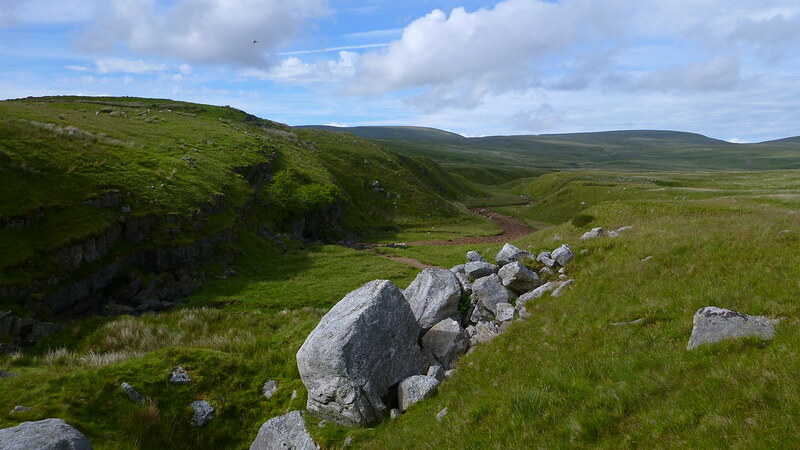 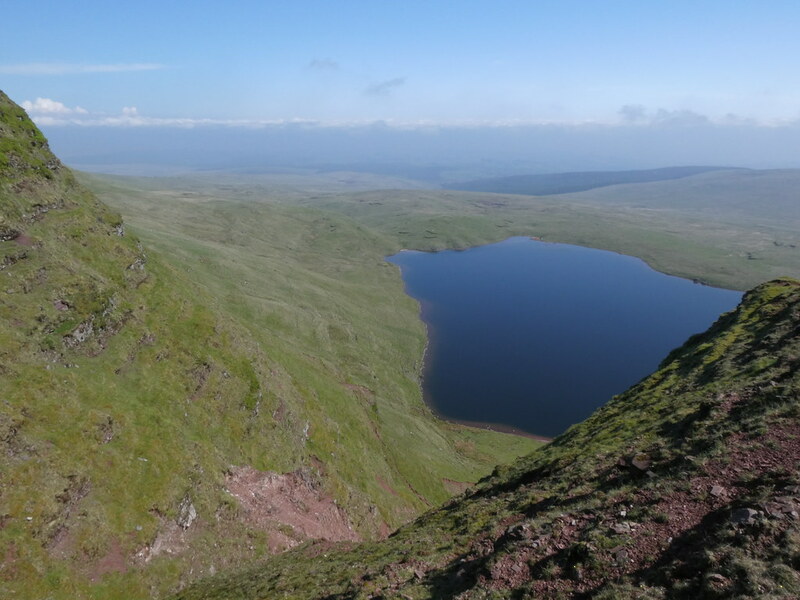 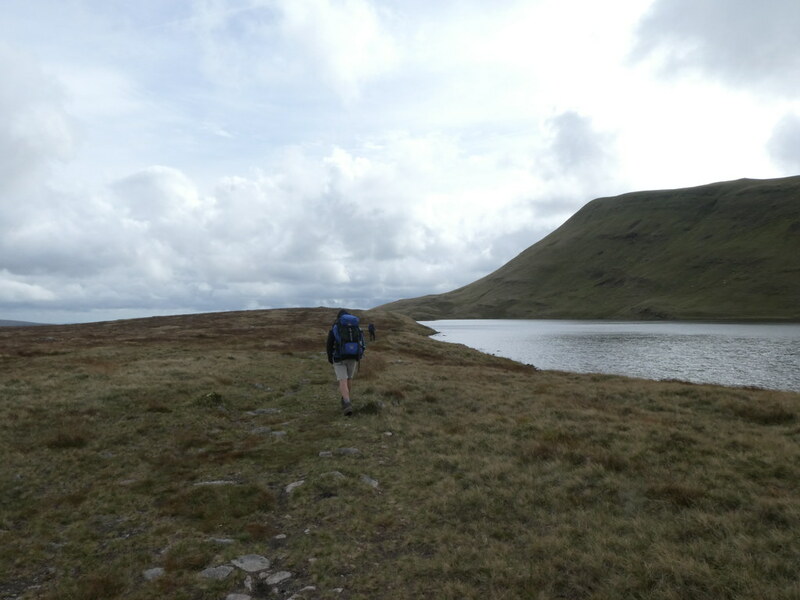 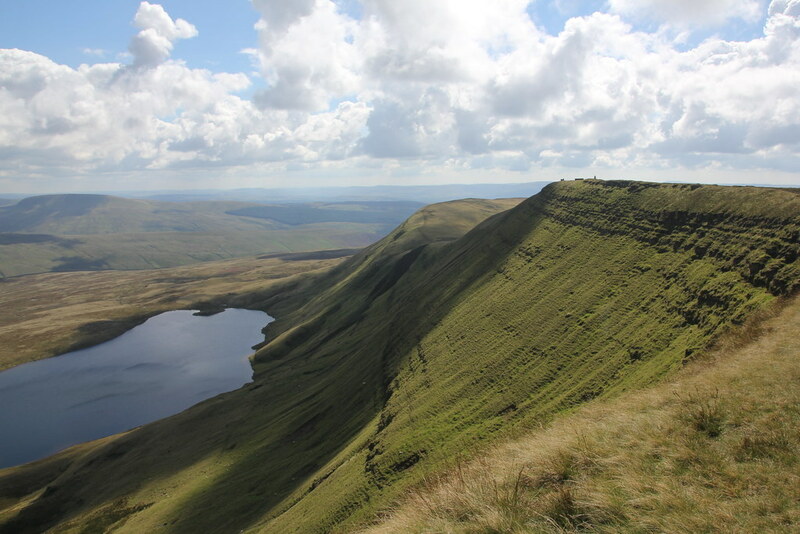 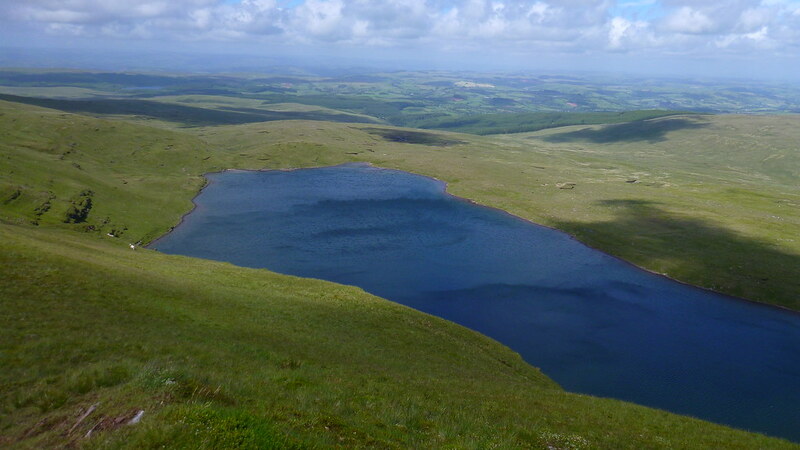 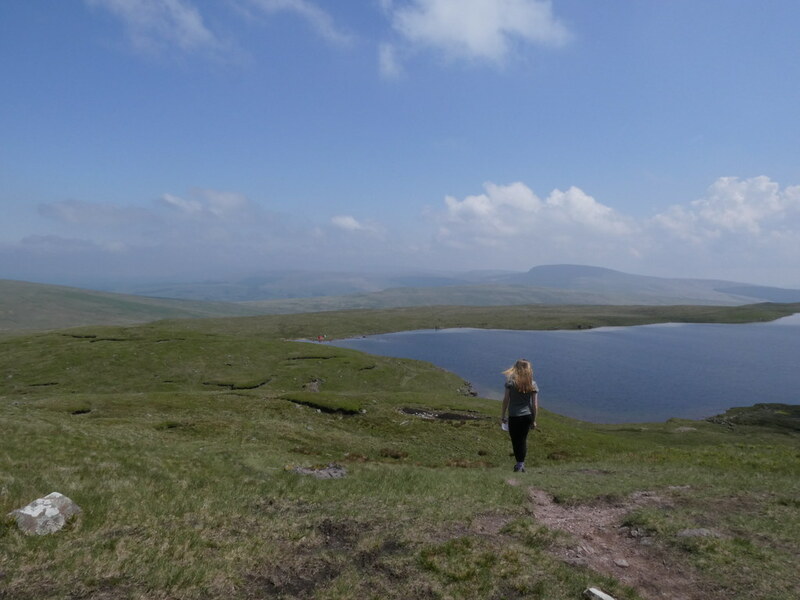 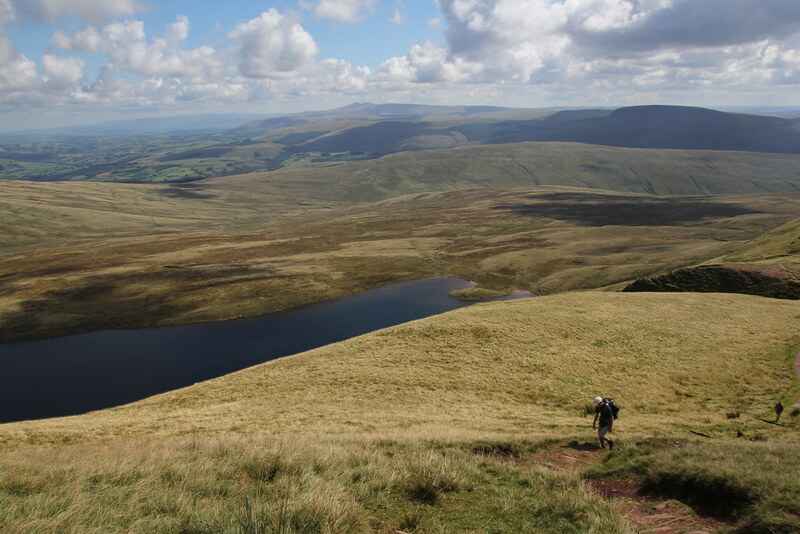 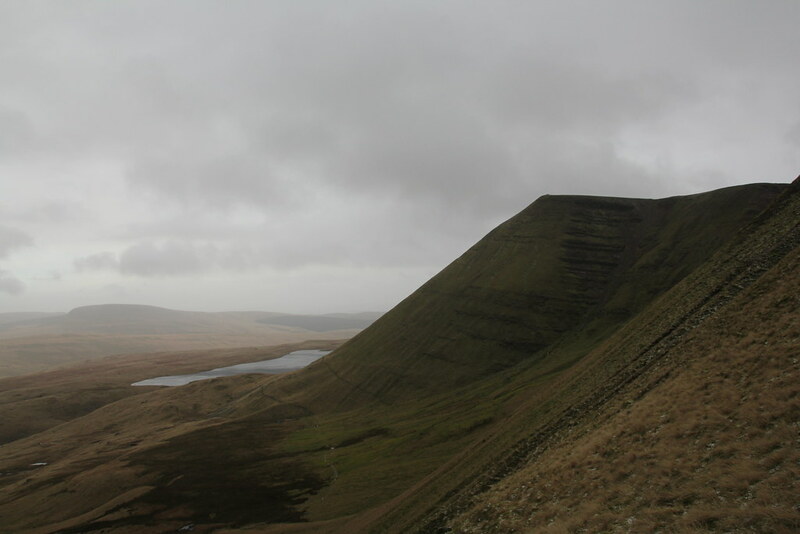 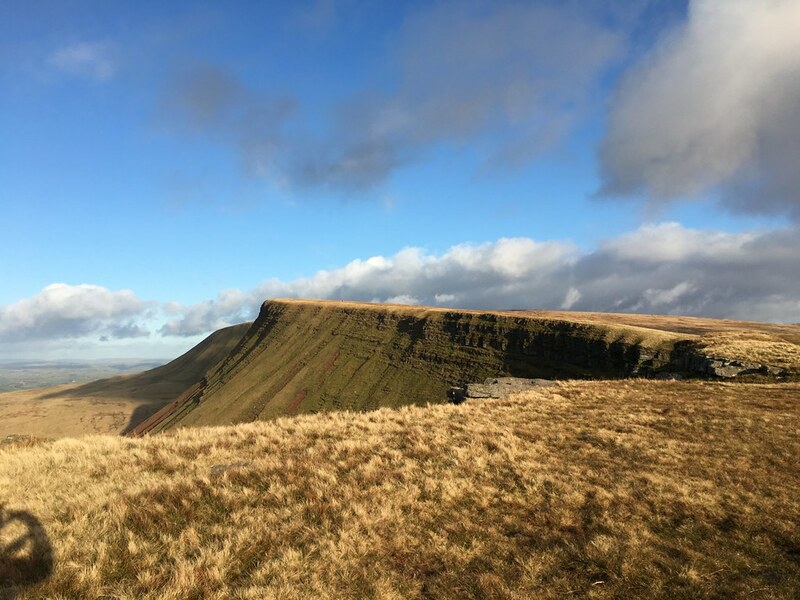 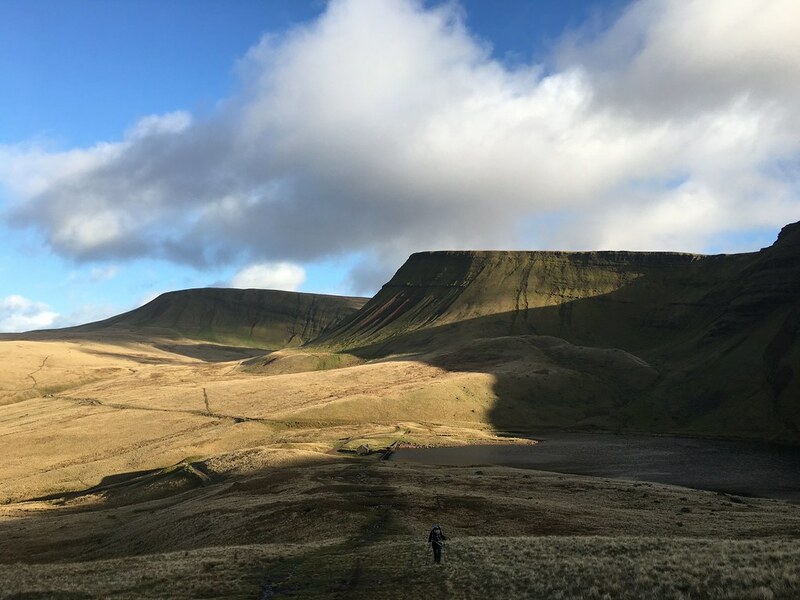 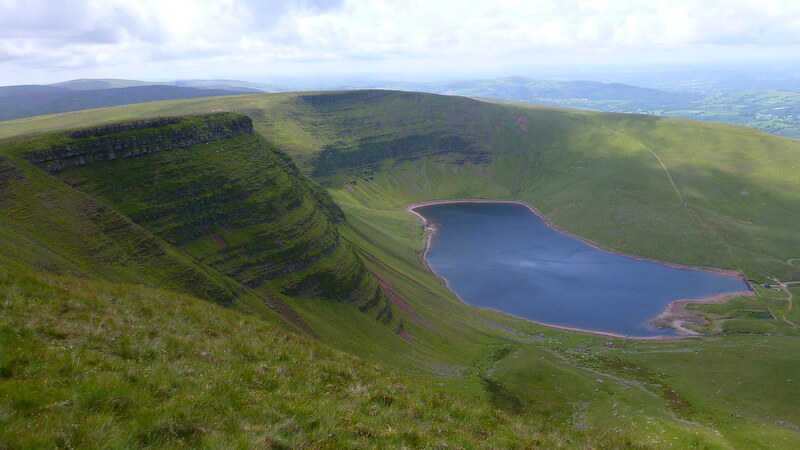 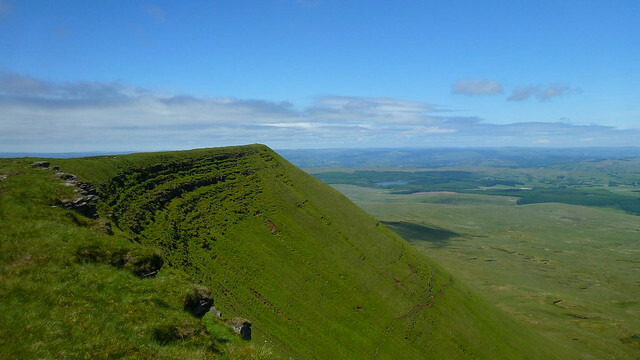 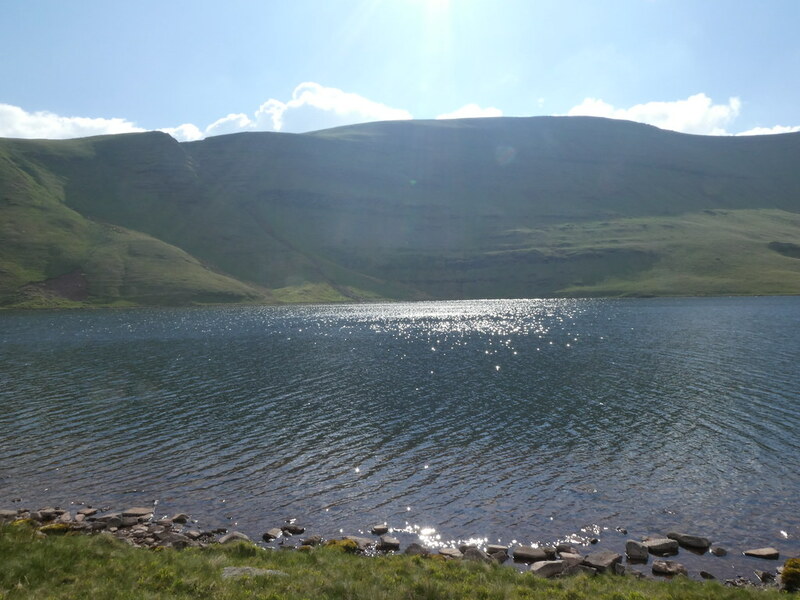 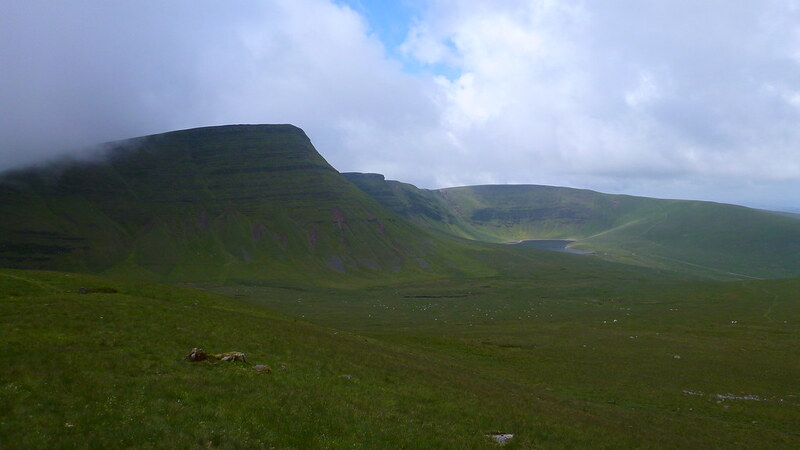 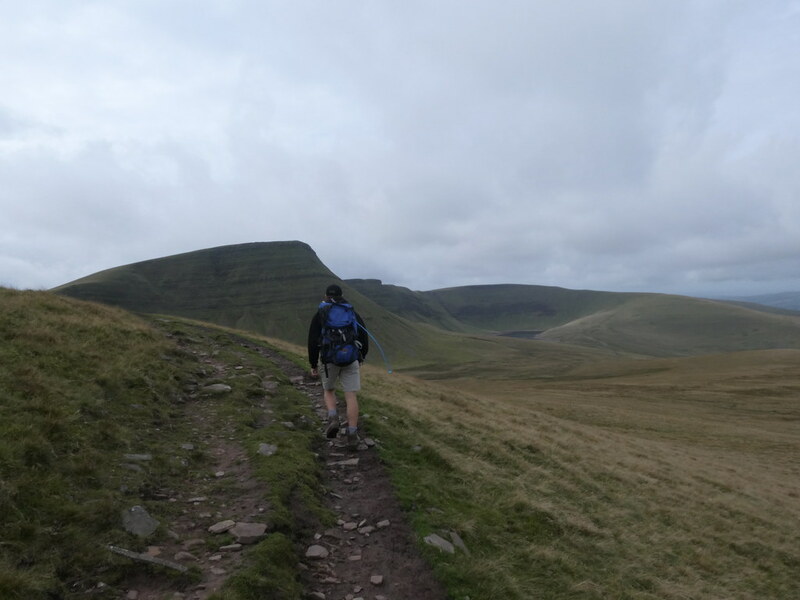 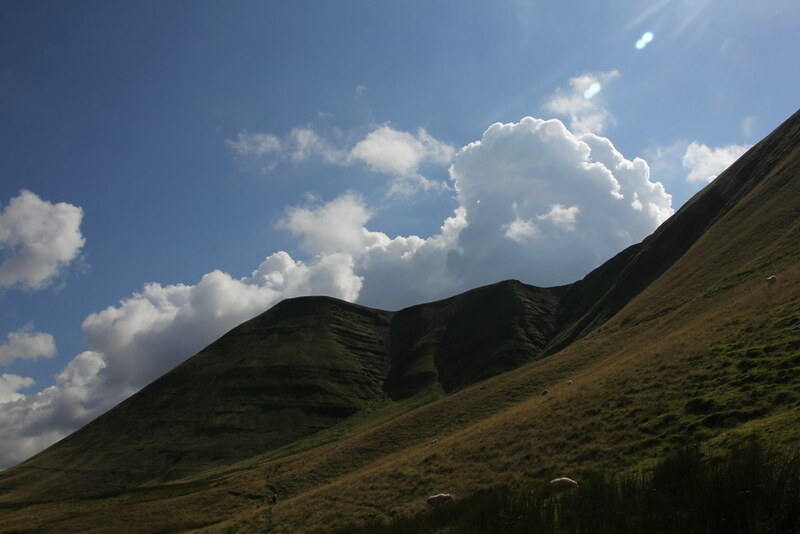 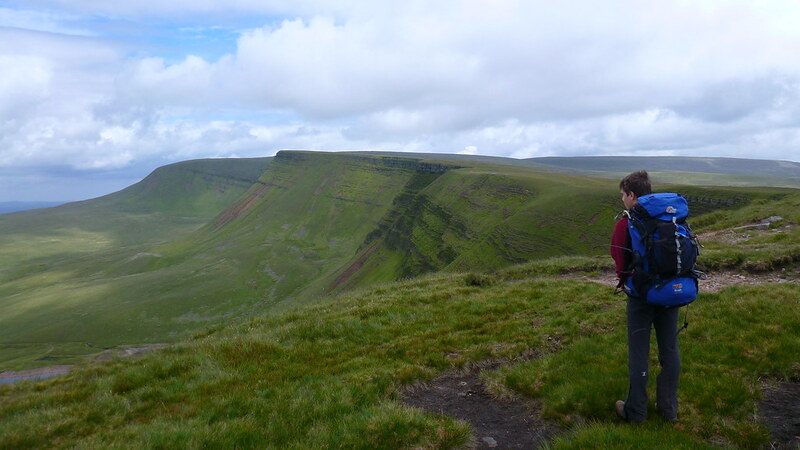 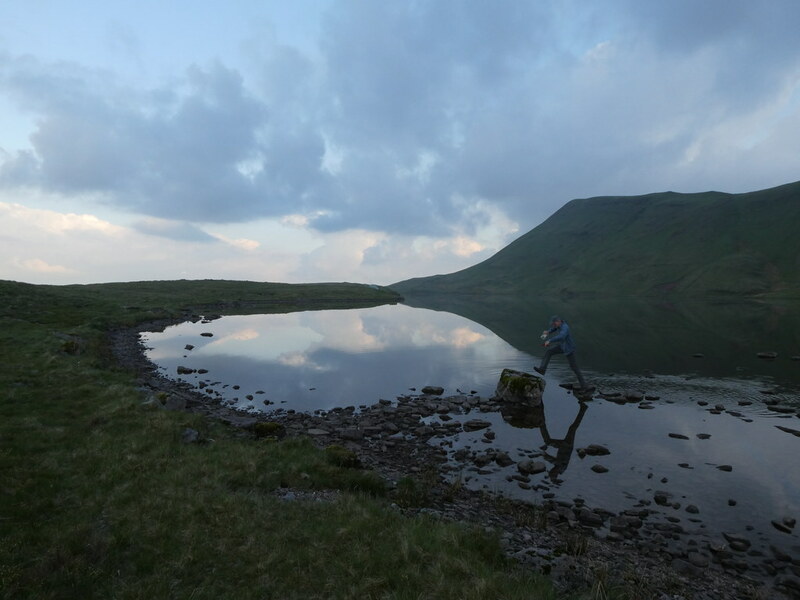 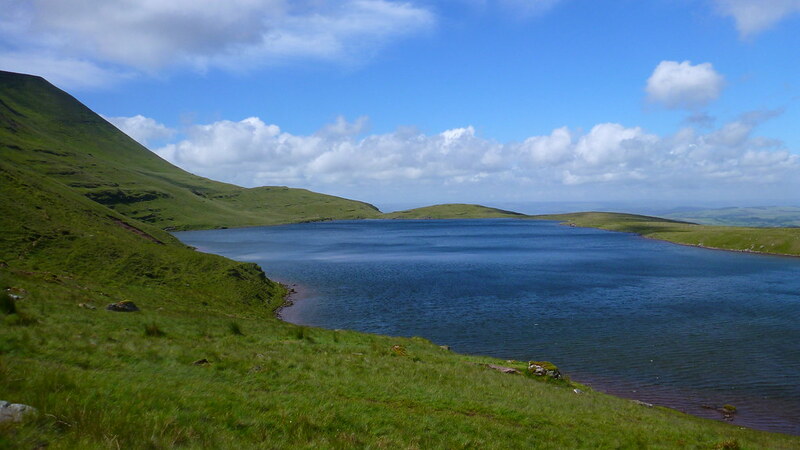 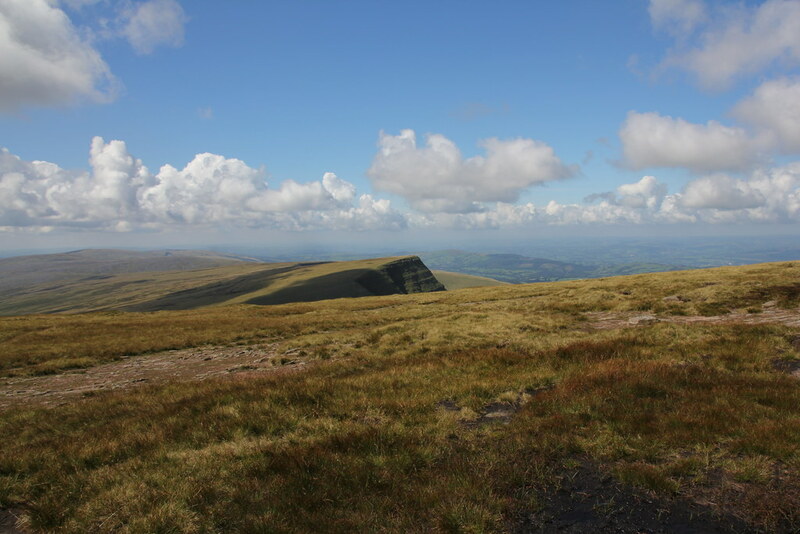 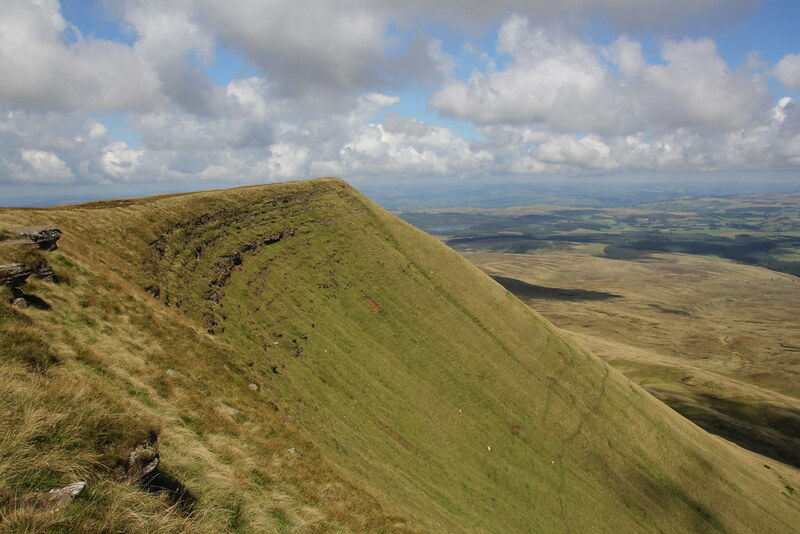 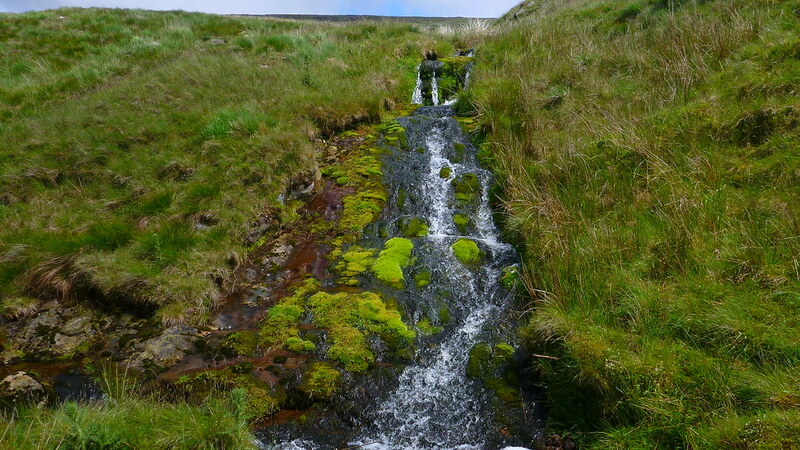 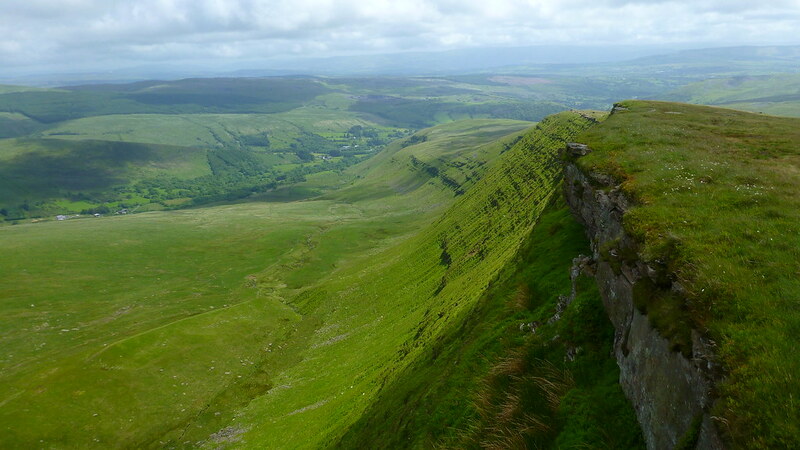 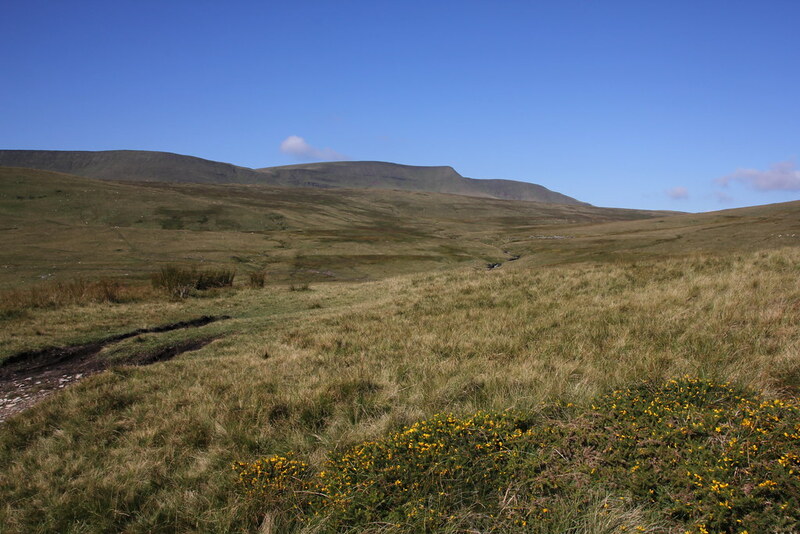 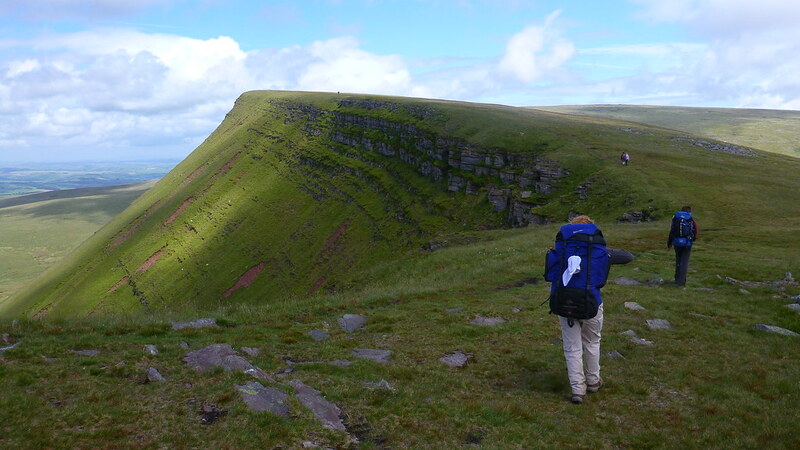 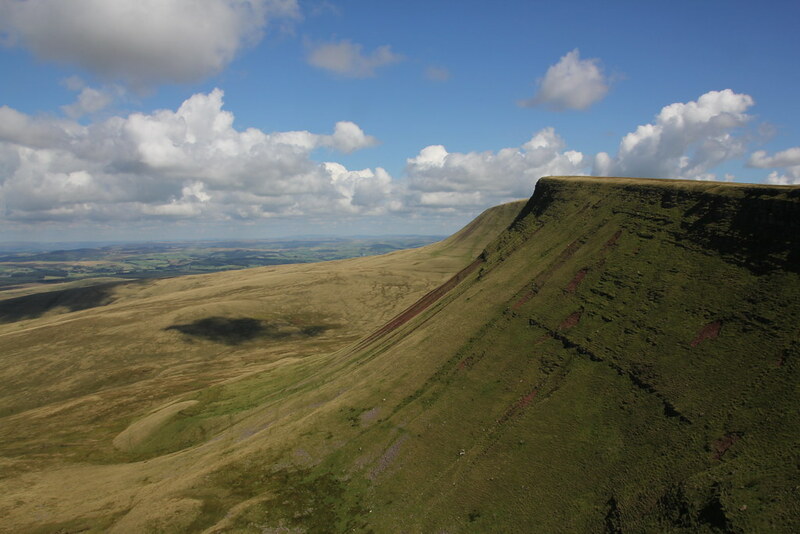 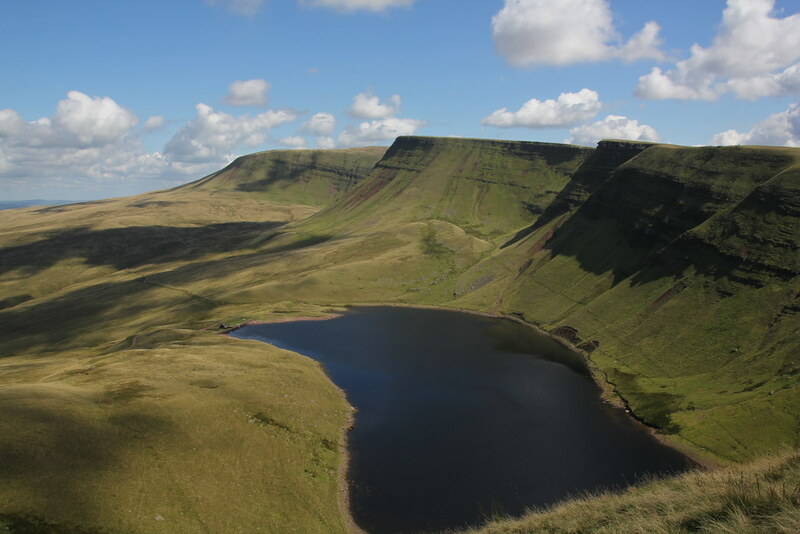 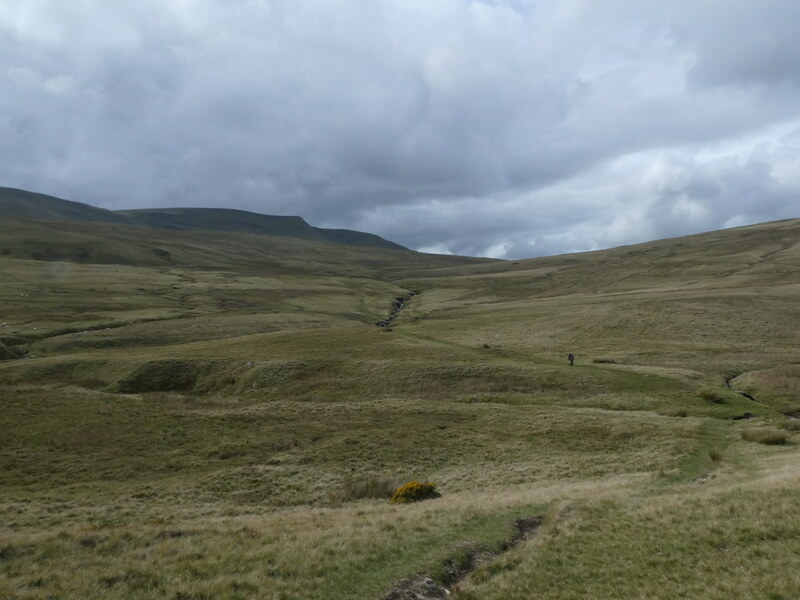 This is one of my favourite walks with the deep blue Lyn y Fan Fawr below. 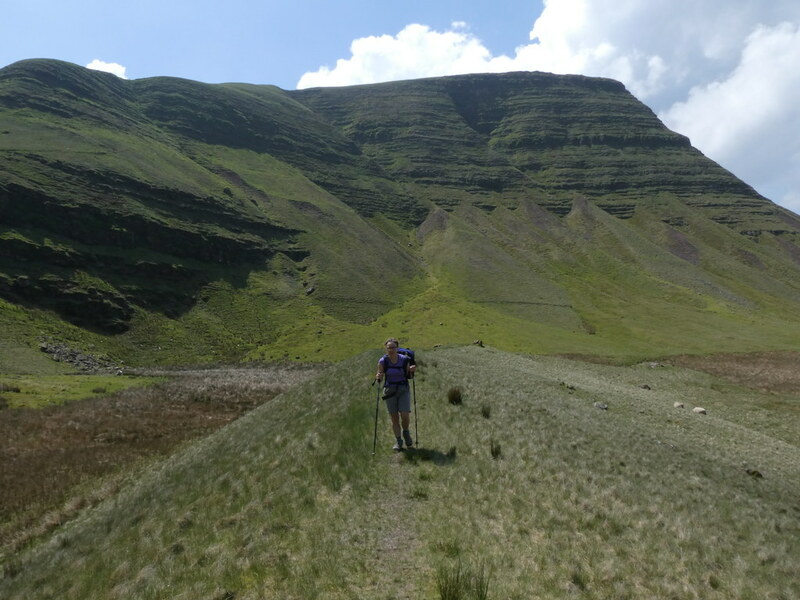 I was struggling a bit on the steep sections as I was carrying the majority of the weight but TJS was romping along and enjoying every minute. 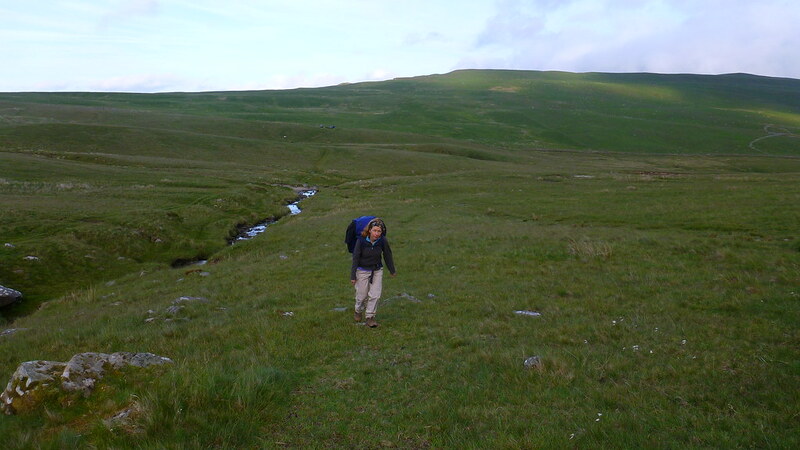 After the early struggles the terrain is very easy-going and perfect for backpacking. 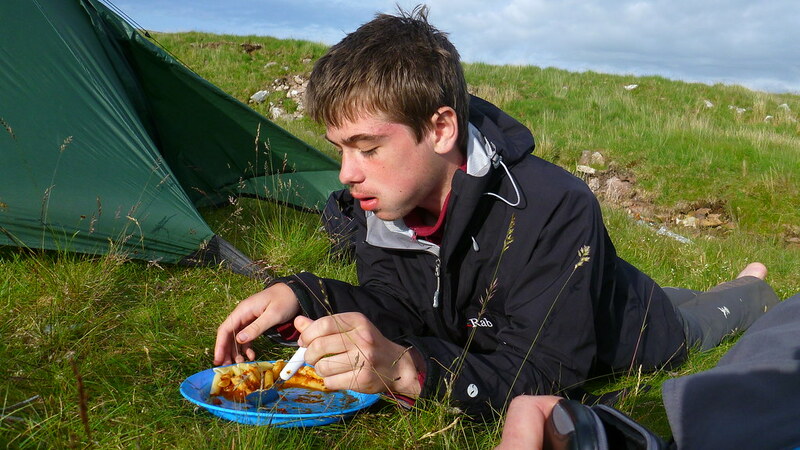 TJS suddenly hit “the wall” and his pace dropped markedly. 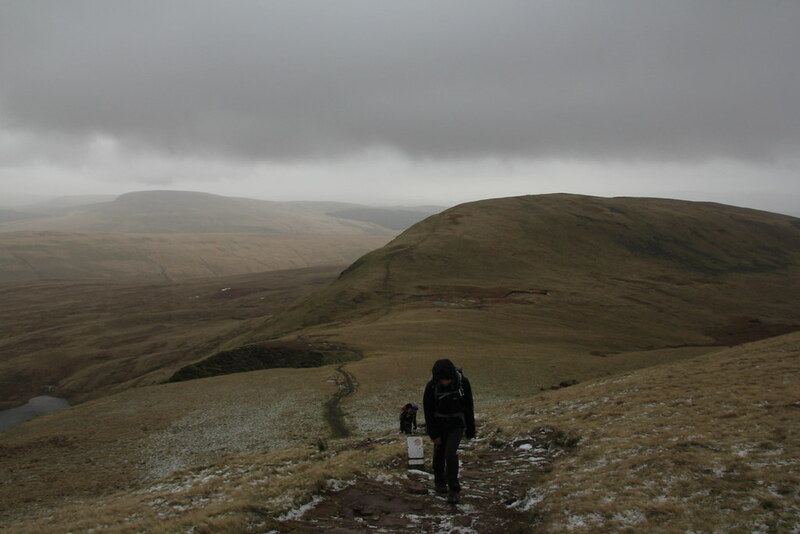 He’s not to used to carrying a heavy sack and he was struggling. 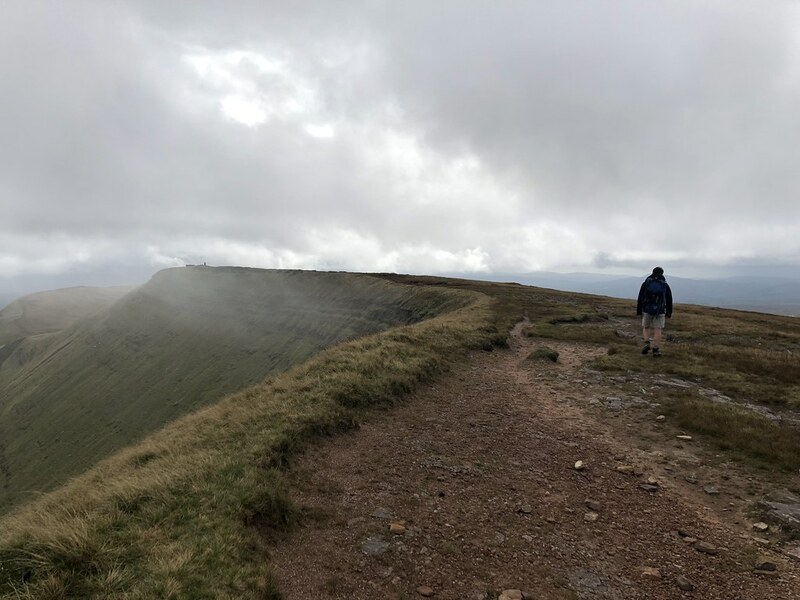 This unfortunately coincided with the cloud starting to close in and the summit is not a place to practice navigation amongst its chaotic collection of pavements and rocks. 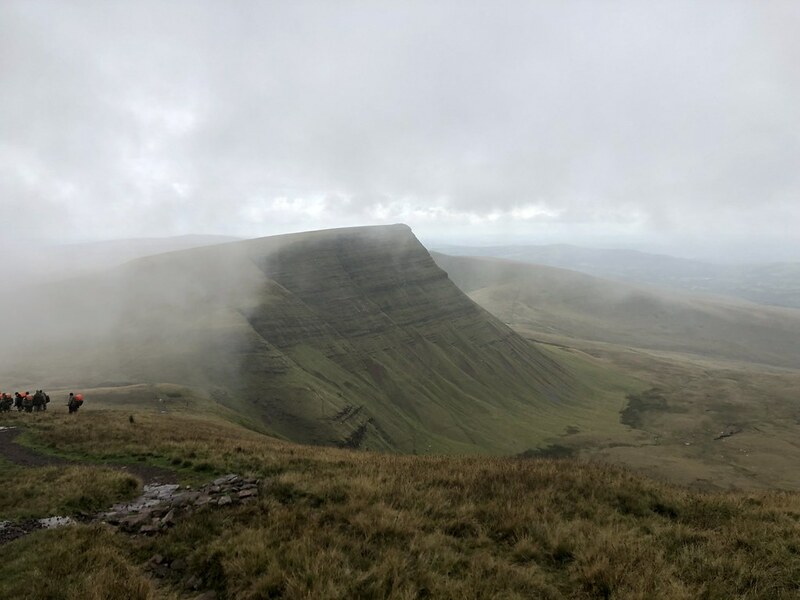 The “guide-book” route urged us to take in Foel Fraith, Garreg Lwyd and Cefn Carn Fadog but it was already 5pm and we were both tired and the mist was upon us. 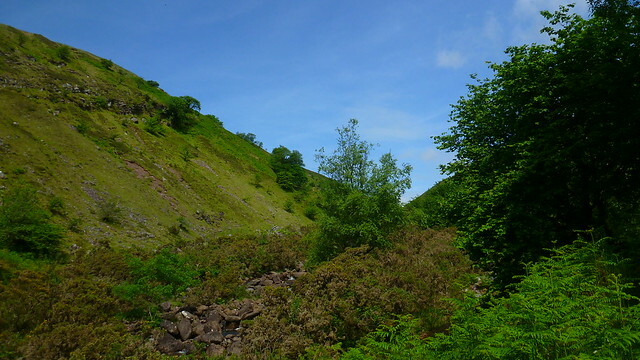 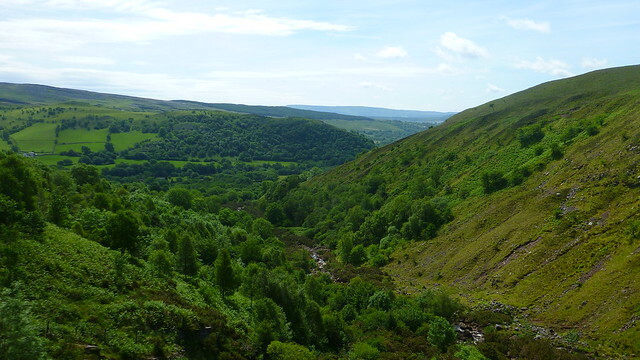 I took a line straight down towards the Afon Twrch through a tangle of boulders and small crags. 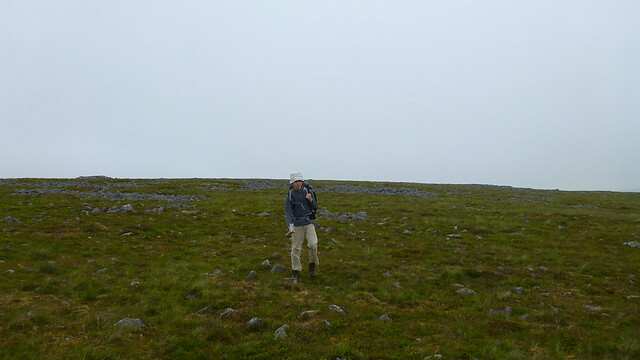 It would have been an entertaining route had the mist not been following us down. 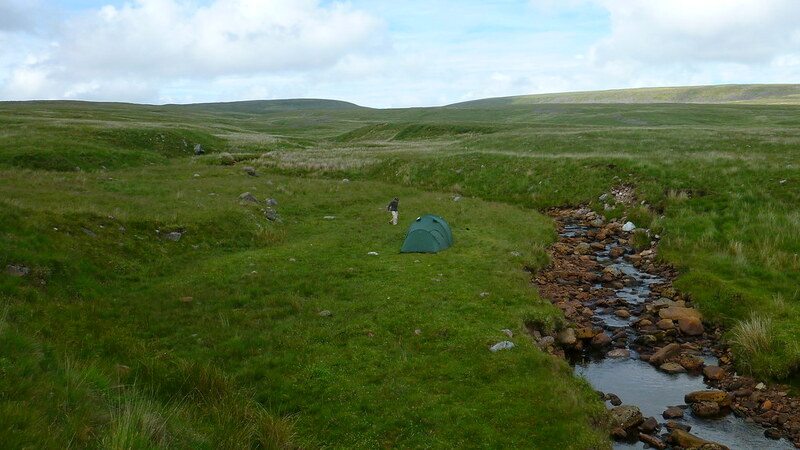 I was keen to try to least see the river to pick out a camp spot so had to encourage TJS to keep going. 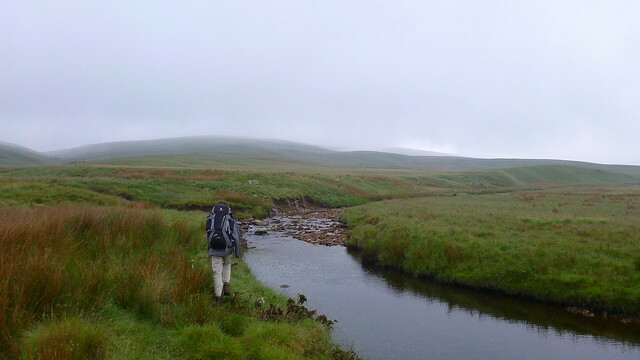 As we emerged from the mist we could see the river with several green patches on it’s banks that looked promising. 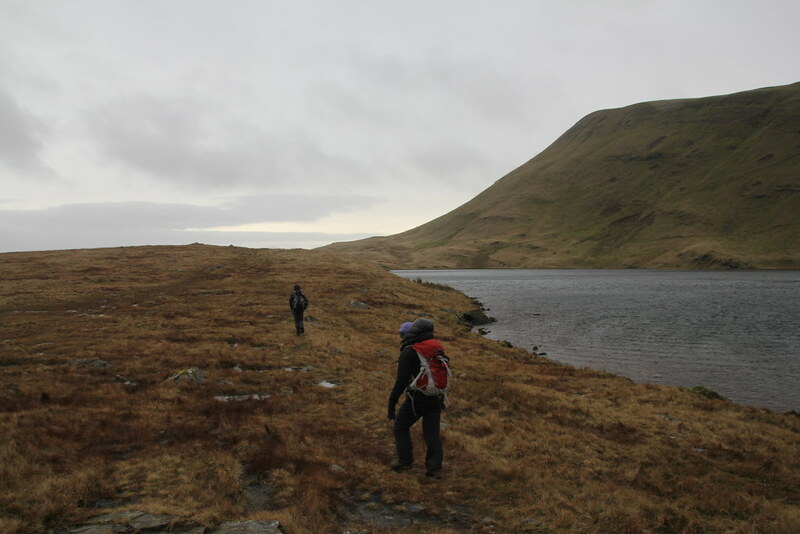 We just had to cross the last patch of tussocks to reach the bank. 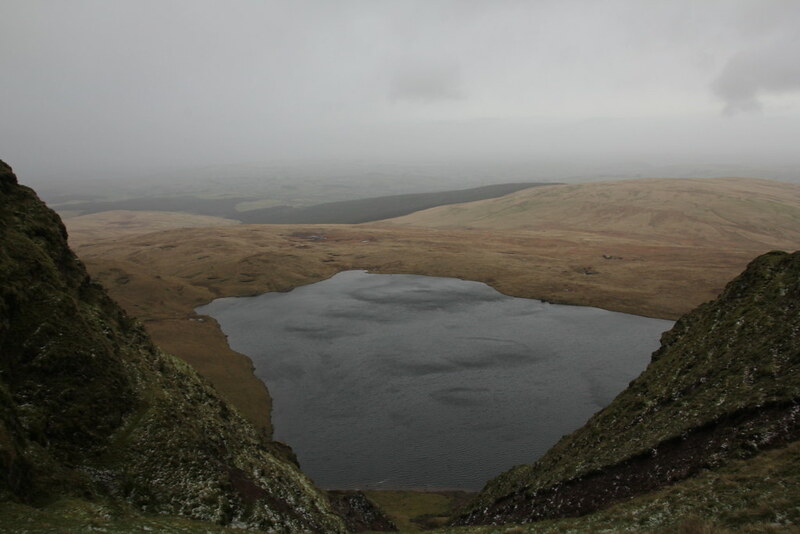 In time honoured Welsh mountain tradition this proved to be a cruel deception. 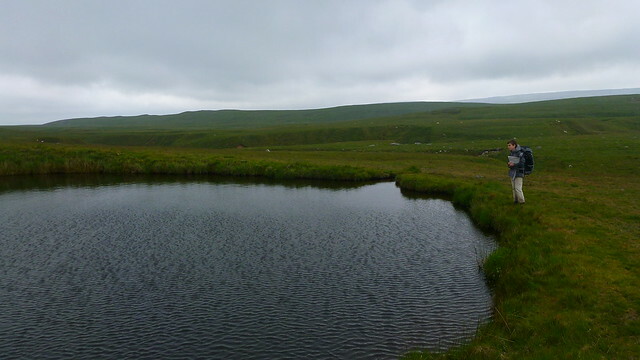 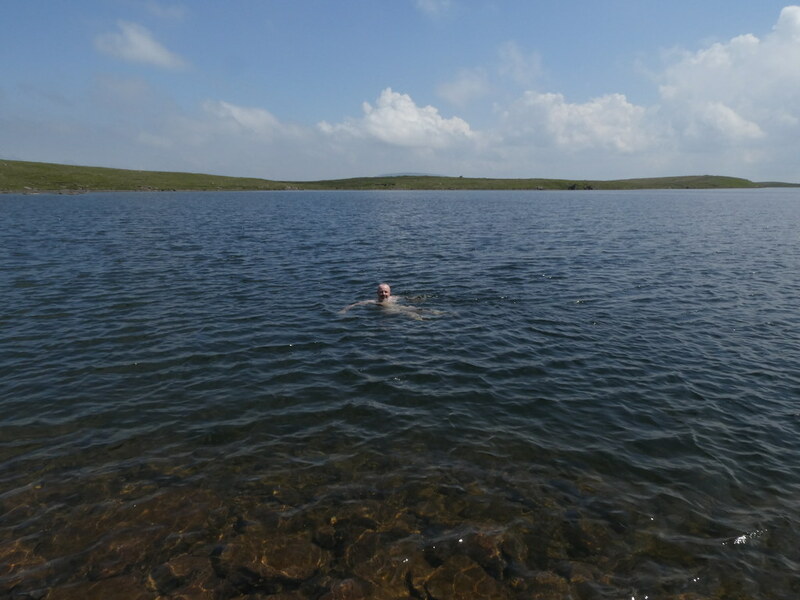 It was in fact a small lake with tussocks floating in it. 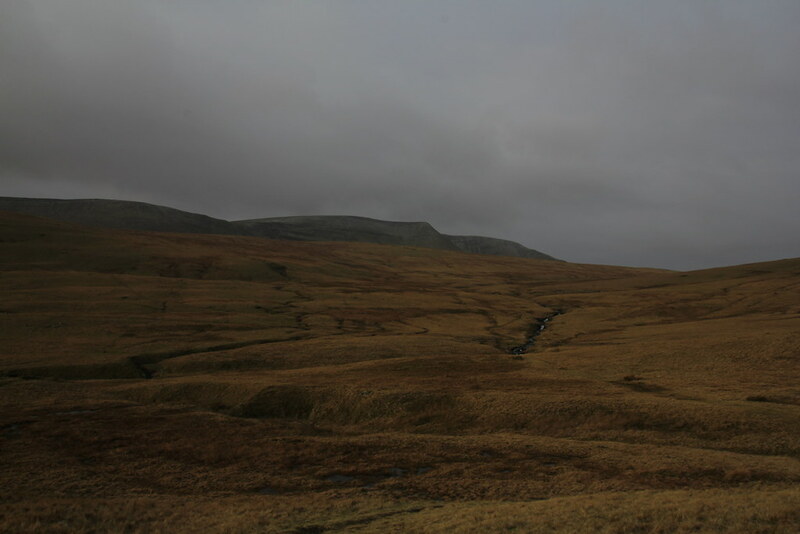 My trail-shoed feet, dry up to this point were wet within a few strides as were TJS in his boots. 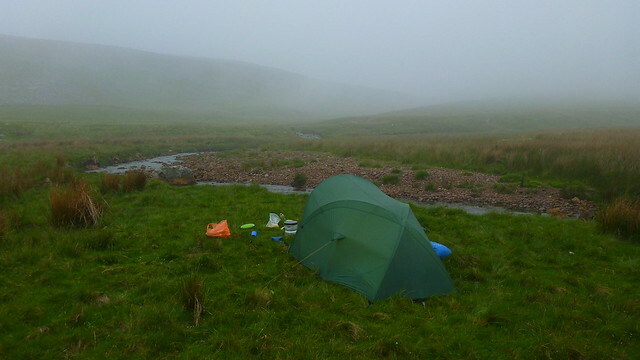 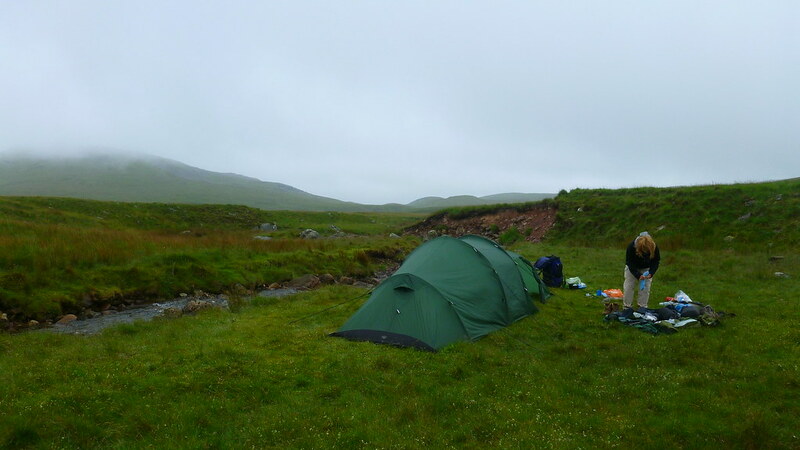 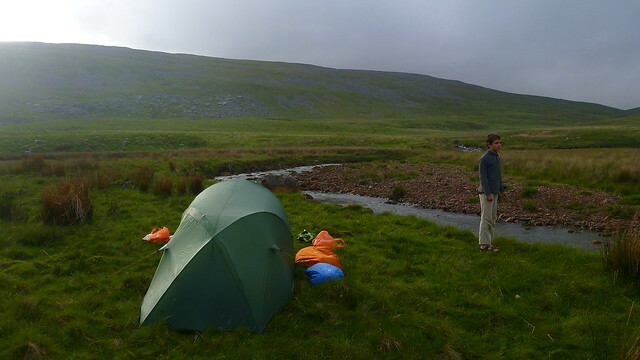 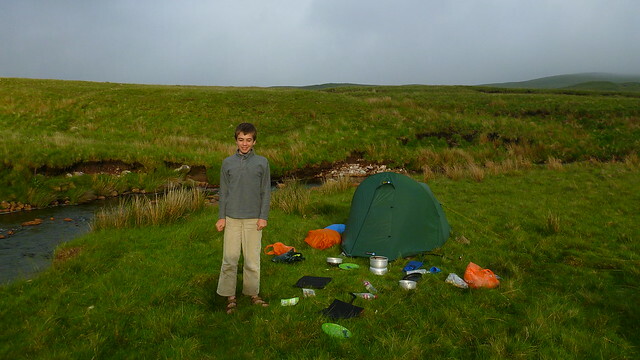 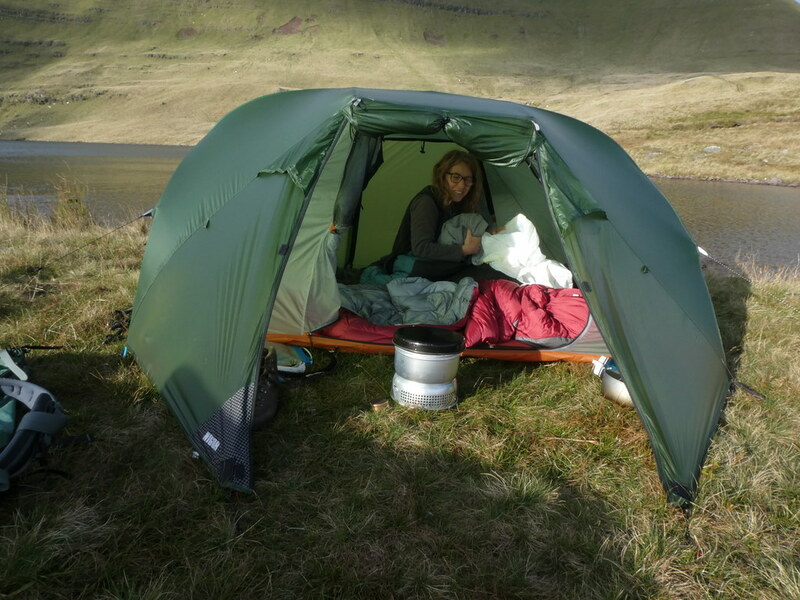 It drizzled while I pitched it, and that combined with a minor midge invasion forced me to cook tea in the tent. 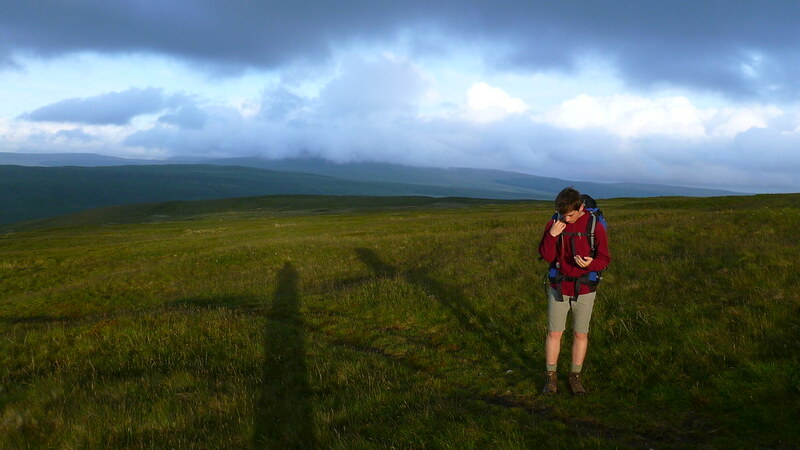 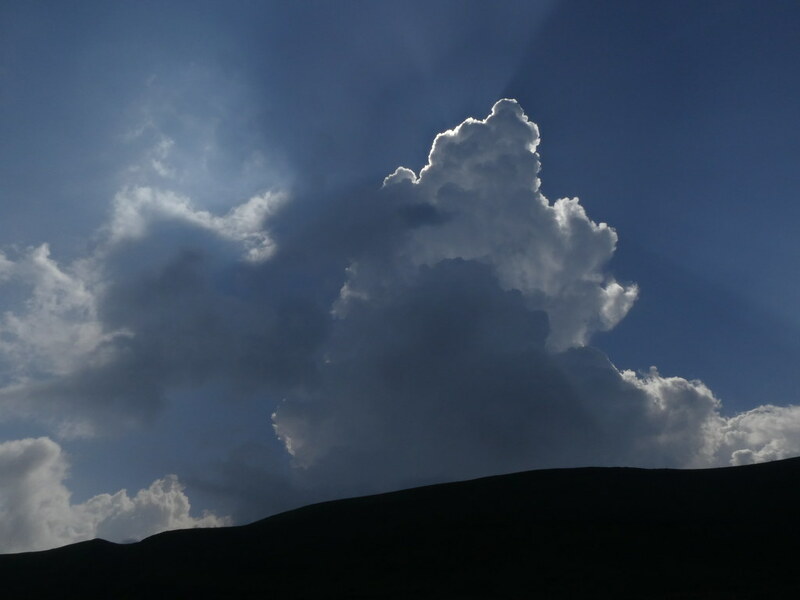 By the time we’d eaten the skies cleared a little and we got some shafts of late evening sunshine. 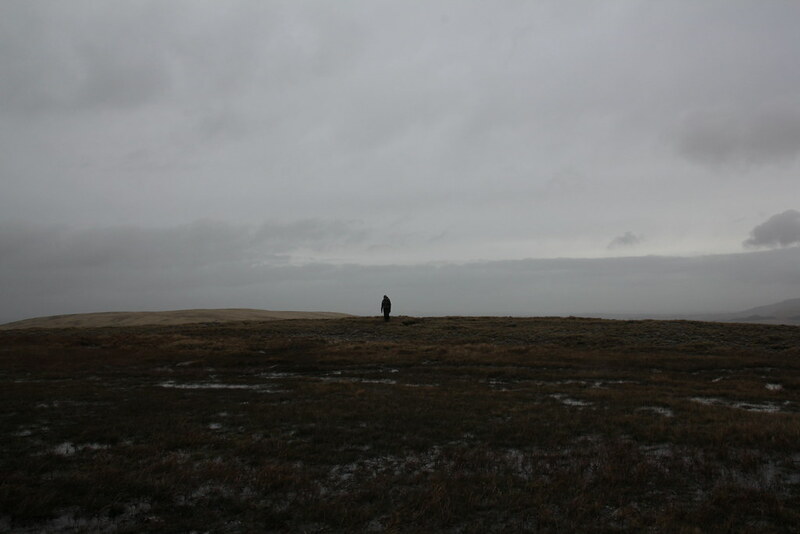 As quickly as the sun had appeared, it vanished again and the gloom descended. 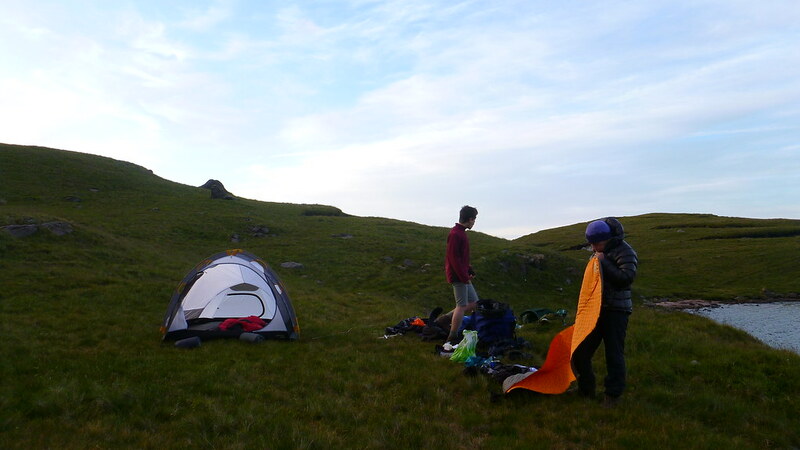 Tired yet satisfied after a long day we turned in. 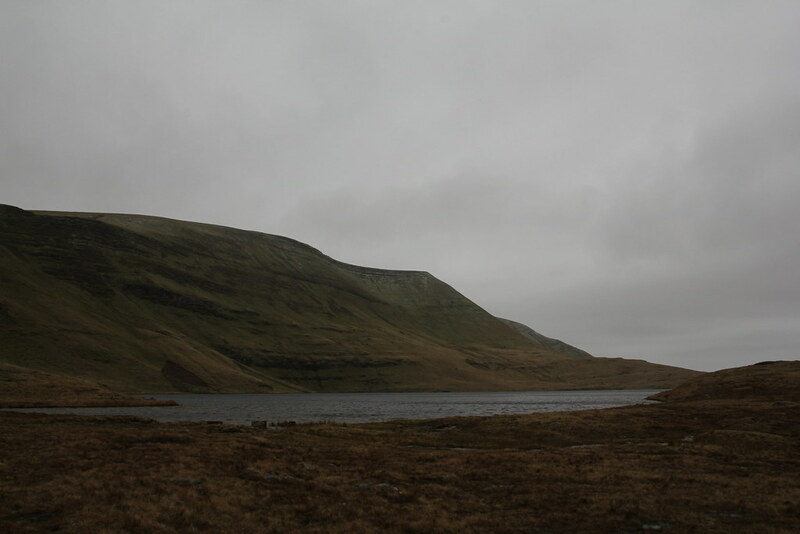 It’s hard to judge an area when your first visit is under a blanket of leaden grey cloud but I saw enough to make we certain I need to come back and see it again.